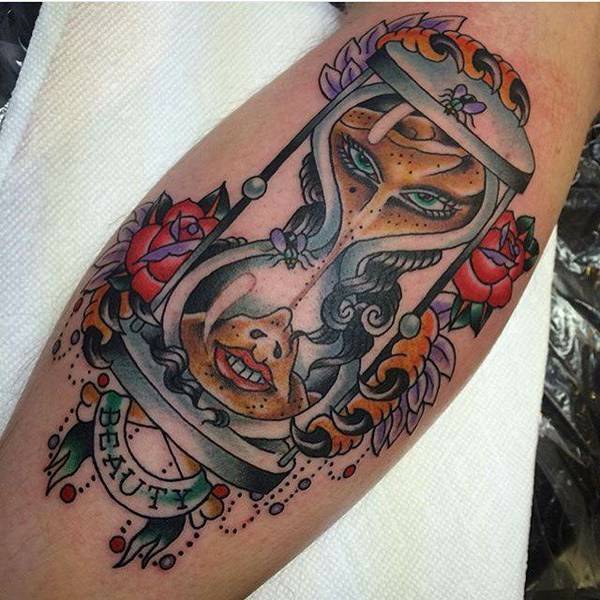 Hourglass tattoo is one of the trending and innovative designs. As much as the history behind the design is not well known; the meaning is however very clear. 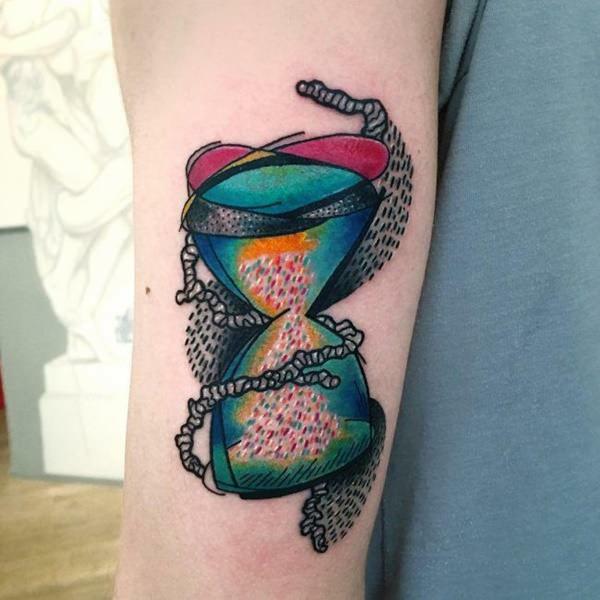 Hourglass tattoo designs represent the passage of time. To many historians, the two connected glasses with sand still seems a mystery. 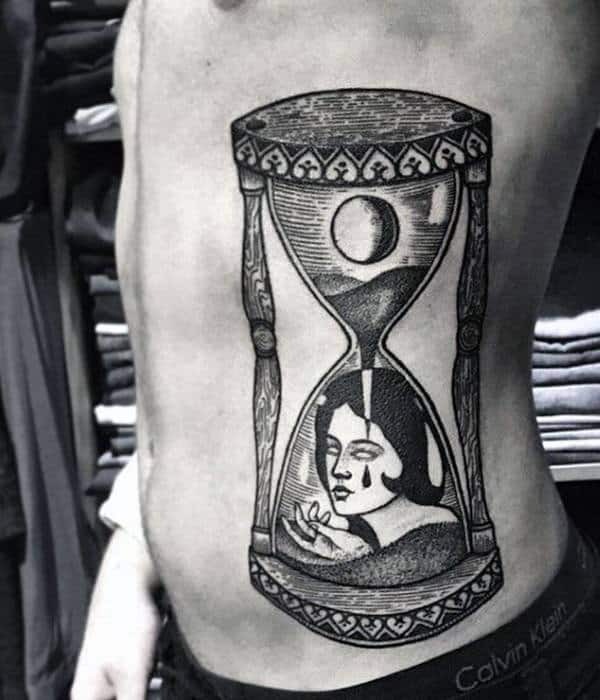 Wearing hourglass tattoo design is a perfect way of expressing the mysterious sides of a personality that one may lack the right words for expressing. 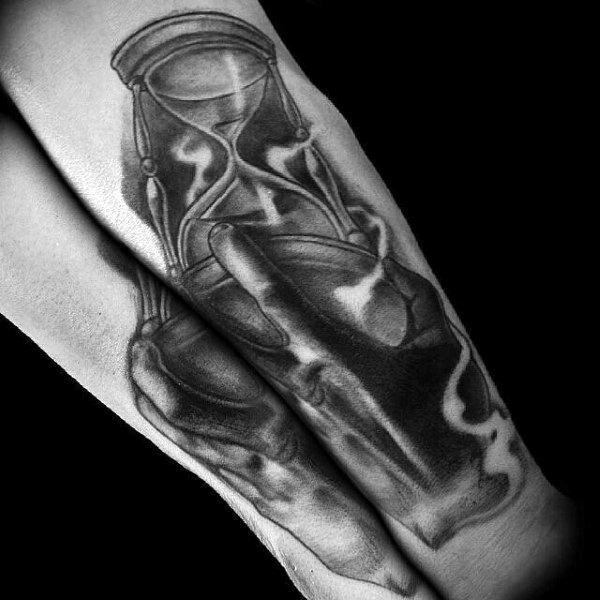 The symbol of the hourglass is found on many items in England and expresses different meanings. Below are some of the appealing designs that you can consider wearing. 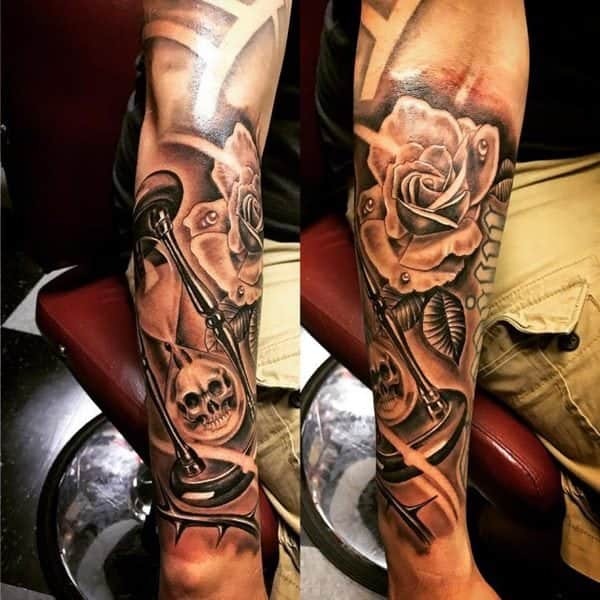 The tattoos are ideal for both men and women with the main difference being on inking style and choice of design. 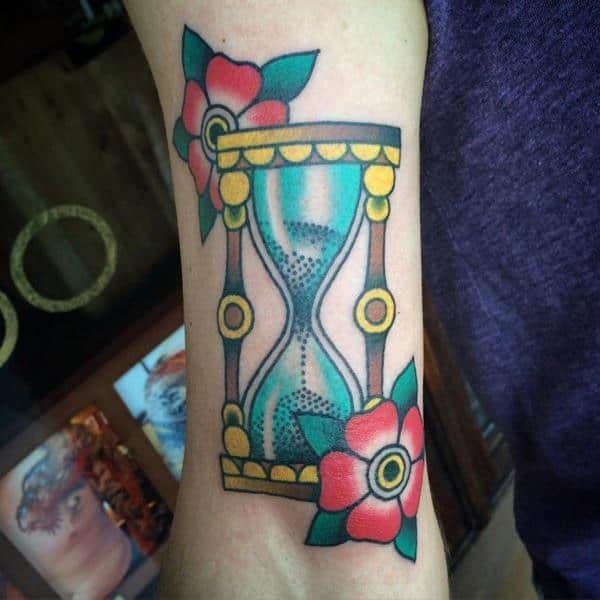 The meaning of hourglass tattoo designs stems mainly from the eternal passage of time. 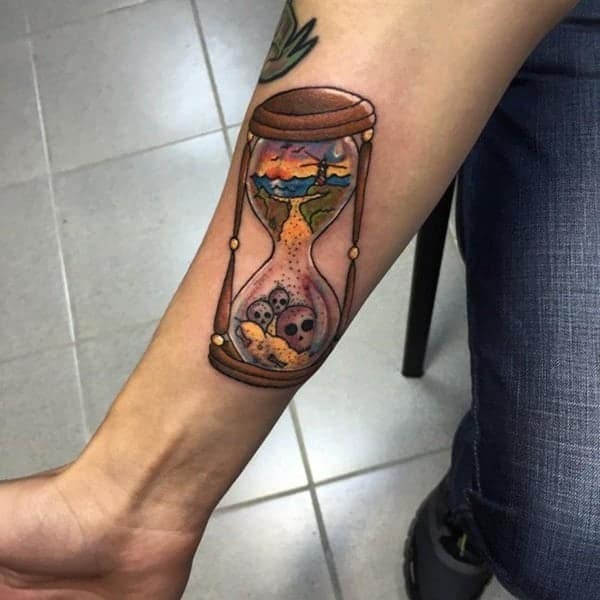 Having a look at the sand inside the hourglass evokes some realities that make one value life more. The design below looks magnificent with the dark shades used blending well with the wearer’s complexion. Wearing the design as shown below depicts several meanings. The two interconnected bulbs express the thin connection between life and death. 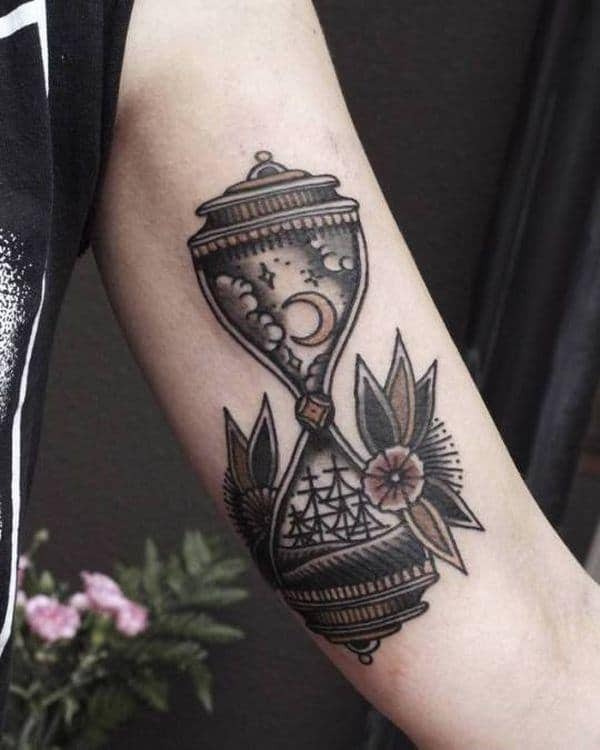 The huge strange hand reaching on the hourglass tattoo also expresses some connection with an external force. Wearing the tattoo has a way of enhancing the body features as shown in the tattoo design below. 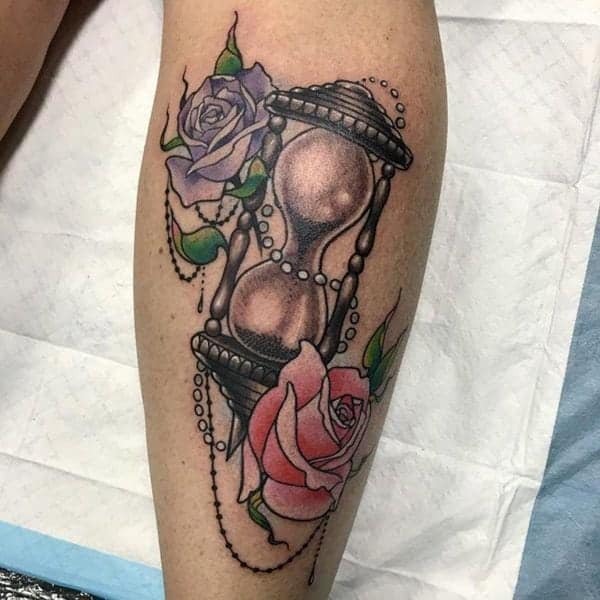 The colour combination is epic with the hourglass tattoo design expressing substantial complexity. 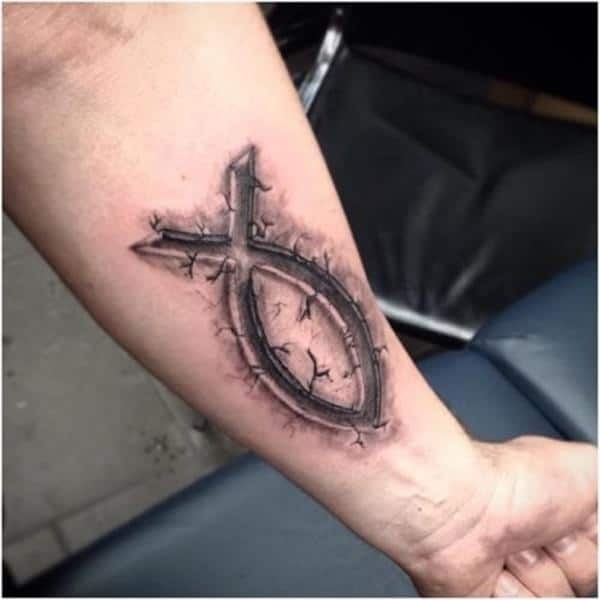 The use of three crosses with lightning splashing is an expression of eternal nature associated with the tattoo. 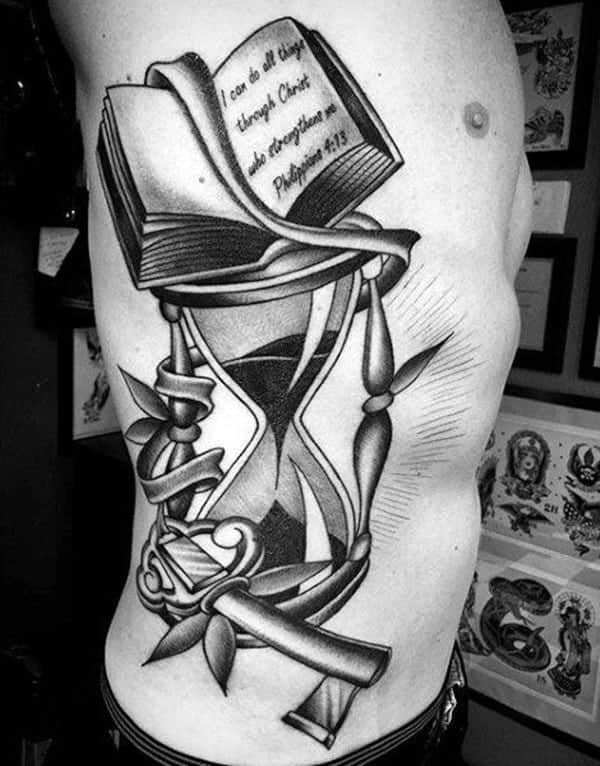 Another meaning associated with hourglass tattoo is derived from the direction in which the sand is flowing to. It’s an expression that in life we at times have to stop and take a different direction. The darker background is also used to enhance the overall outlook which is quite magnificent. 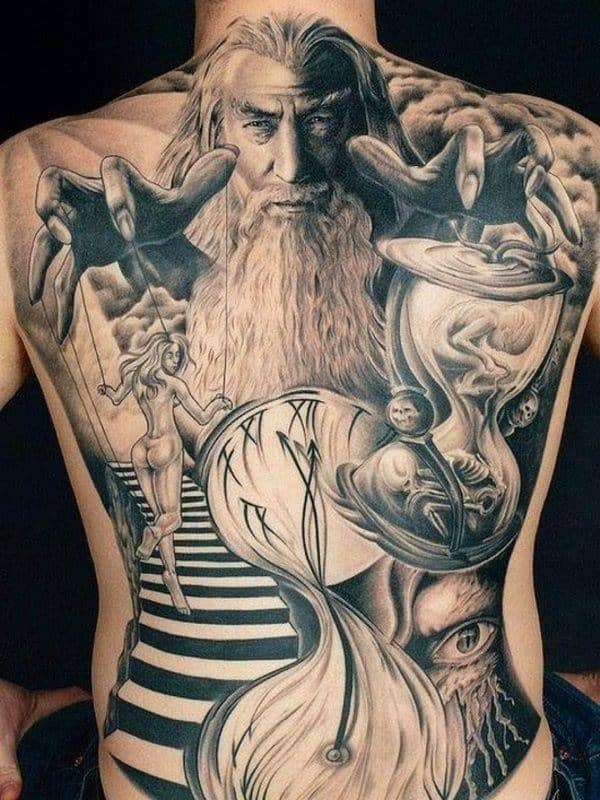 The complexity of the tattoo below is something that’s quite eye-catching. 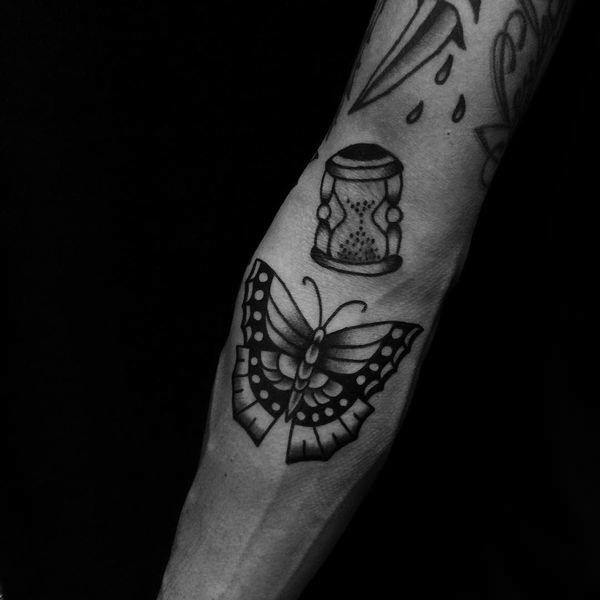 It also fits so well in the lower part of the arm where it’s worn. 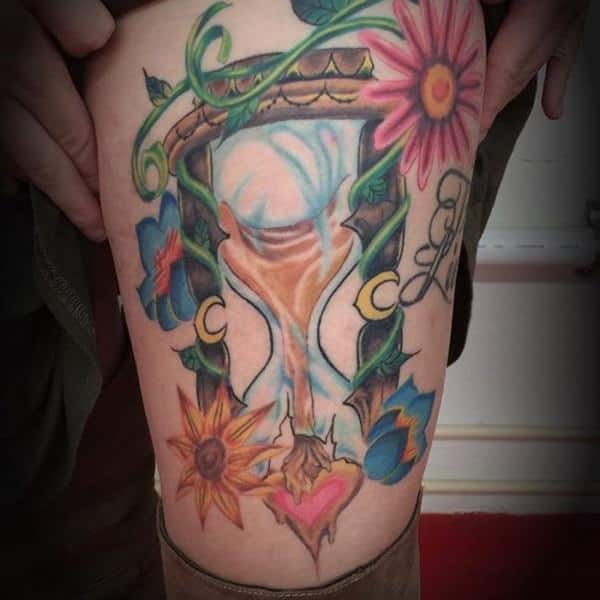 The plants connected to the hourglass also expresses some life from within the hourglass. The passing of time presents people with the opportunity to contemplate their actions. 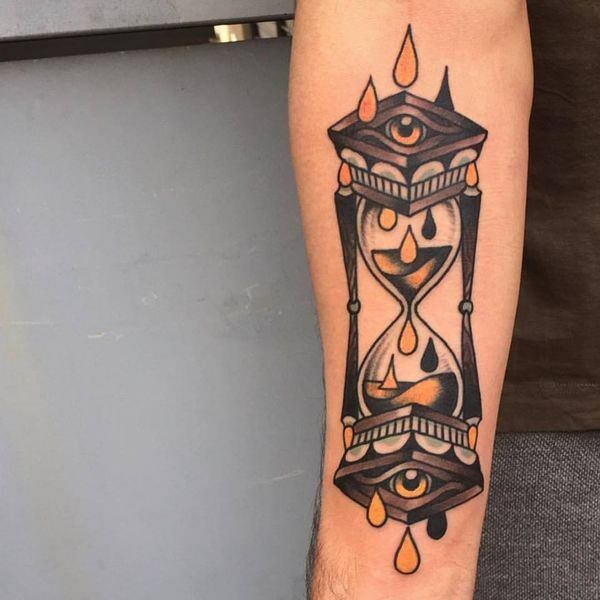 Wearing hourglass acts as a continuous reminder of the passing of time. The design below is an expression of elegance and stylish artwork. The features incorporated that seems to connect with the looks elegant. 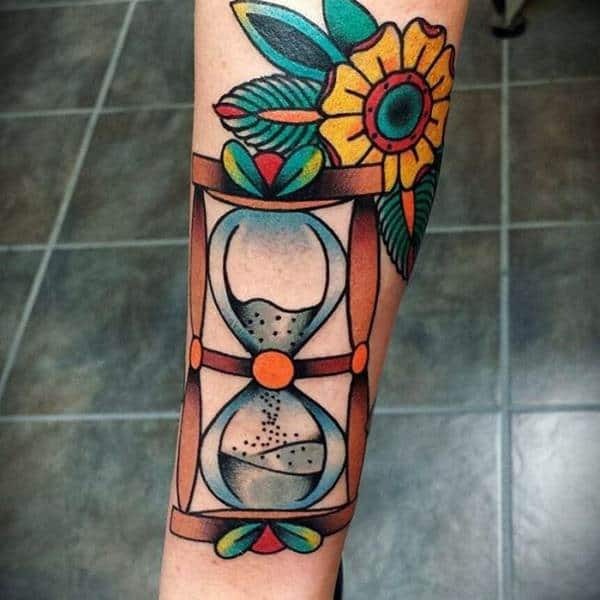 The tattoo also depicts the contrast that exists between joy and sadness. 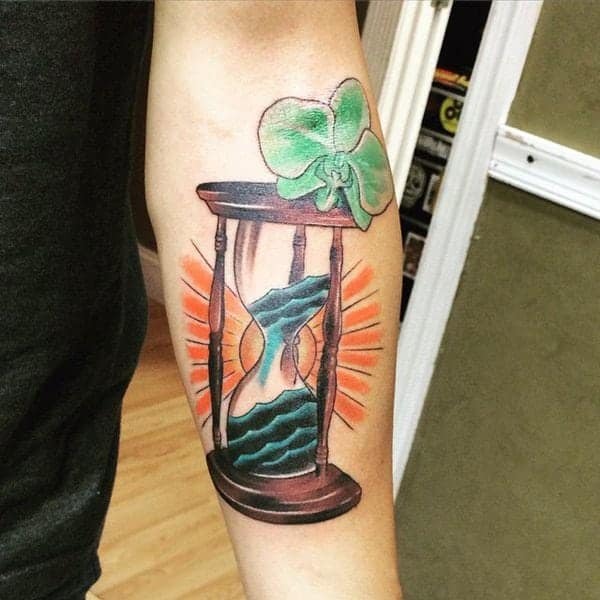 It acts as a reminder that regardless of how joyous a moment is; change is inevitable. 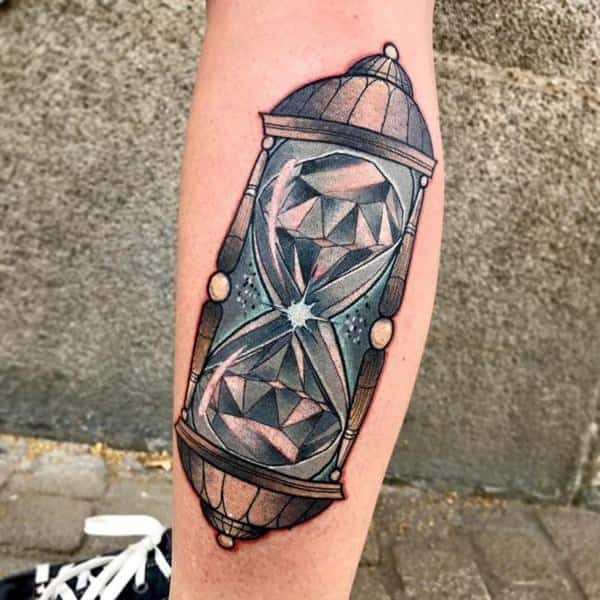 Take your time and explore some of the magnificent hourglass tattoo designs like the one below. 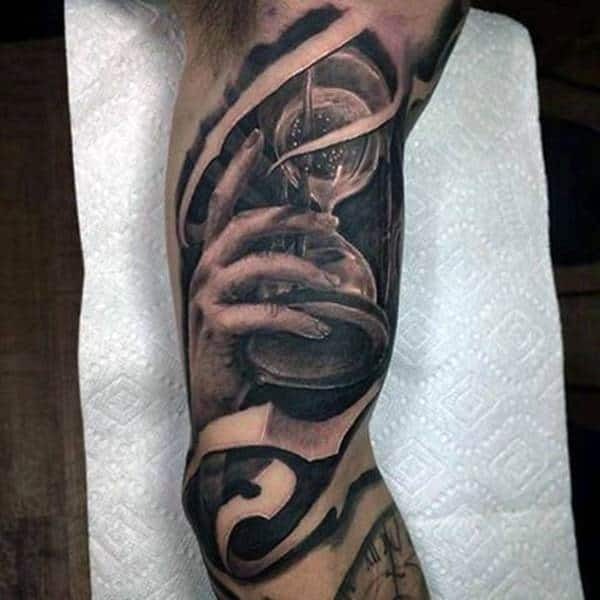 The design has beautifully highlighted the muscular hands. It also combines so well when joined together. 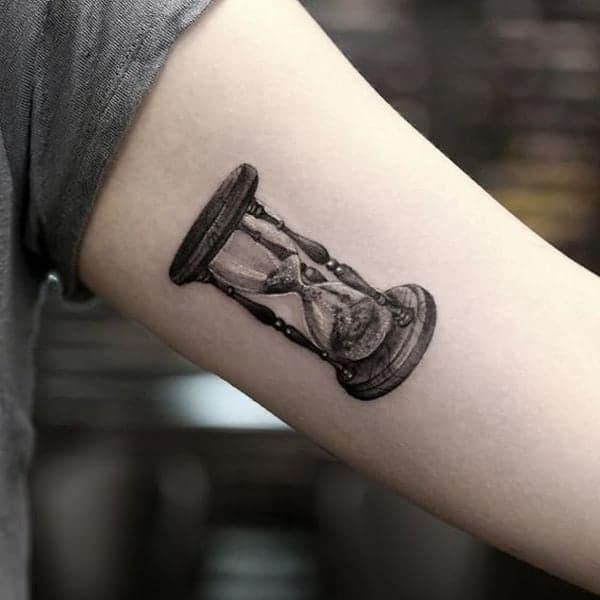 The tattoo design symbolizes the fact that time is running out slowly by slowly. 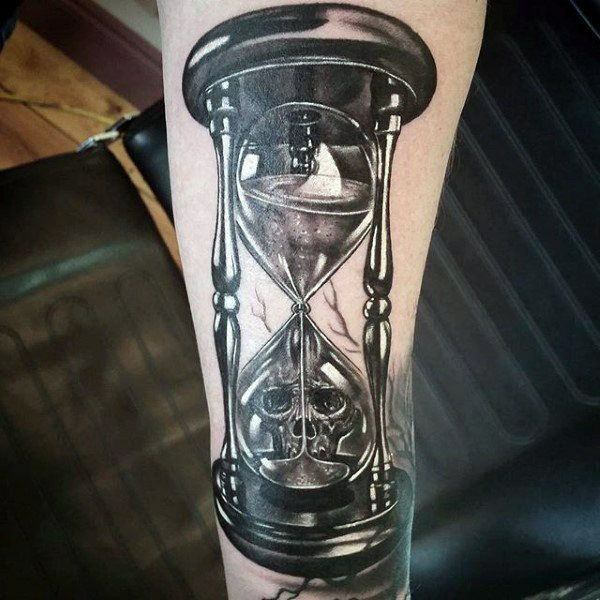 Wearing it in a significant place like the arm acts as a constant reminder of being conscious of time. 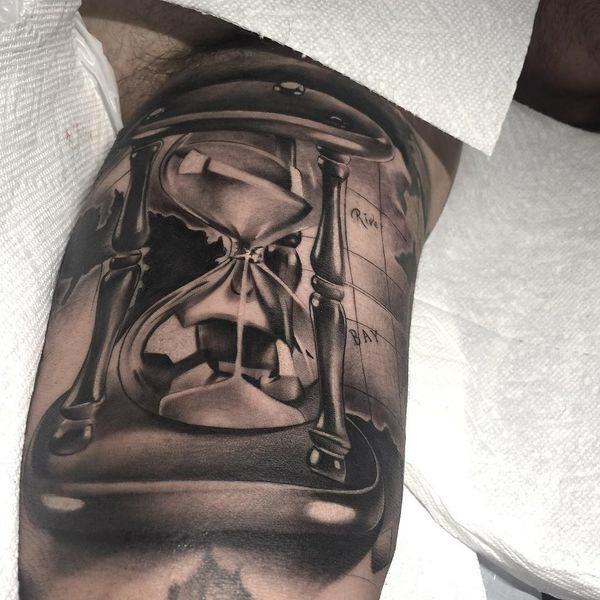 The hourglass has become a major attraction for tattoo lovers all over the globe. It looks spectacular and fills well in most areas of the body. 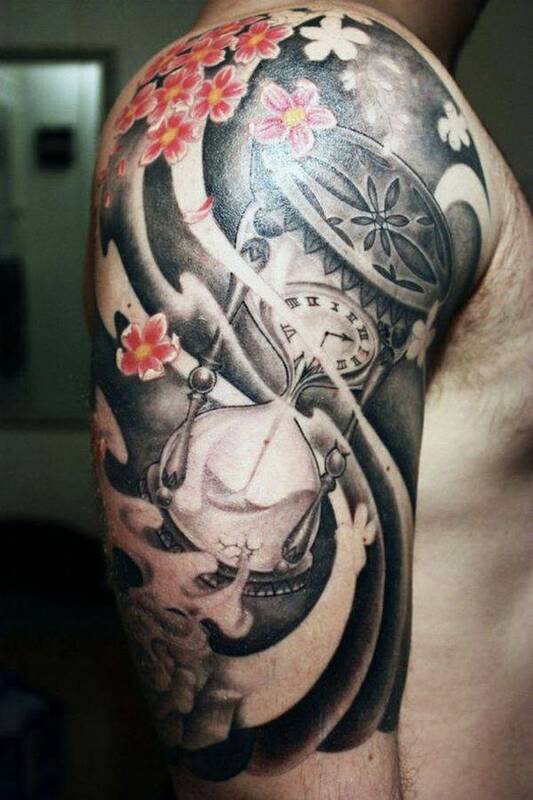 The combination of flowery features with the hourglass enhances the beauty and complexity of the tattoo design. 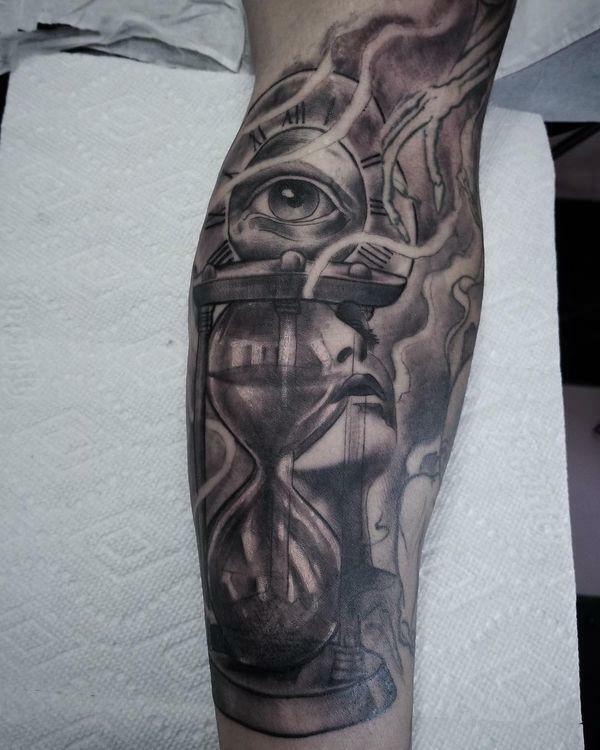 The inking of the eye into the design is an expression of being watchful. 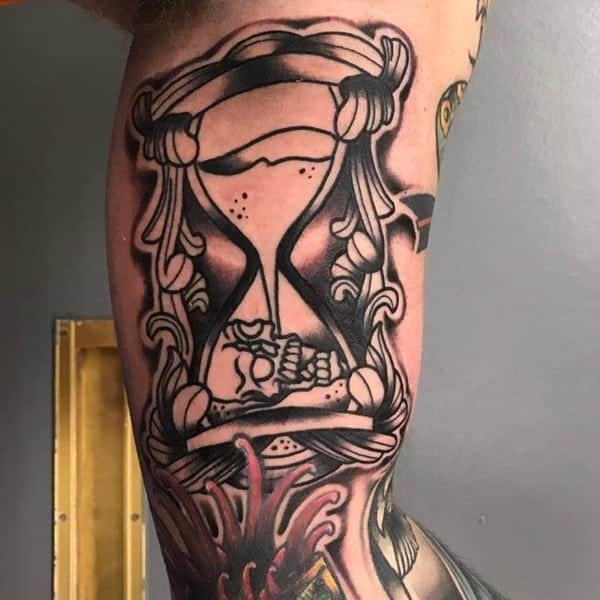 Inking the hourglass is also a reminder for one not to waste time on things that really don’t matter. 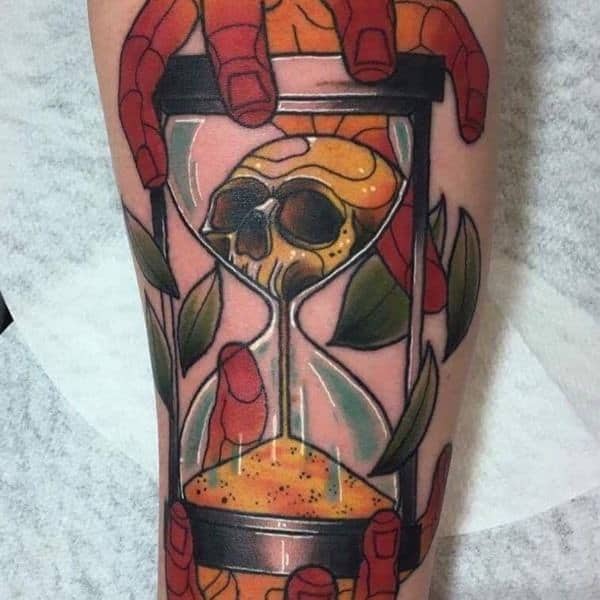 The combination of features such as bones and a clock is a perfect reminder of the connection between life and death. The use of dark shady colours expresses a magnificent look. 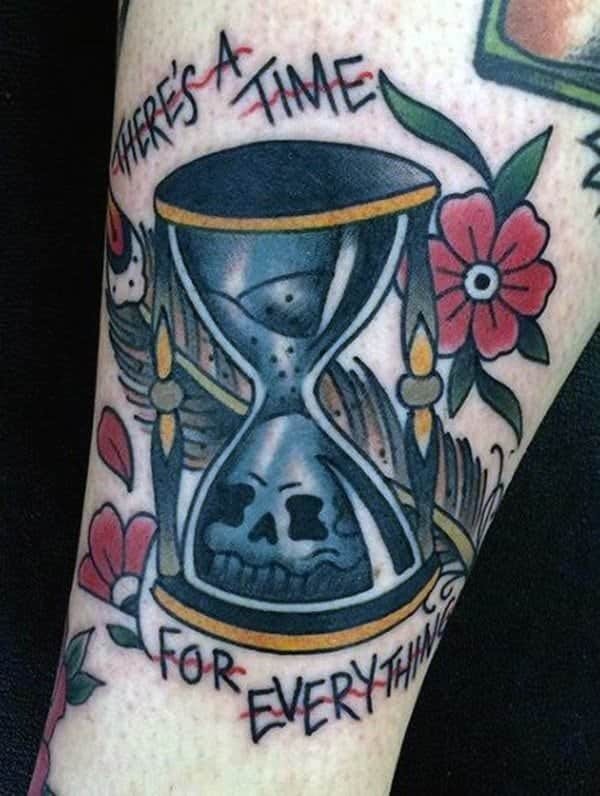 It also brings to life the true meaning of hourglass tattoo about the reality of being no more one day. The design is said to have originated from Egypt however the beauty has been embraced world over. 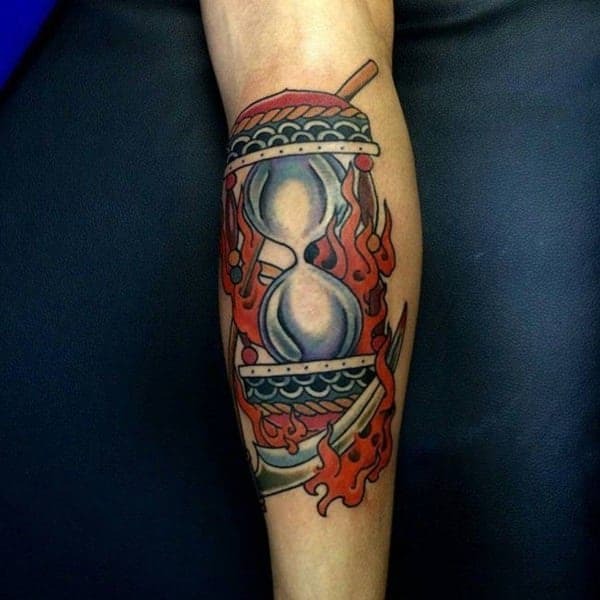 The below tattoo is a beautiful expression of how fierce and complex the elements are. 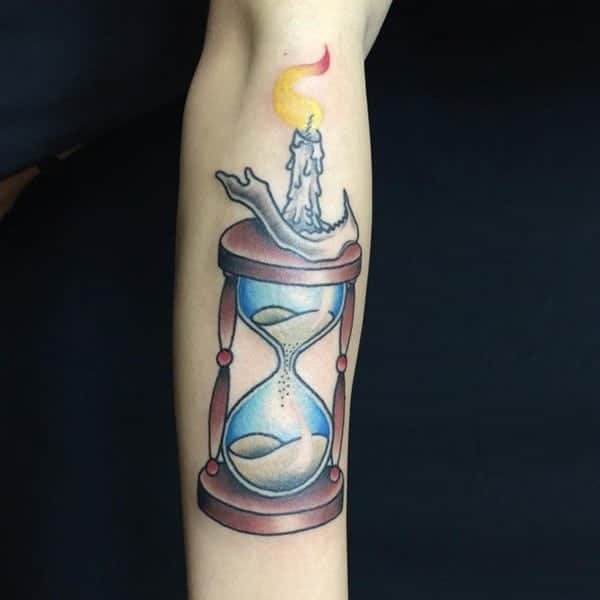 Featuring the hourglass tattoo with a dying tree and a burning candle clearly expresses the essence of time. It shows how the minutes spills of hot candle drops can have a significant impact over a long time. 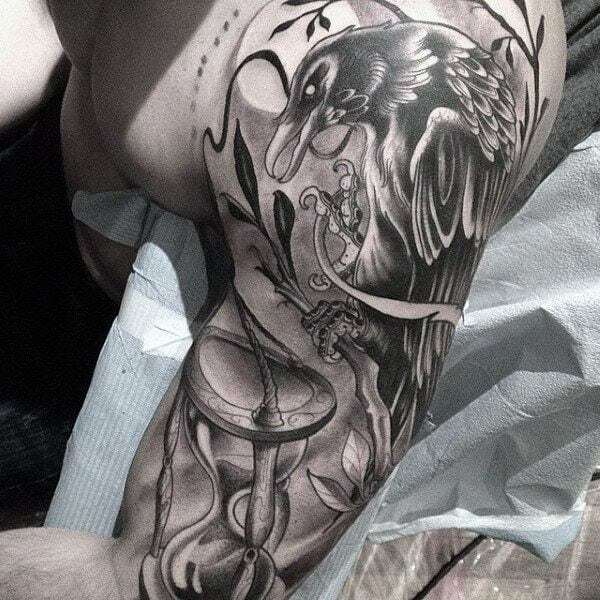 The use of dark shades in inking the tattoo can never be underestimated just like in the design below. It looks magnificent on the wearer. 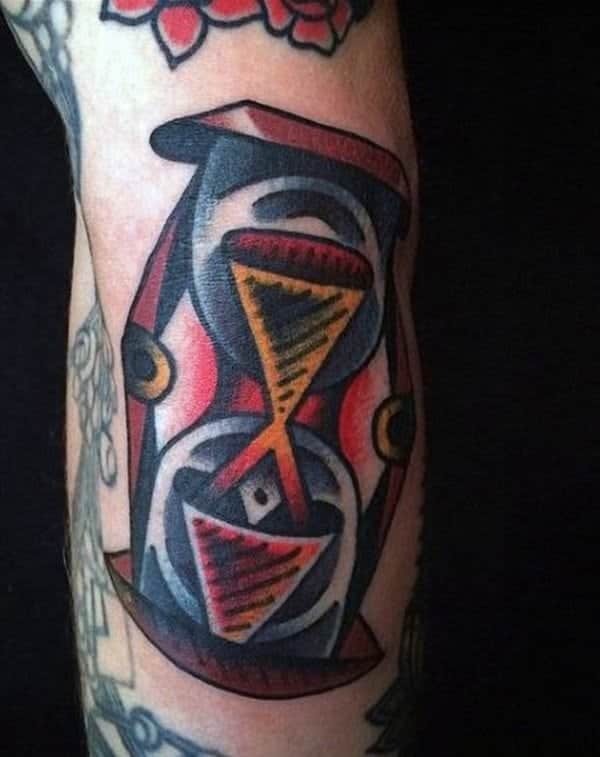 An expression of being trapped in the hourglass tattoo design with tears rolling expresses the pain that the passing of time carries. When time seems to be progressing and your desire never seems to manifest. 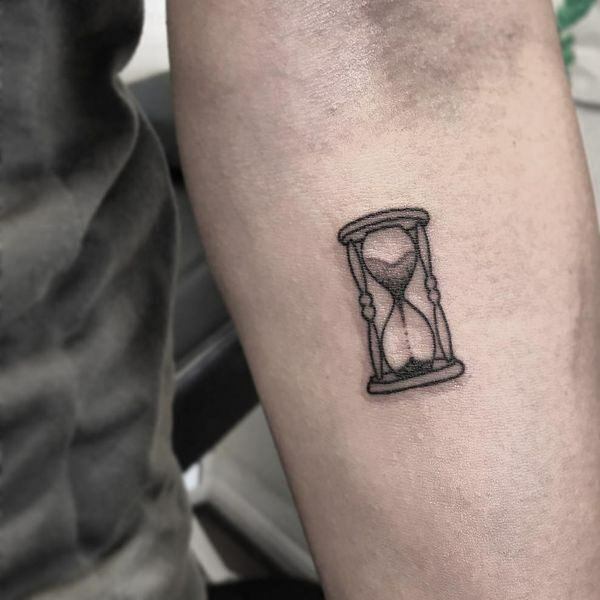 Wearing the hourglass tattoo right at the centre of the heart expresses the deep and inner feelings associated with the passing of time. The design below looks epic. 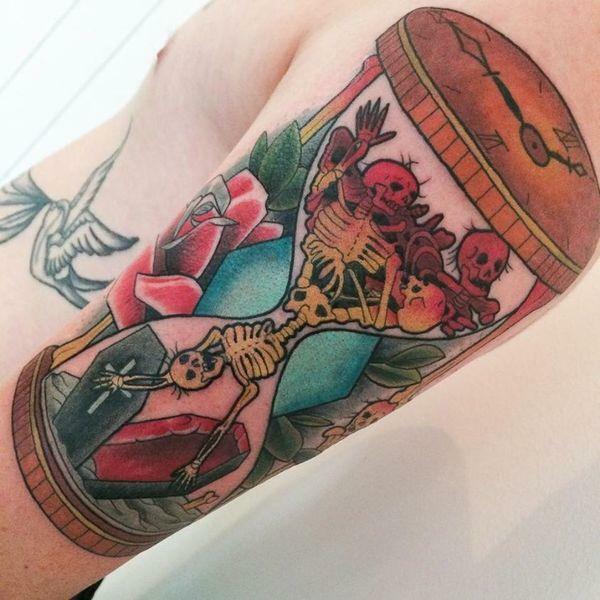 The hourglass tattoo was majorly embraced in the middle east and preferred by the seafarers and the monks. 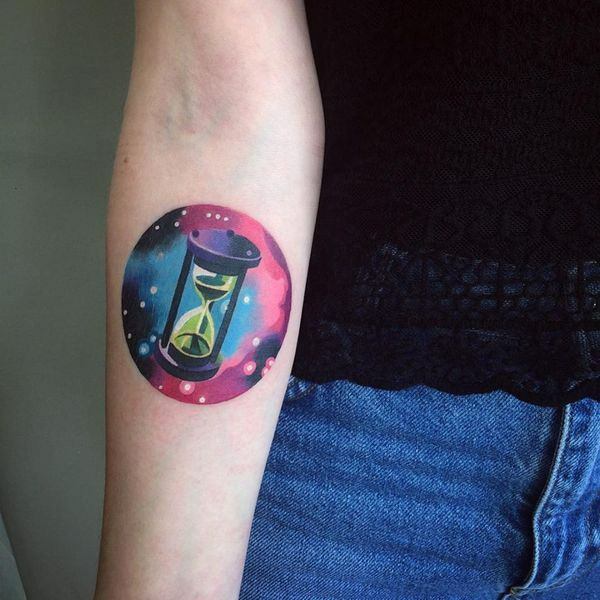 The mystery behind the hourglass tattoo design makes it be quite adorable. 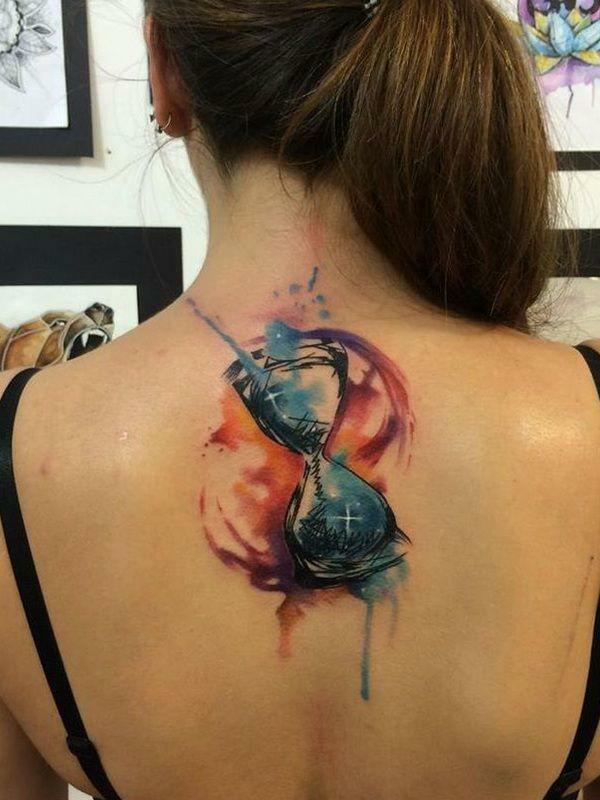 The combination of many colours on the hourglass tattoo design below looks magnificent. 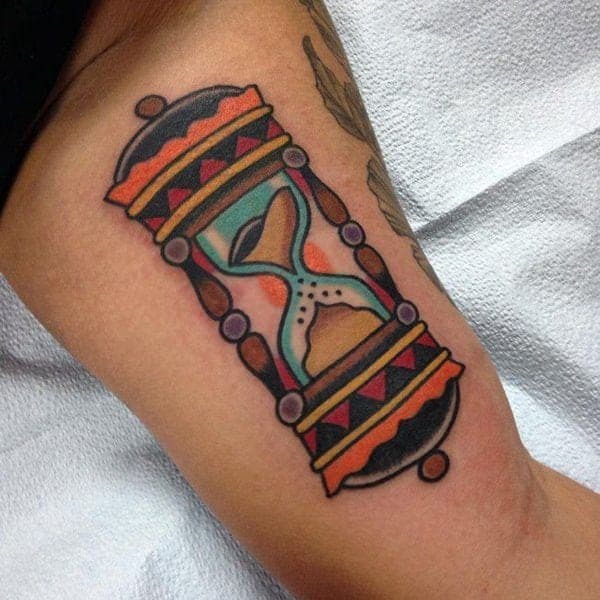 One thing that makes hourglass tattoo to be outstanding is the fact that it can be incorporated with many features. 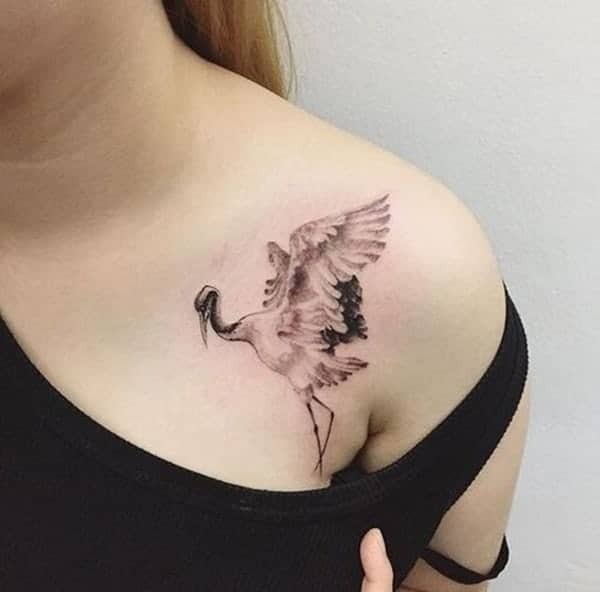 The incorporation of a bird with beaks open expresses life and beauty with the tattoo design. 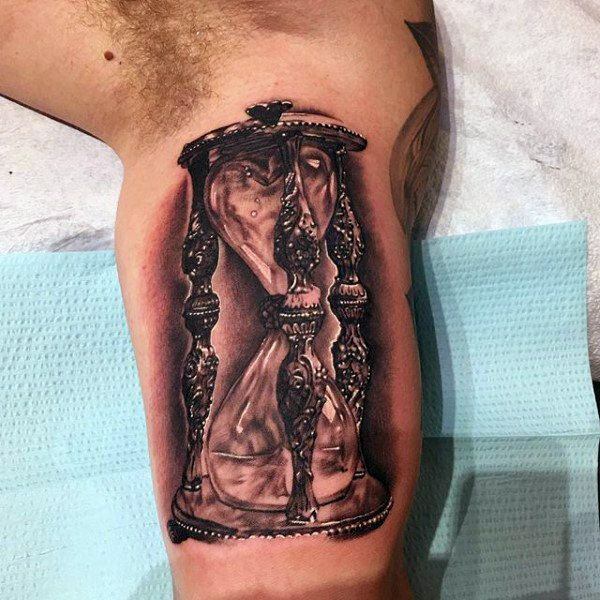 Hourglass tattoo design expresses different meanings to people differently. The meaning associated with the design also tends to influence the placement of the design. 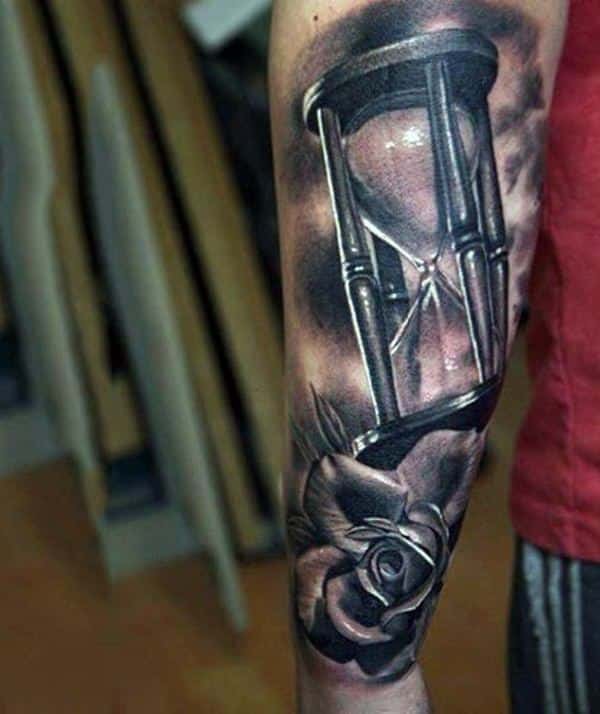 The beauty and complexity of the hourglass tattoo design below is something that cannot be underestimated. It fits perfectly well on the upper shoulders where it’s worn. 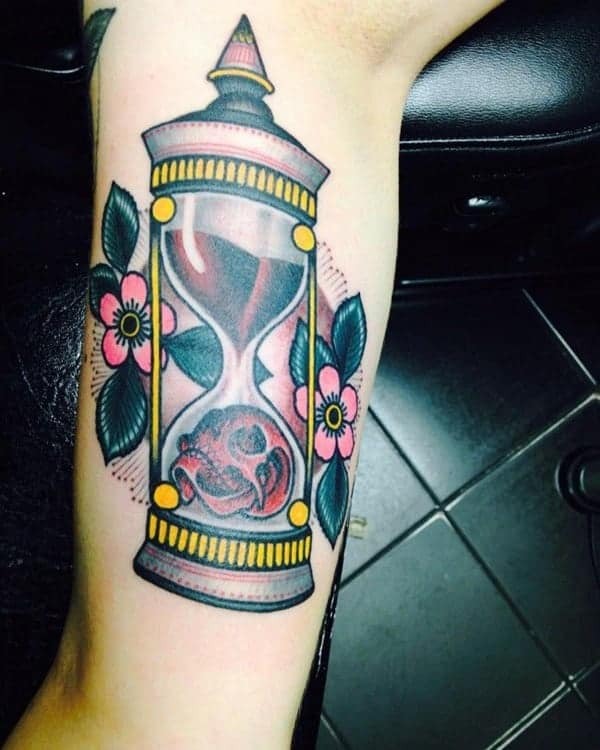 The presence of a smartly dressed skull expresses death, especially when used alongside the hourglass tattoo. It looks elegant yet quite scary. 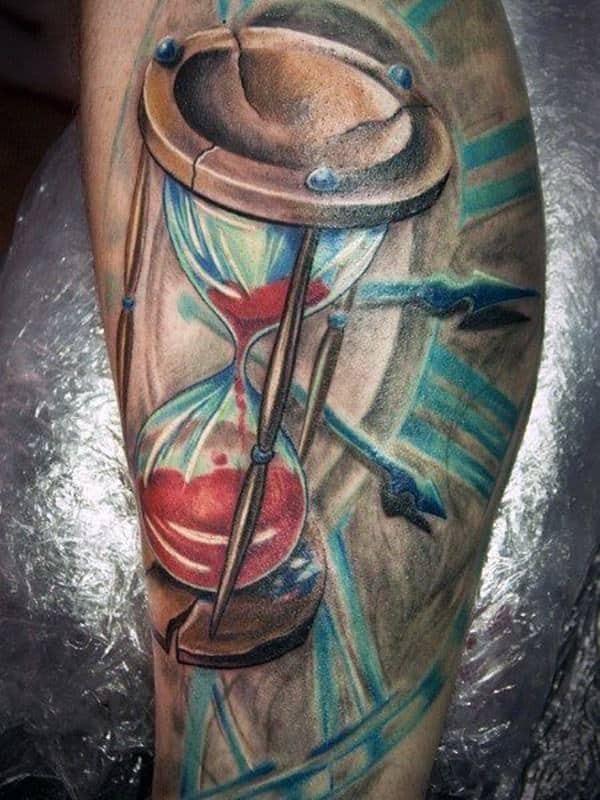 The huge hourglass tattoo design below is an intricate artwork and expresses a high level of professionalism. It also brings out that aspect of a bold personality of the wearer. 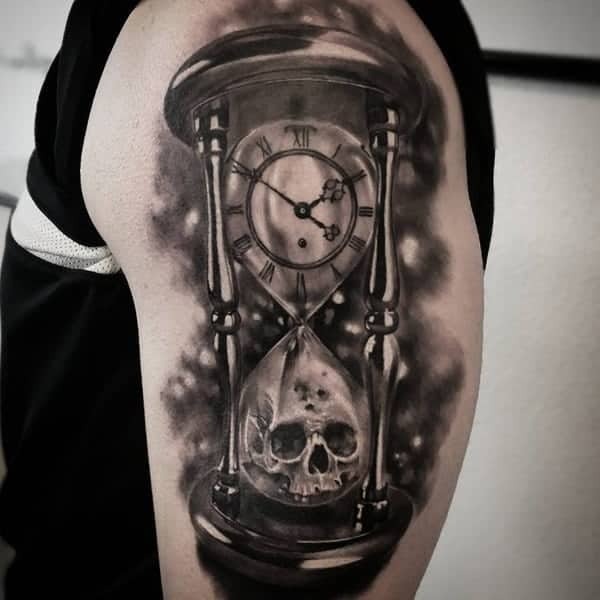 Having a skull trapped at the bottom of the tattoo with sand flowing depicts the passing of time. 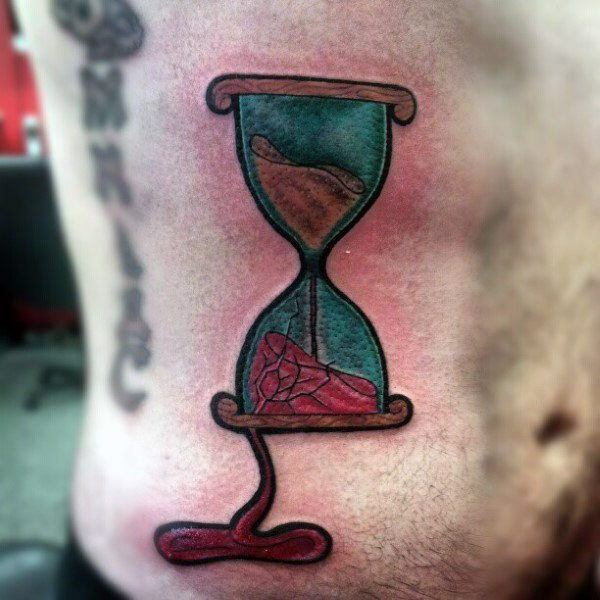 It also expresses how we end up buried in the sand. The design below looks scary with the top of the glass shown as broken. 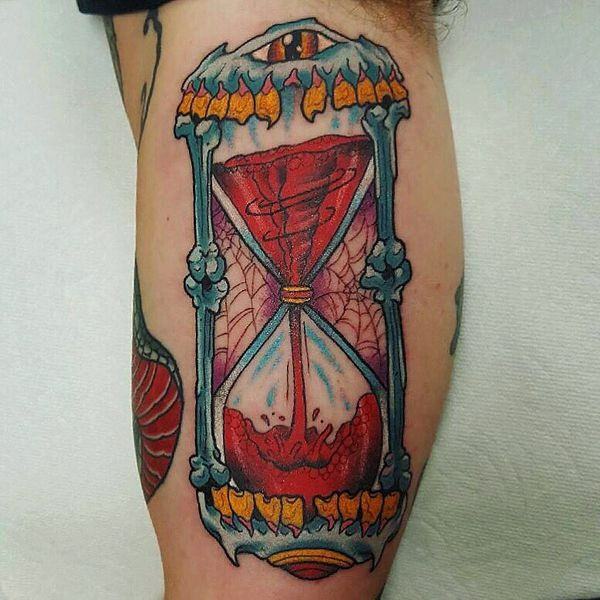 The spilling blood that flows to the other glass shows how life dissipates with time. 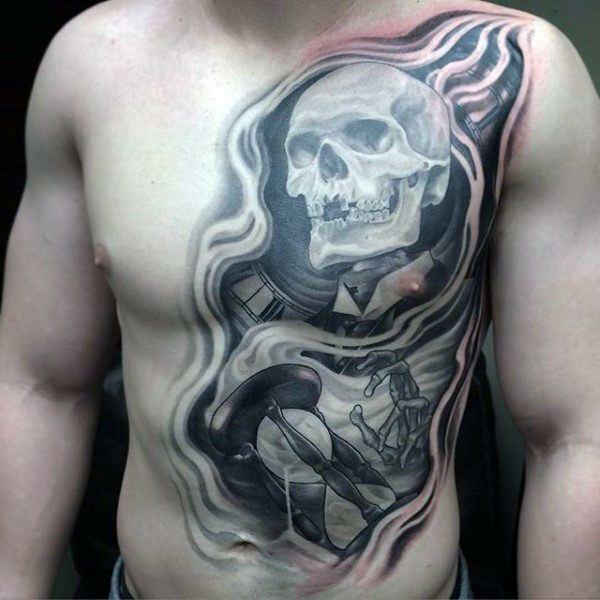 The design below expresses a magnificent piece of artwork. It’s cool with the colours creating such a beautiful outlook. 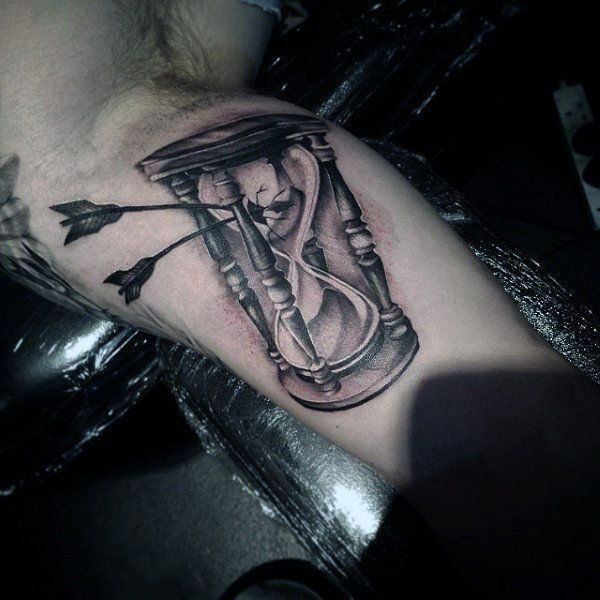 The time factor in the hourglass is a constant reminder of the meaning of the design. It looks magnificent as displayed in the design below. The design below expresses a dynamic piece of work. It looks colourful and blends well with other features. 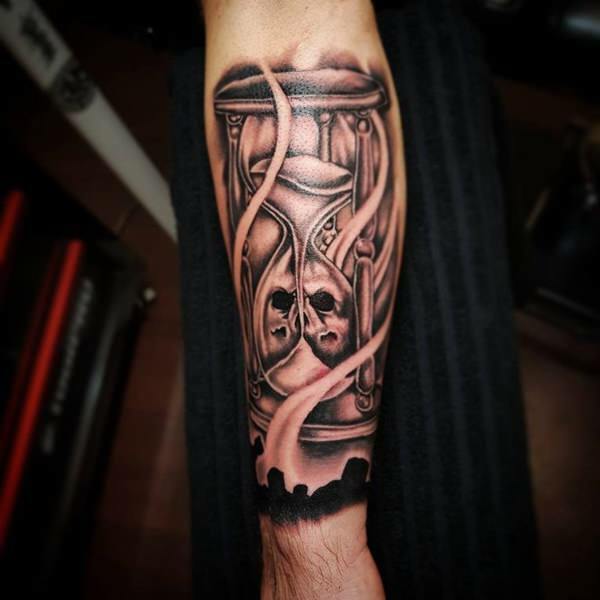 The brighter side and the dark side of the hourglass tattoo design below expresses the contrast of life and death. It paints a reality of what to expect and something that many are scared of. 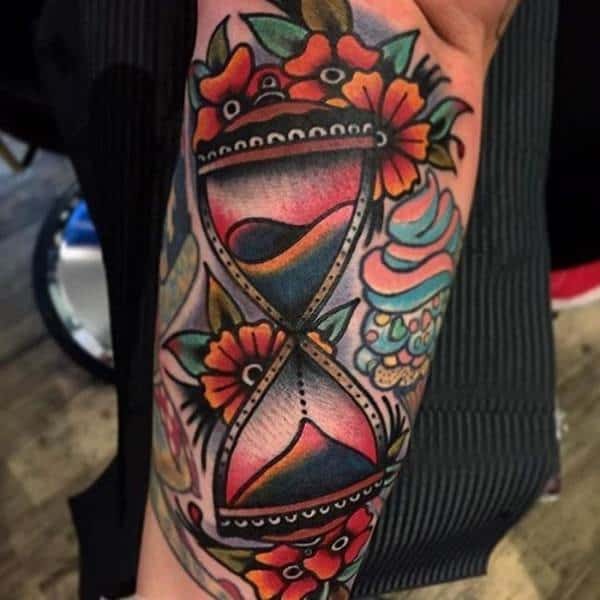 If you’re looking out for some of the jaw-dropping hourglass tattoo ideas then keep scrolling down for some fascinating ones. 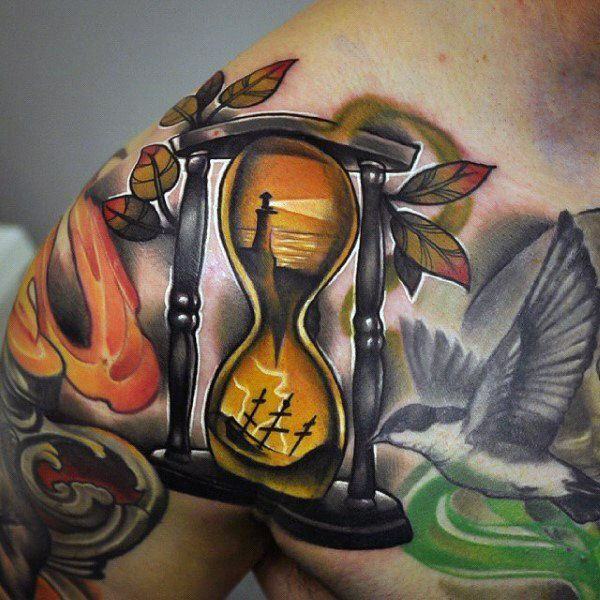 The hourglass tattoo design below is a spectacular piece of work. 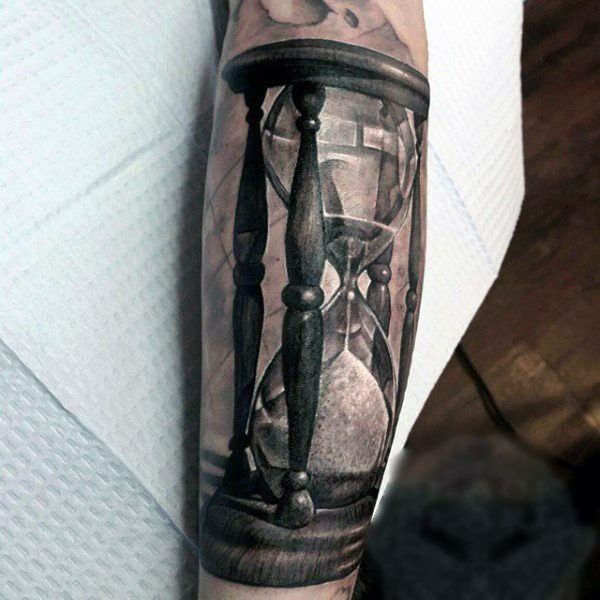 The hourglass tattoo design below is a magnificent piece of artwork. It’s cool and adorable. 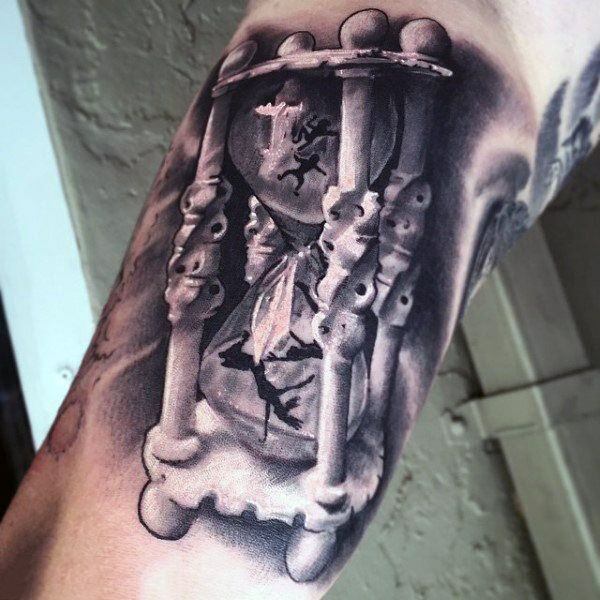 The features incorporated in the hourglass tattoo design below expresses a scary outlook of people trapped in the design. 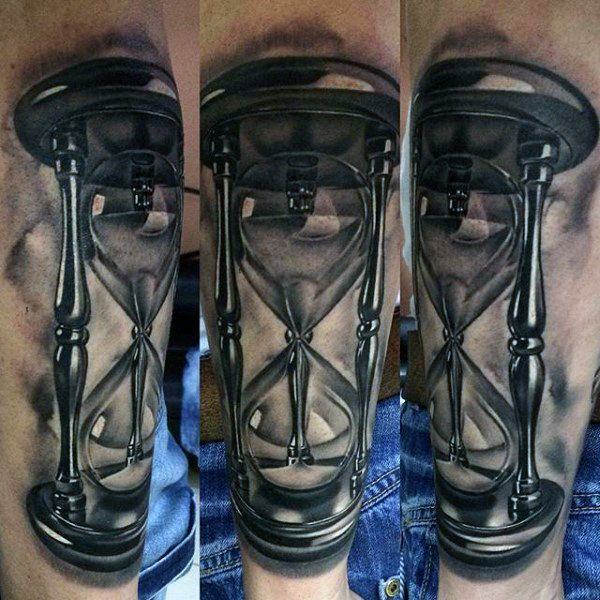 The hourglass tattoo design is also anchored with strong pillars that looks unbreakable. 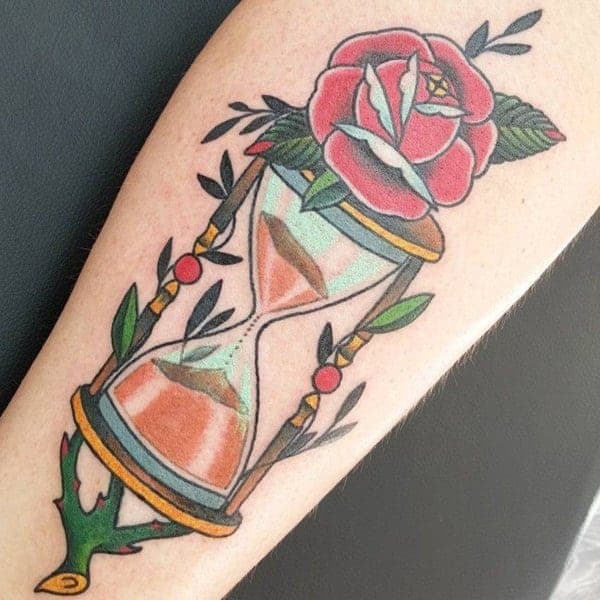 The combination of green and red with other elements looks magnificent in the hourglass tattoo design below. 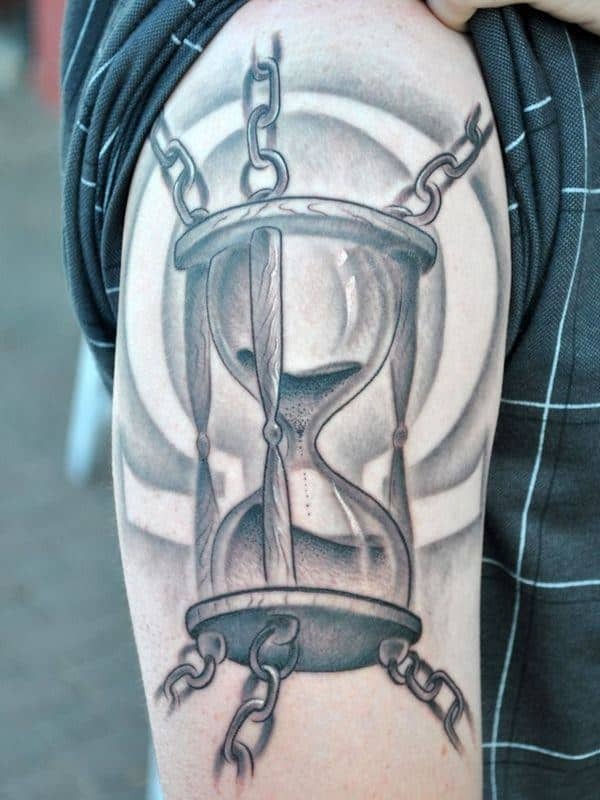 The hourglass tattoo design below expresses that complex symbol that could be carrying a deep meaning for the wearer. The design below looks beautiful with the colour combination expressing an appealing outlook. 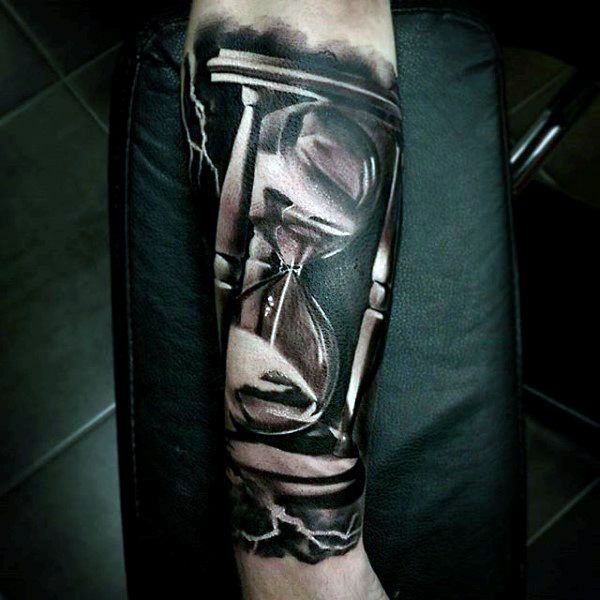 The hourglass tattoo design below s such an intricate piece of artwork. 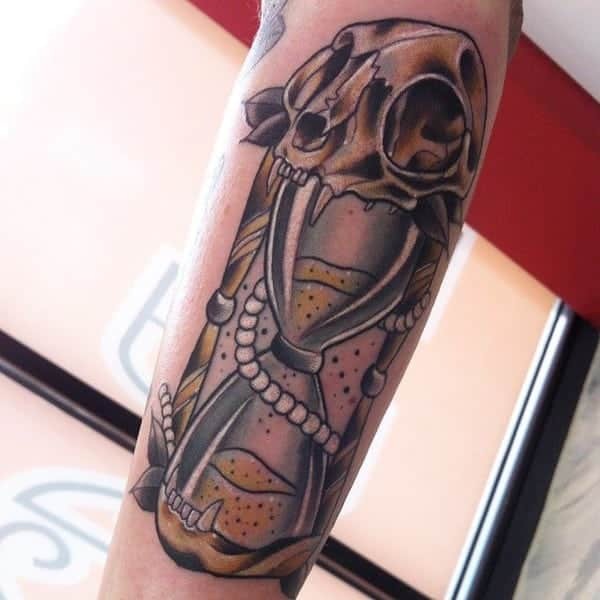 Incorporating the design with venomous snakes could be expressing the wearer’s personality or state of mind. 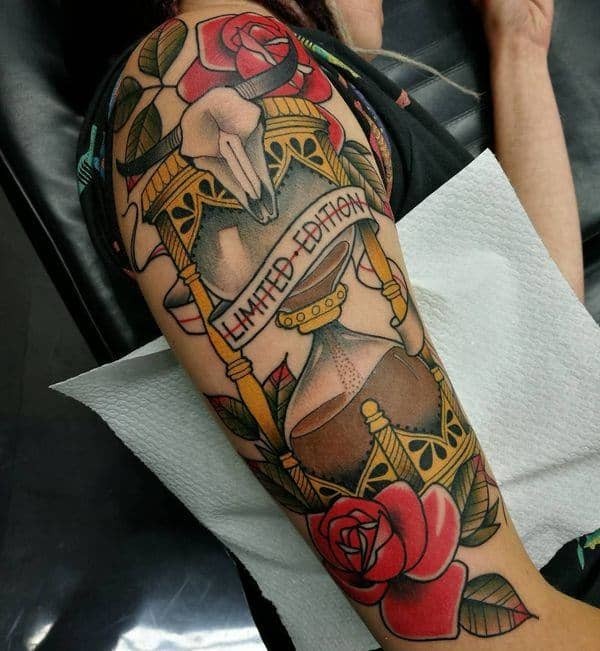 The design below is a magnificent artwork with the combination of diverse shades creating an awesome expression. 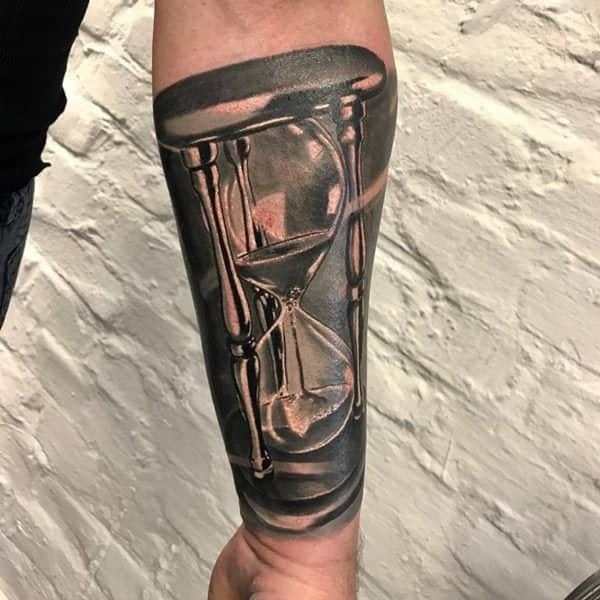 The hourglass tattoo design below is a magnificent piece of artwork. 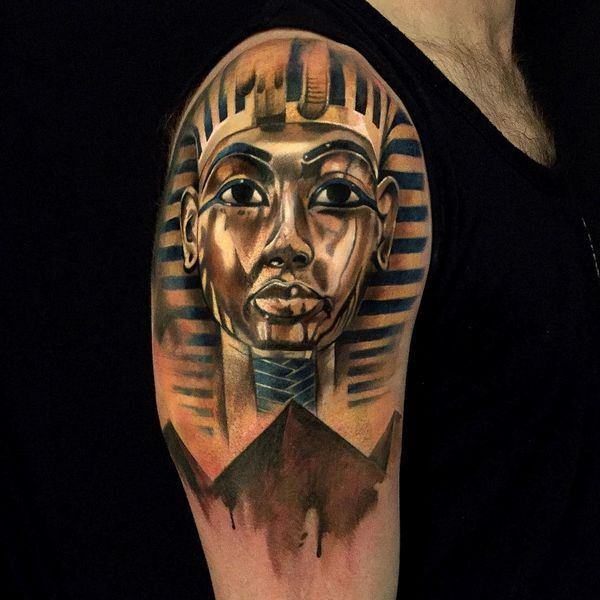 It also expresses the Egyptian connection which is the origin of the tattoo. 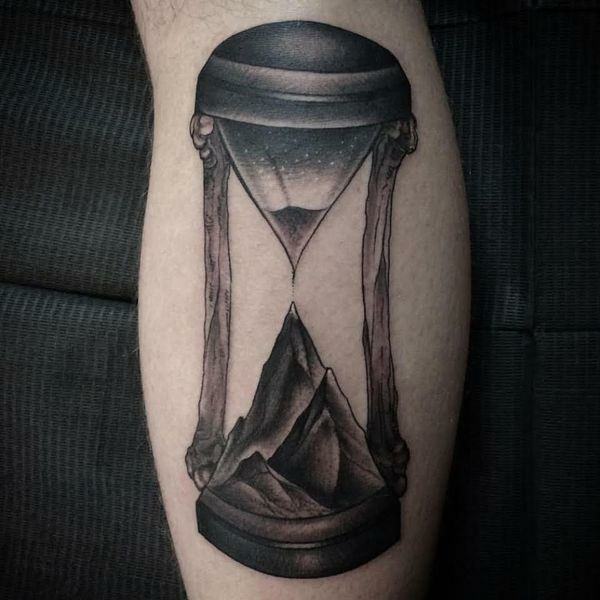 The hourglass tattoo design below is a real expression of complexity and magnificence. 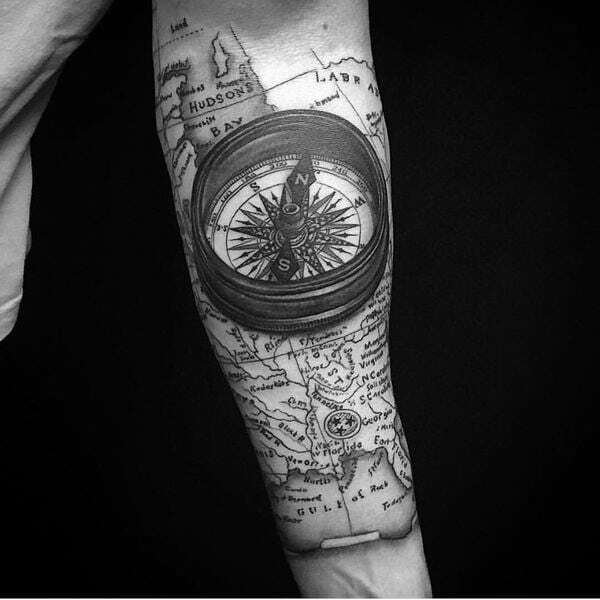 The design looks spectacular with the tiny features and the compass enhancing the design. 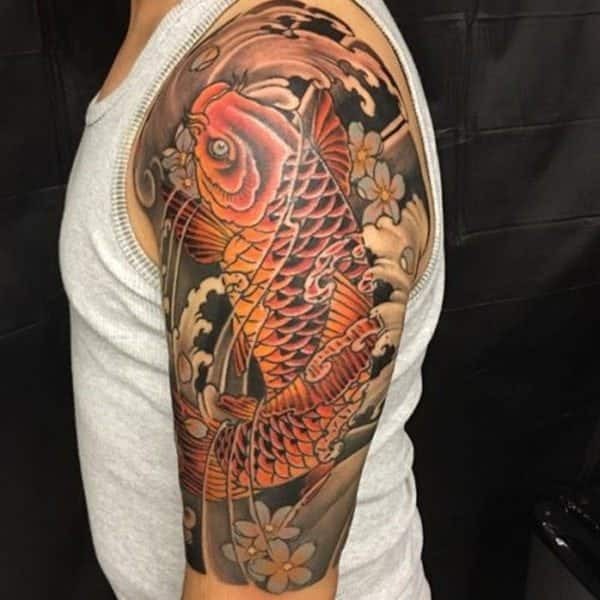 Incorporating koi fish element to hourglass tattoo adds to the intricacy of the design. 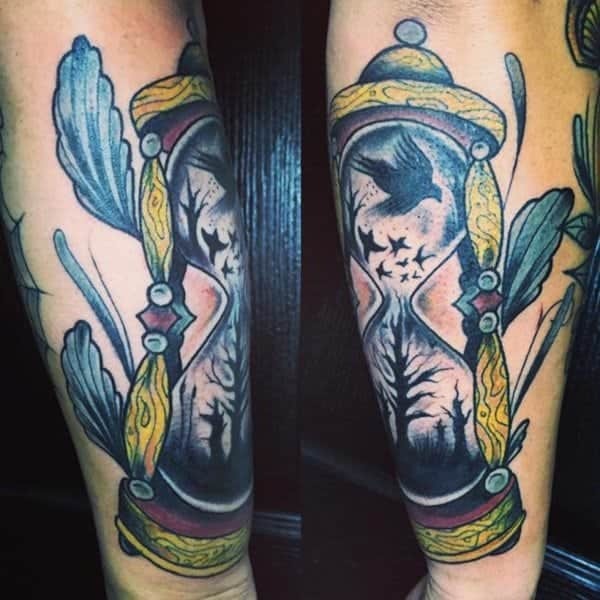 Hourglass tattoos blend quite well with the various features and fit well on the upper arm. 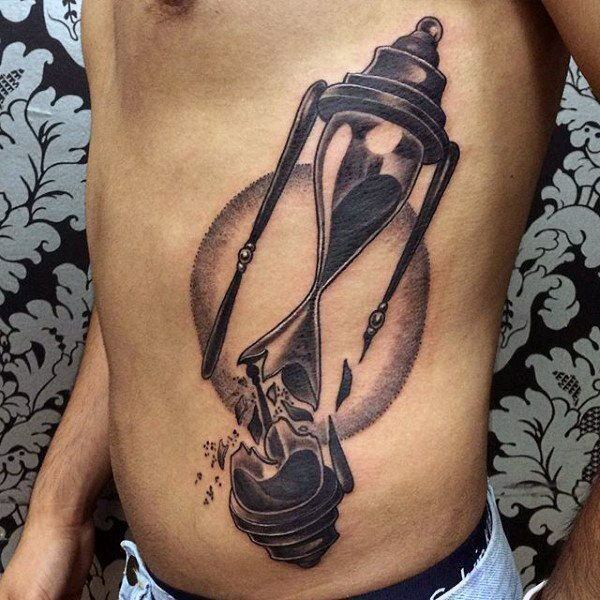 Hourglass tattoos can also be inked in diverse ways and the design below ignites such an intriguing look. 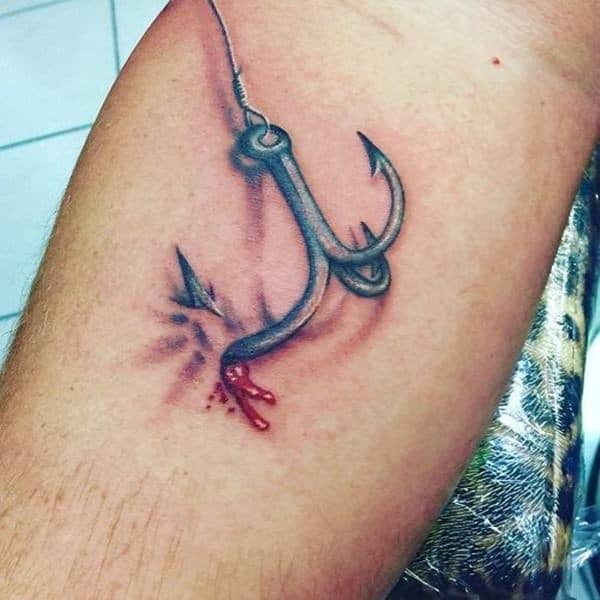 the hook looks so real and exudes feelings of fear. You can still make the design simple and adorable with cool elements. Enhance feminine features with an adorable piece of artwork that’s eye-catching. 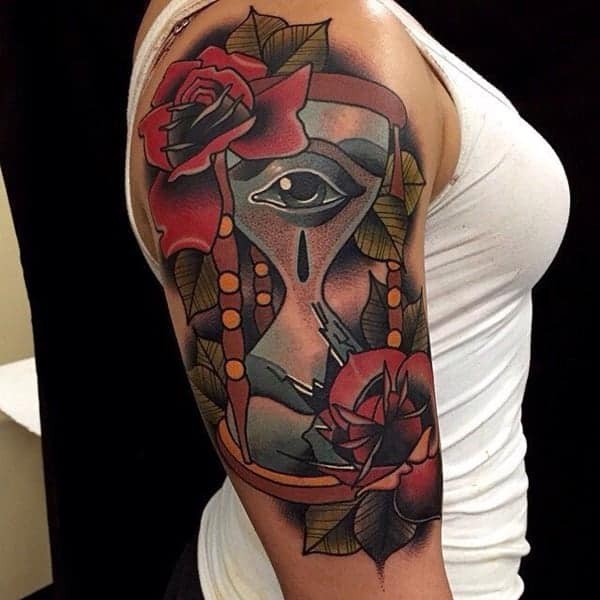 The beauty of the tattoo design below is quite evident through the colour combination and the shiny elements. How colours are used in a design can in a great way enhance the overall outlook. The design looks magnificent with the combination of yellow, red and greenish shades creating an appealing outlook. 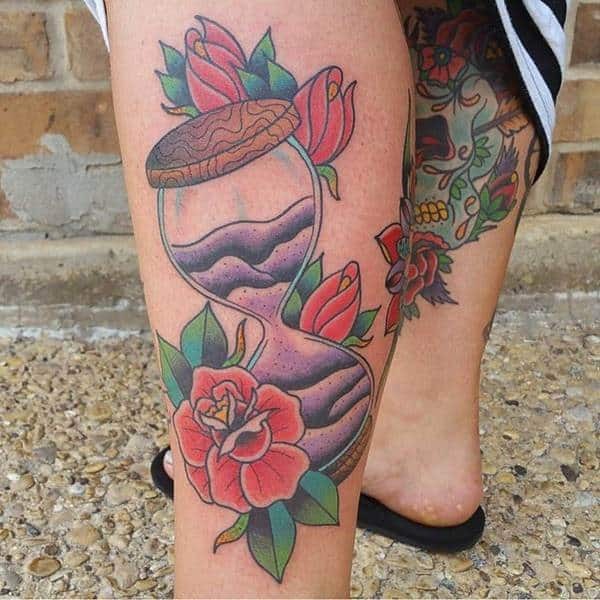 Such an adorable hourglass tattoo design that looks great on women. The one colour used in the design is adorable and blends well with the wearer’s complexion. The design below looks secure and magnificent. 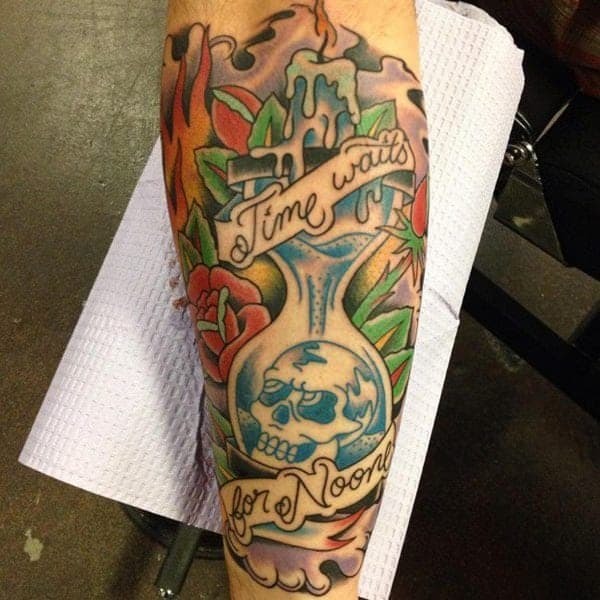 The one colour used in the design also expresses a beautiful outlook. 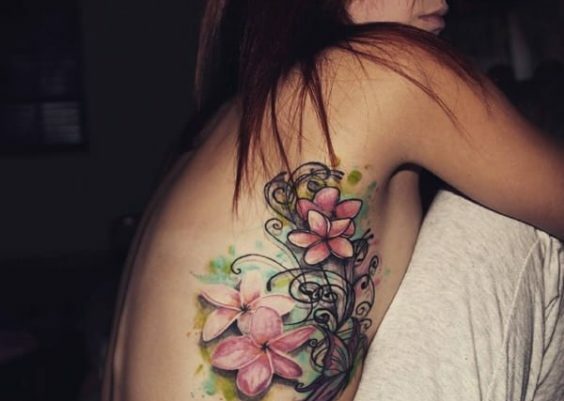 Flowers have a way of making tattoos to really pop which is spectacular. The beauty expressed with the flowery design is quite outstanding and attractive. 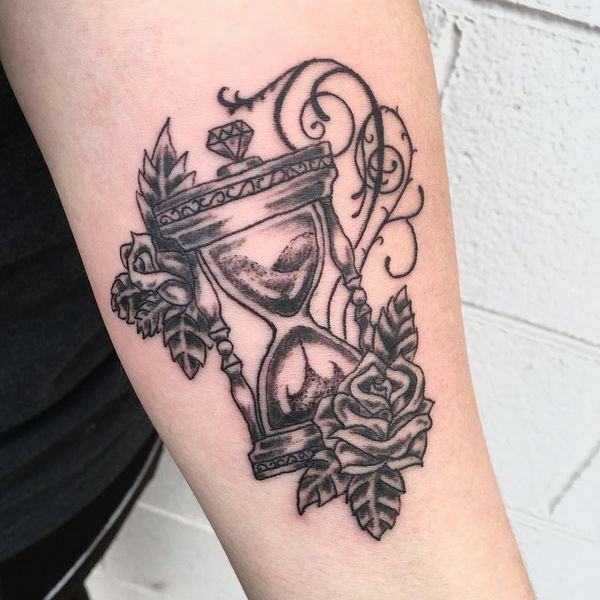 You can bring life and elegance to hourglass tattoo design by incorporating some adorable elements. 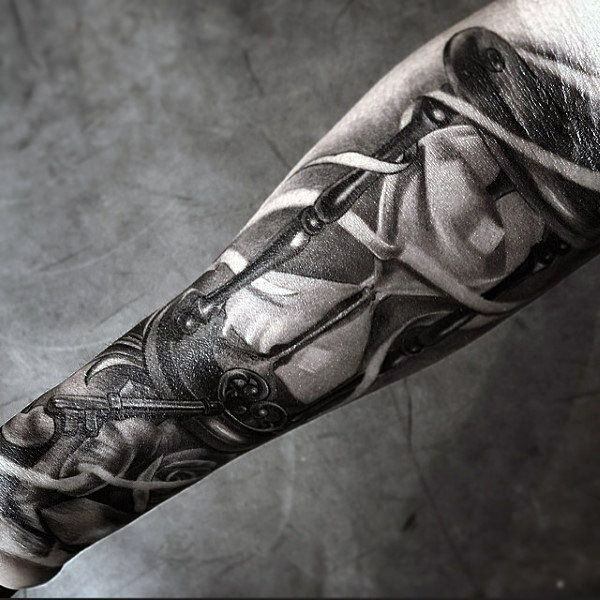 The design is quite surreal with the blackwork styles creating a magnificent appeal. 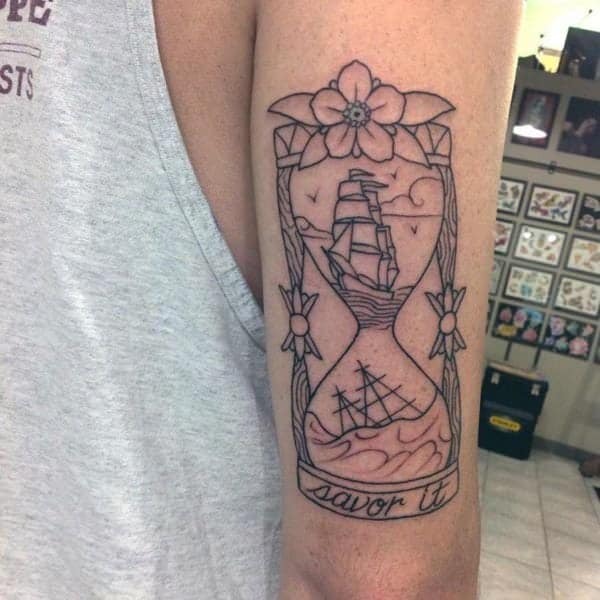 The upper arm is one of those magnificent areas that suit placement of the design. The design below looks amazing with the black colour shades enhancing the designs appeal. The inclusion of diverse elements and colours only works to enhance the beauty and elegance of the design as shown below. 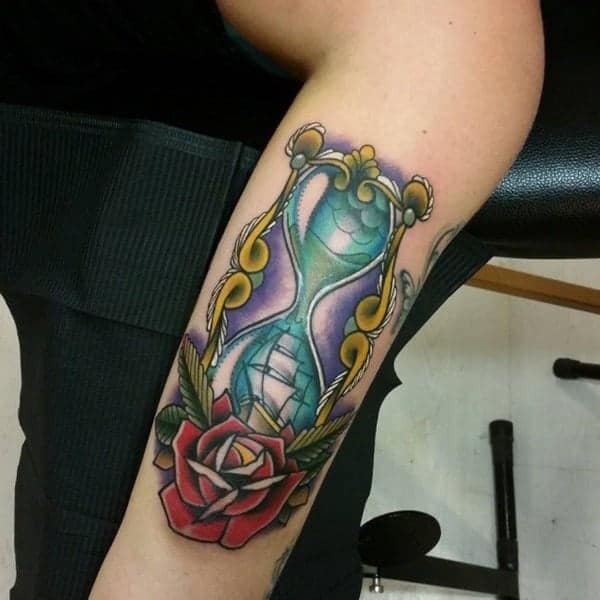 The hourglass below looks magnificent with the colour combination creating an adorable. 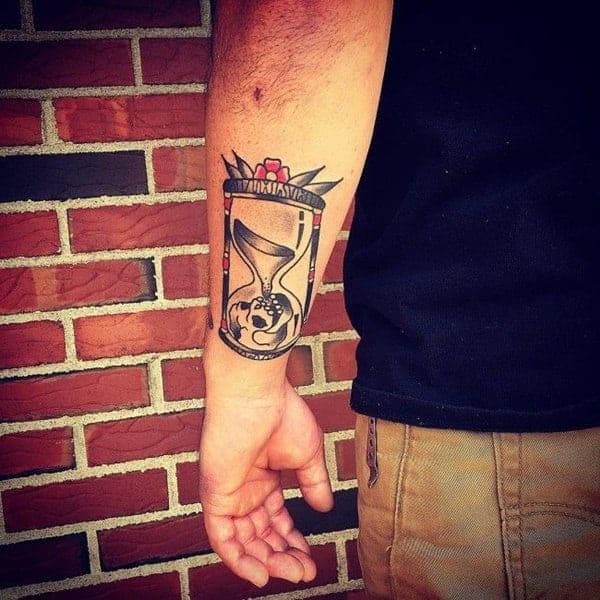 The symbol of death and mortality that the hourglass expresses is clearly shown in the design below. 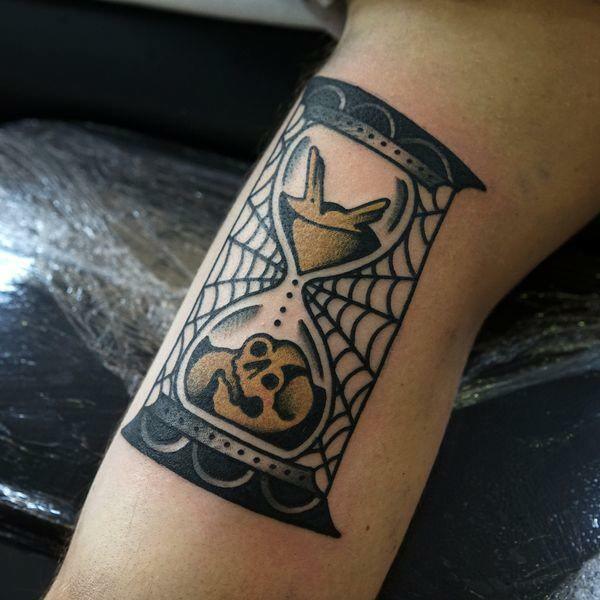 The images of the skeleton in the design creates a picture that’s chilling and scary. 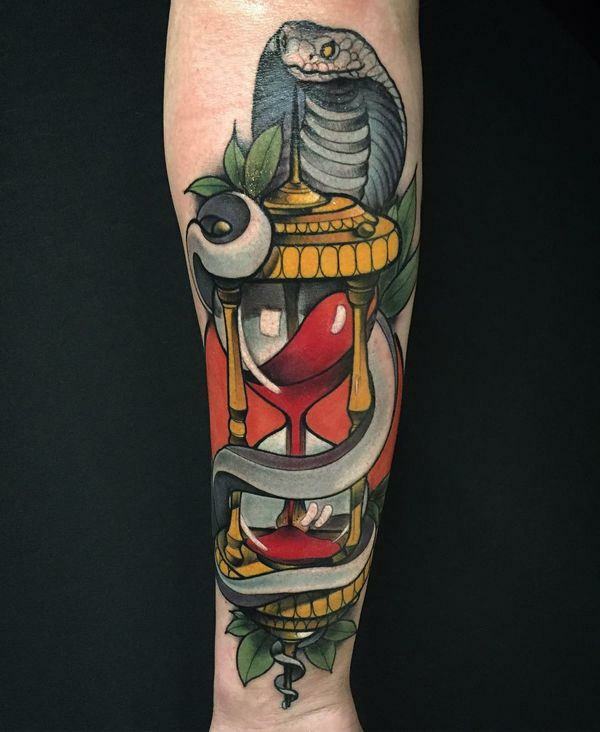 The combination of the cobra snake with the hourglass tattoo design creates an epic and adorable. The combination of yellow, grey and the red color shades looks good on the design. The design below looks cool and elegant with the dropping flames enhancing the outlook. 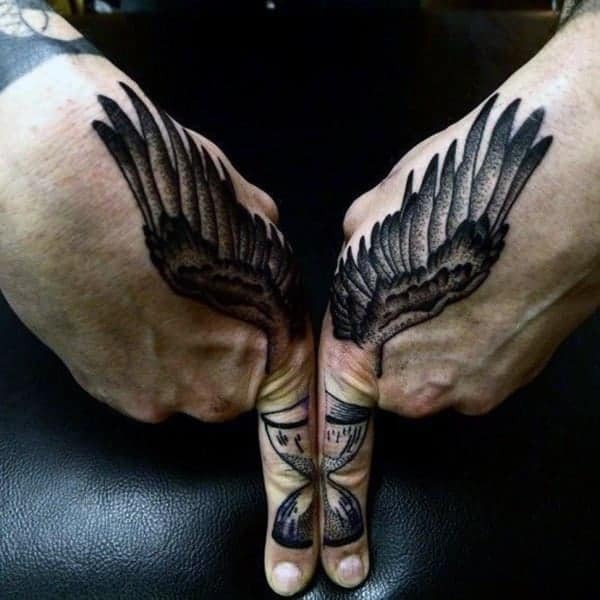 The design below can be a sign of luck and success. 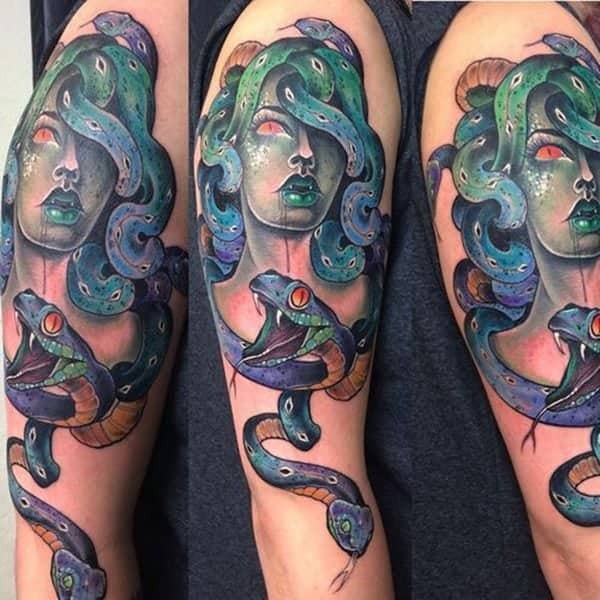 It looks epic with the colour combination creating such a cool look. 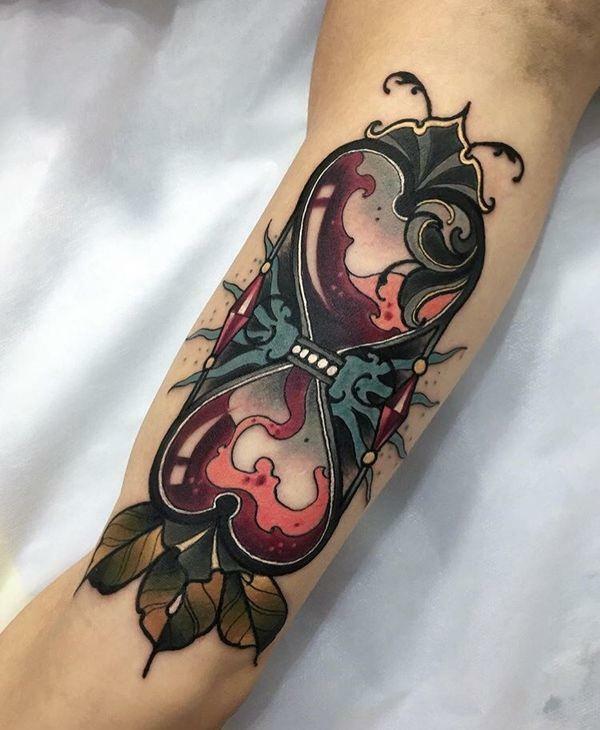 Such a beautiful fusion of colours that brings in contrast into the design. 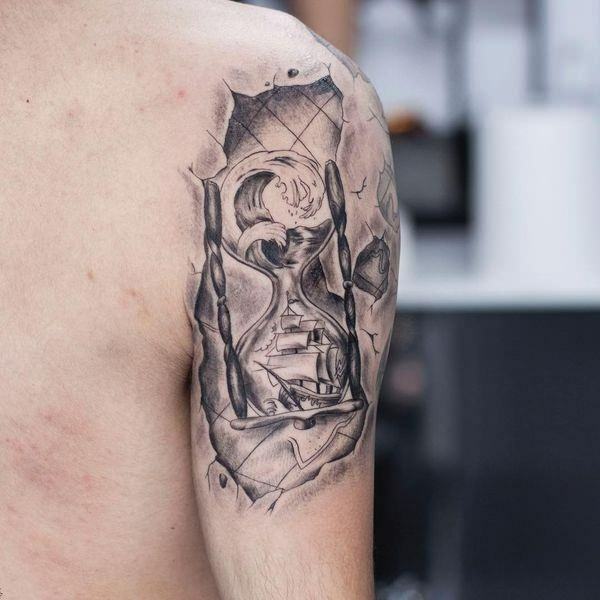 The incorporation of the skull in the hourglass tattoo design below is an expression of death and loss. The colour combination, however, brings life to the design. 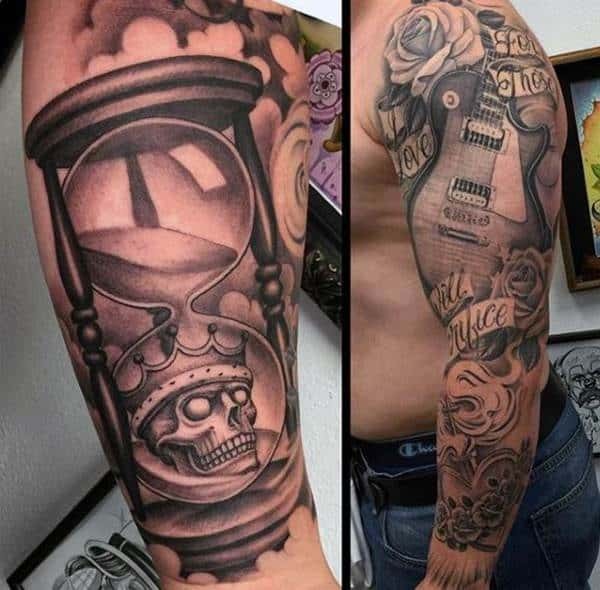 The quarter sleeve tattoo design expresses a magnificent outlook. The beautiful colour combination with the dark shades blends quite well. 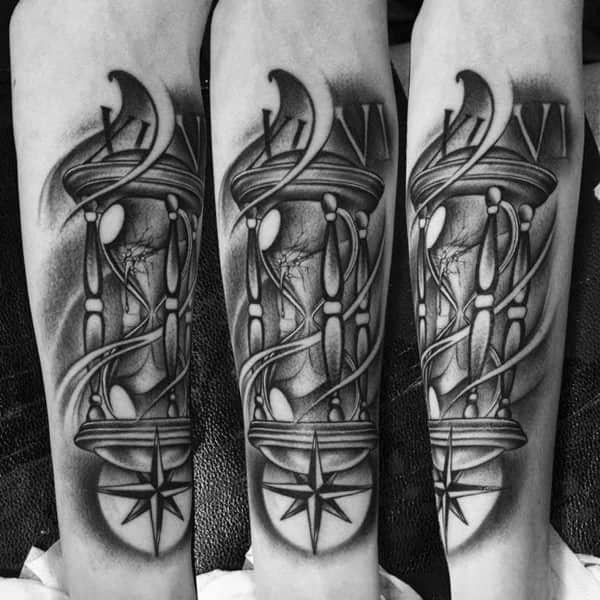 The design was used by the sailors as a way of measuring speed and time. The beautiful shades and colours used looks spectacular. 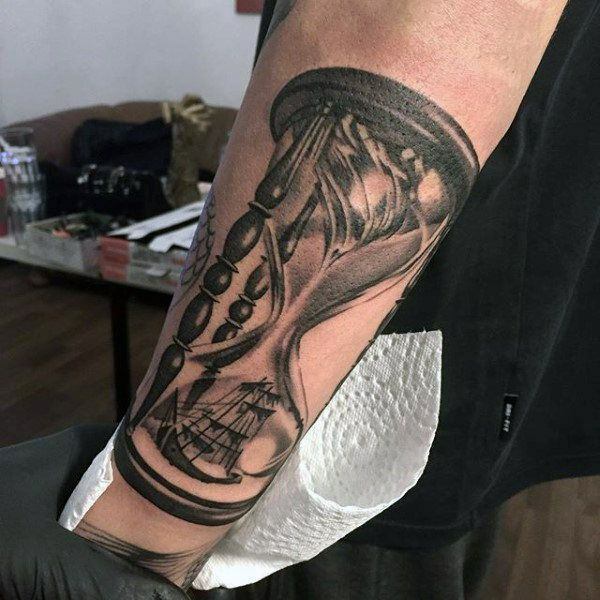 The arm is a good placement for the hourglass tattoo and it seems like a good expression of the sea life and features shown. 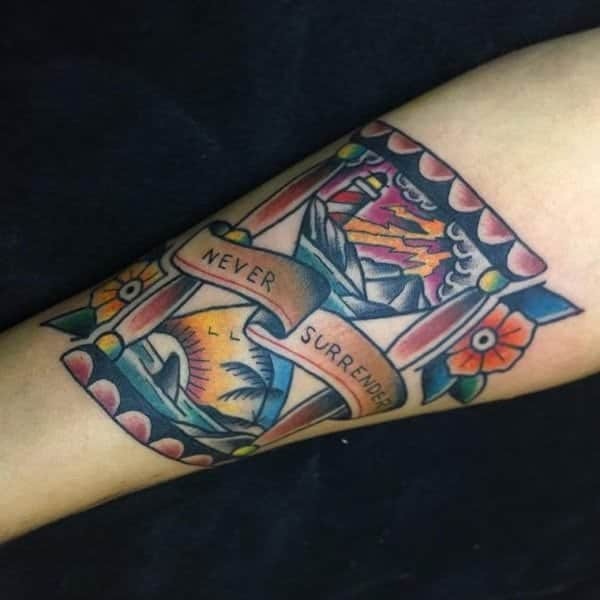 The design below expresses a magnificent and unique outlook. The dark shades blend well with the body complexion. 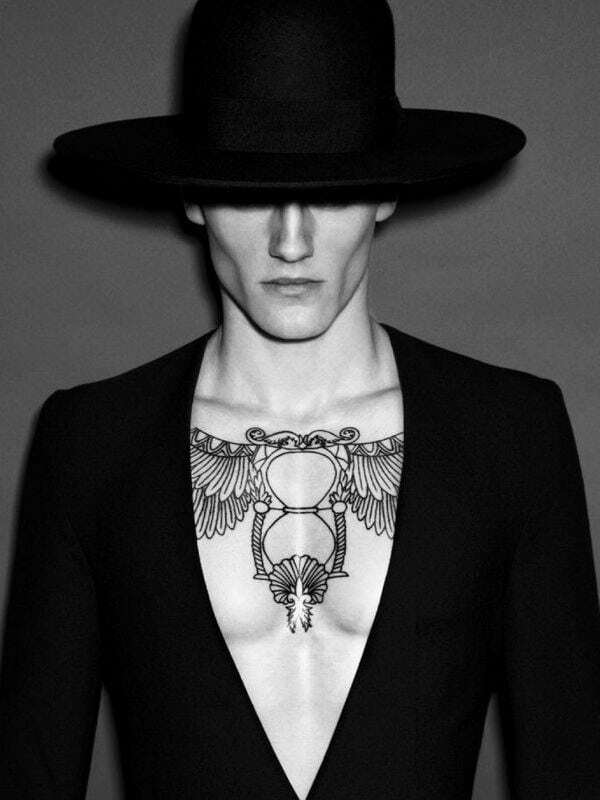 The placement is magnificent as it beautifully enhances the masculine features of the wearer. 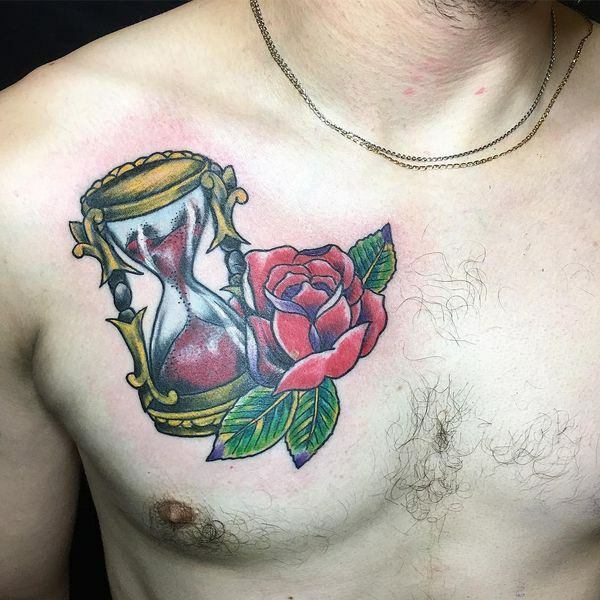 The combination of roses in an hourglass represents the beautiful side of the design. 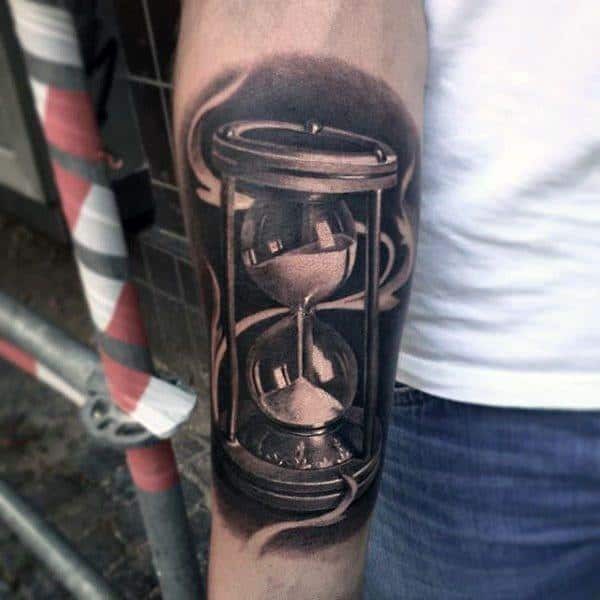 It shows the beauty of time and elegance. Use a good fusion of colours to make the entire design pop and also adds glam to the design. 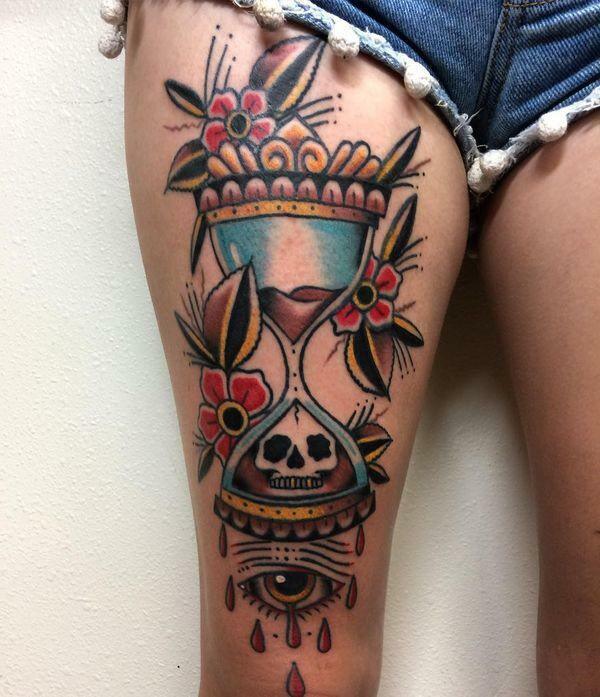 Wearing hourglass tattoos on the thigh is an adorable expression. 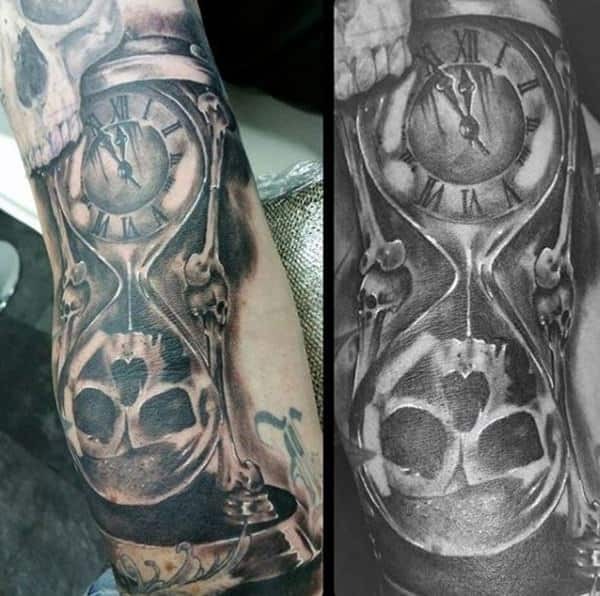 The black and grey colours used in the design makes a beautiful combination. 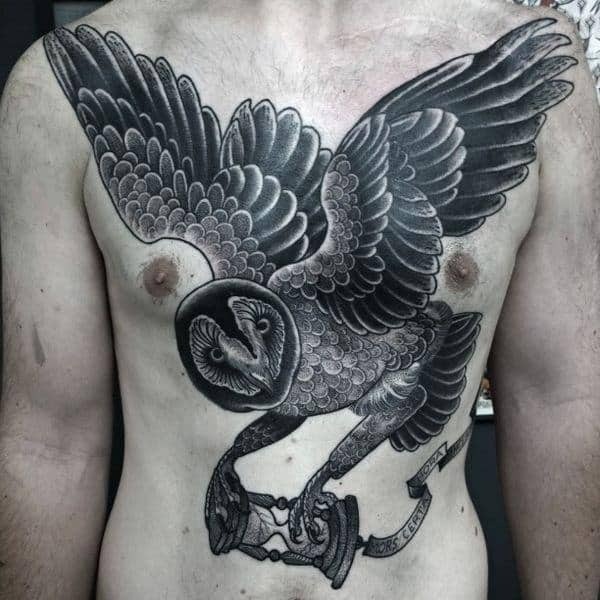 The incorporation of the owl into the design is a good expression of wisdom, protection and knowledge. 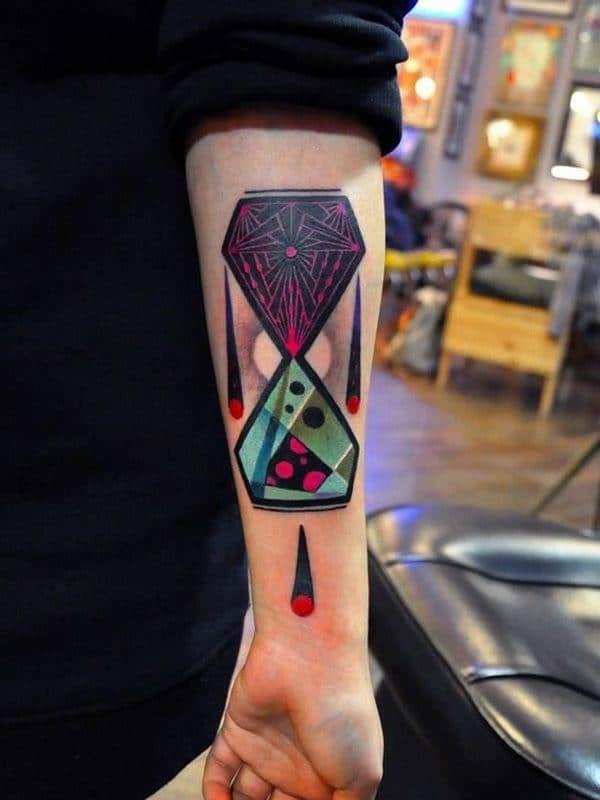 The tattoo design below expresses the beauty of being trapped in time. 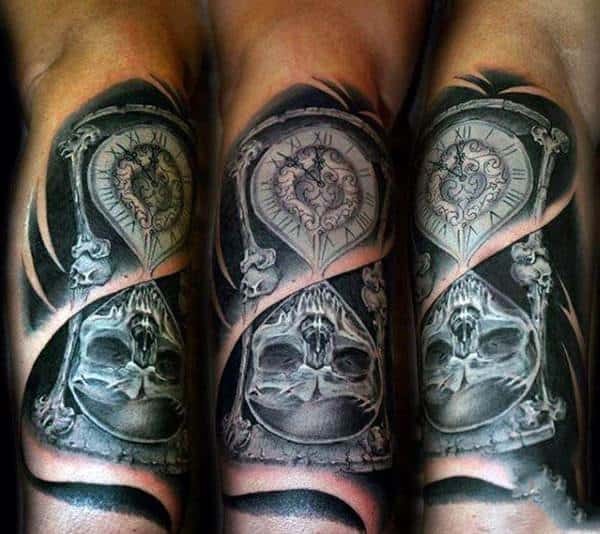 It also looks cool with the intricate patterns and symbols adding in contrast to the design. 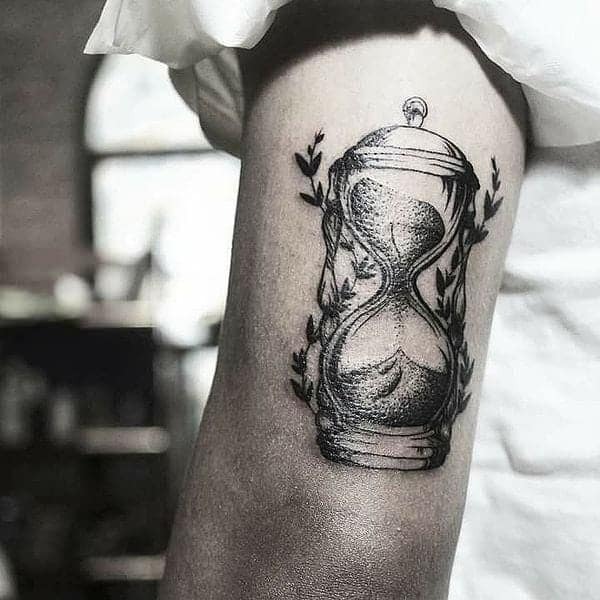 Hourglass tattoos can also be inked in such a simple and elegant way. 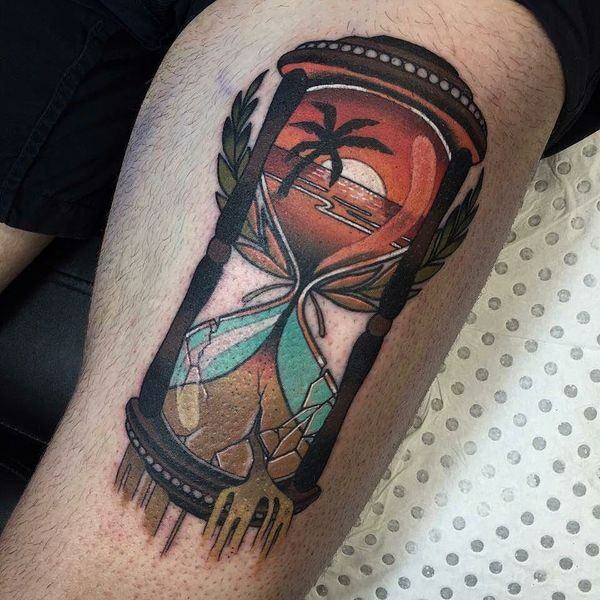 The tattoo design below looks spectacular with the dropping sand expressing a beautiful outlook. 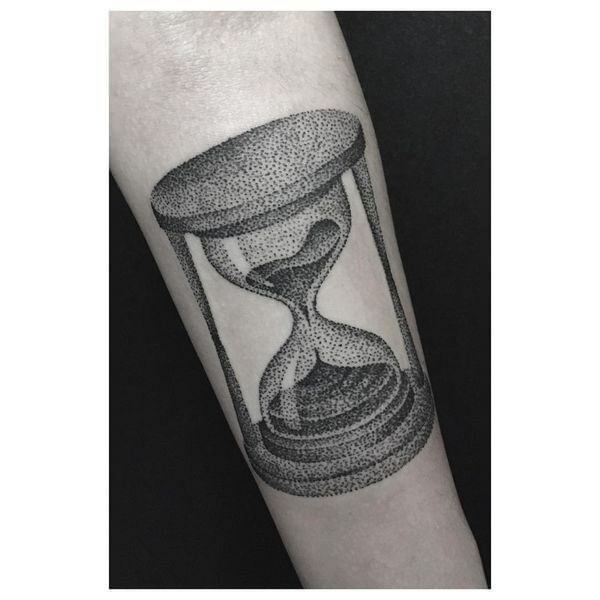 The stippling work in the hourglass design below is both stunning and scary. The combination of different colours enhances the overall outlook of the design. 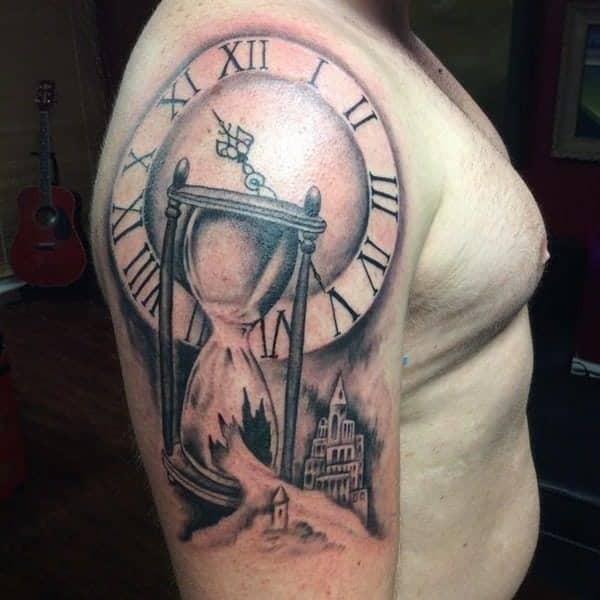 The design below expresses a magnificent and unique outlook. The combination of blue and red colours makes a great combination. 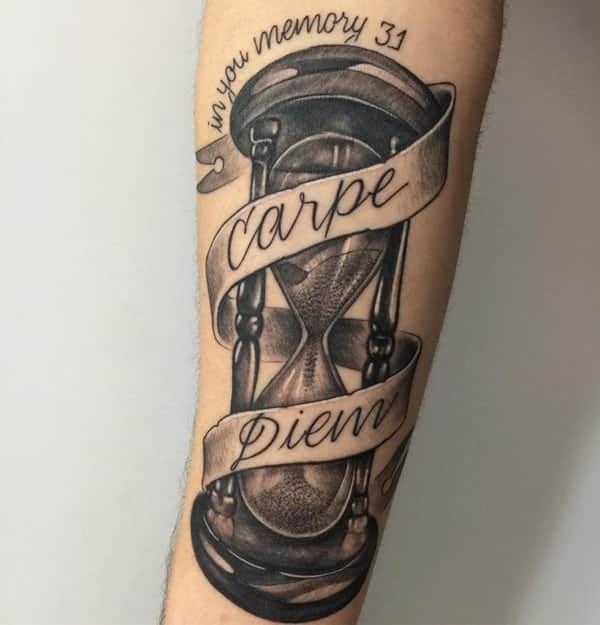 If you are inspired with wide tattoo ideas then you can consider going for the one below. Bring in contrast with intricate arrows that make the entire design to look complex. Colourful designs have a way of enhancing such a cool and stunning outlook. Wearing it on the lower armpits as the one below looks great and magnificent. 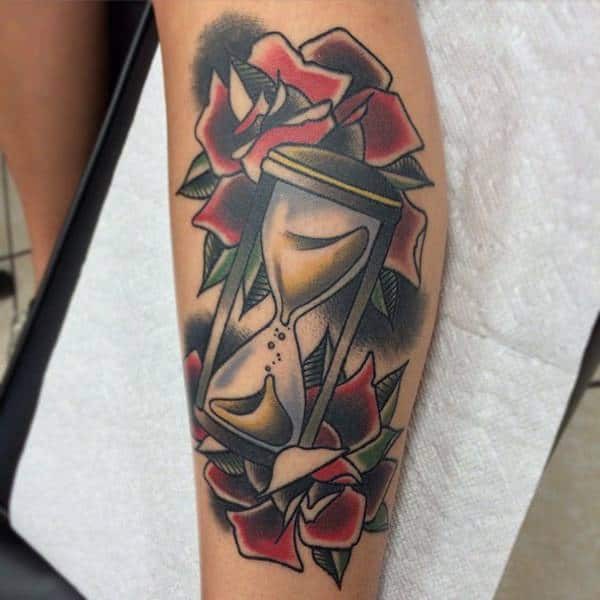 There are different meanings associated with hourglass tattoo designs and knowing them is vital. 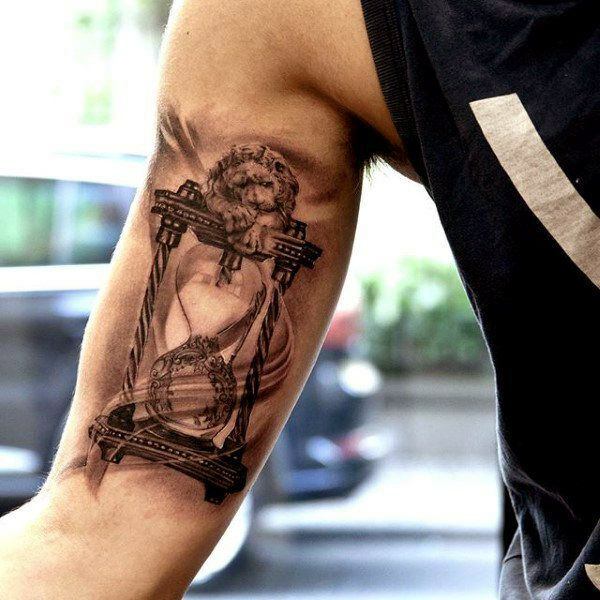 Apart from being intricately designed, the placement of the tattoo also enhances its outlook. You can also make the wide hourglass tattoo into a magnificent outlook like the one below. 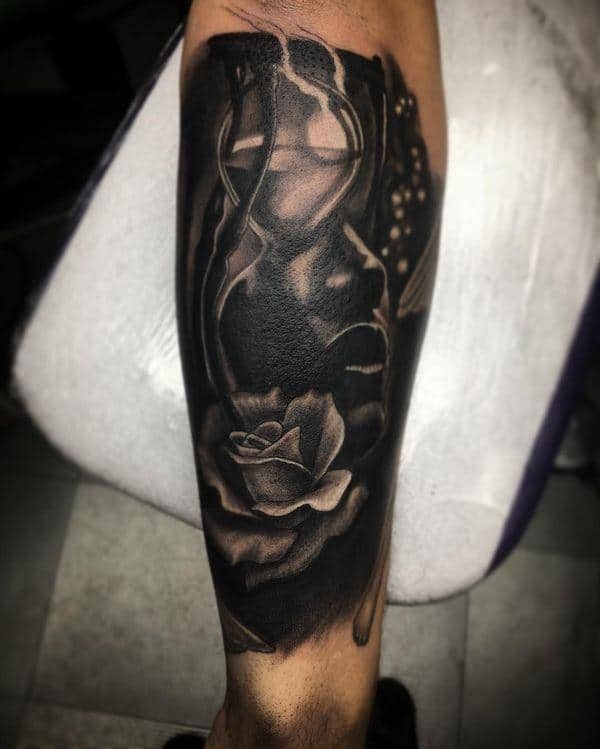 The addition of the roses creates such a fabulous look. 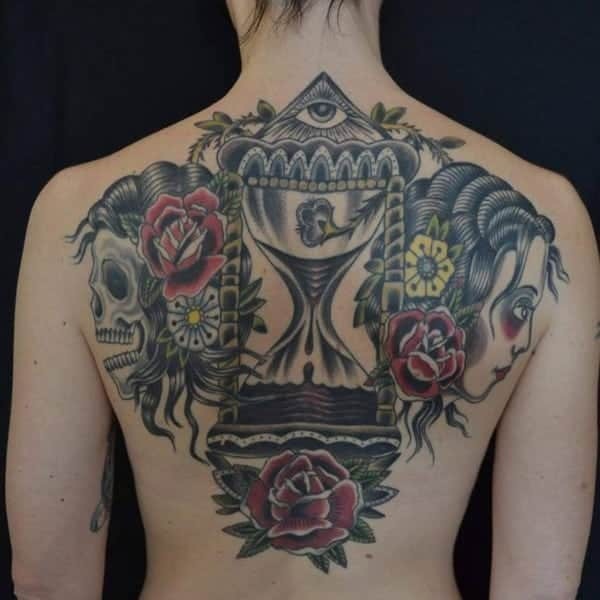 The hourglass is normally associated with women given its smooth and curvy outlook. That’s a fact that makes it to be so appealing. 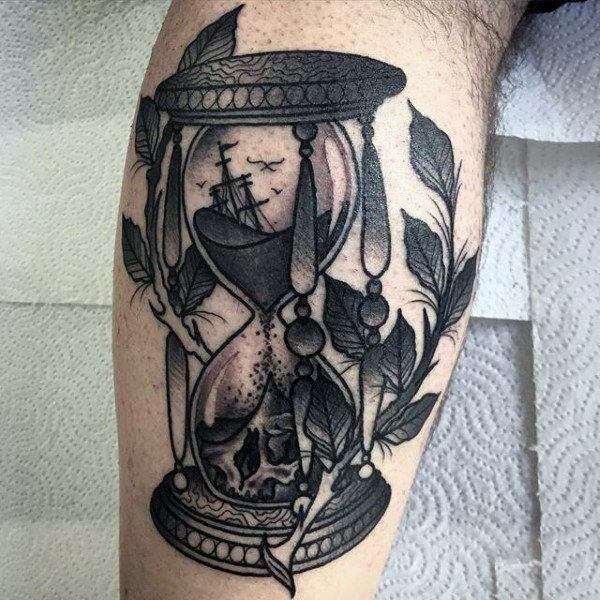 The candle above the hourglass design below creates such an epic and beautiful outlook. 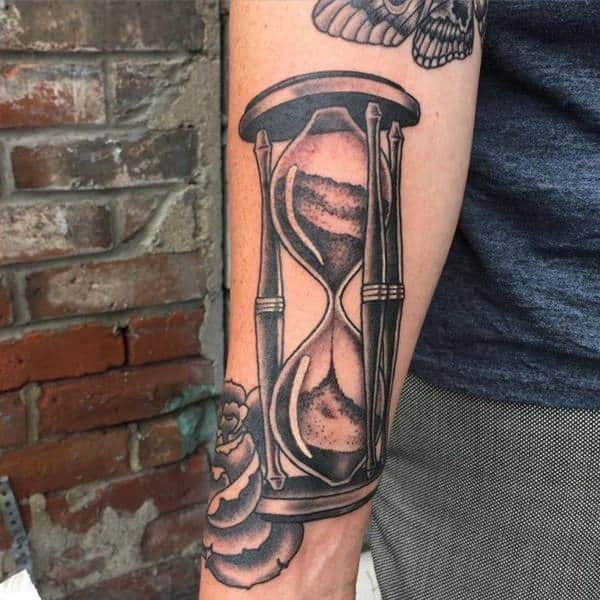 The dark and grey color used looks magnificent on the arm where it’s worn. You can express that surreal and magnificent outlook as expressed in the design below. The colour combination and the features used look magnificent. 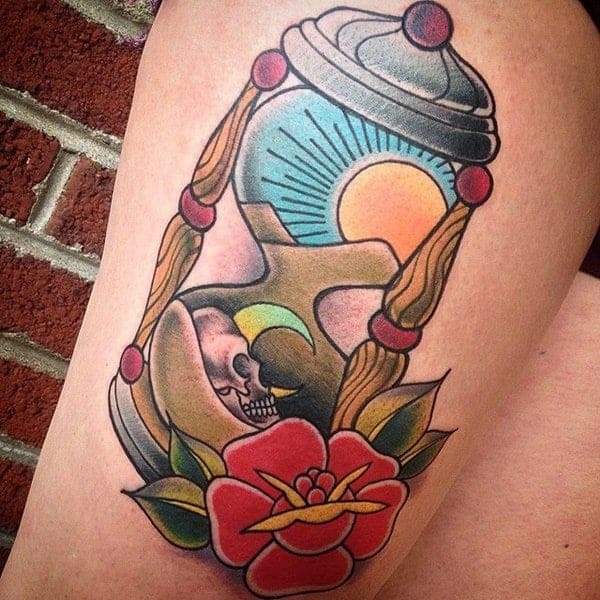 This is a magnificent old school piece with the heart captured in the hourglass tattoo design. The color combination is beautifully balanced. 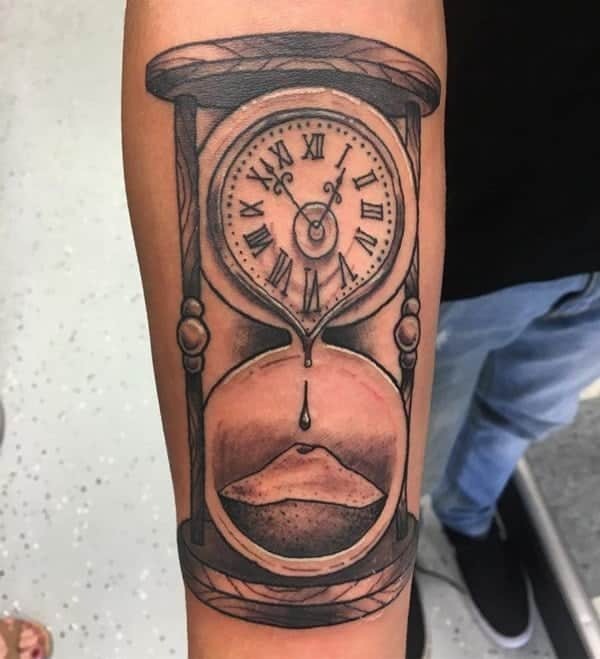 If you desire to show off those muscular body features then there isn’t a better way unlike covering the area with hourglass tattoo. It expresses the masculine features in such an adorable way. 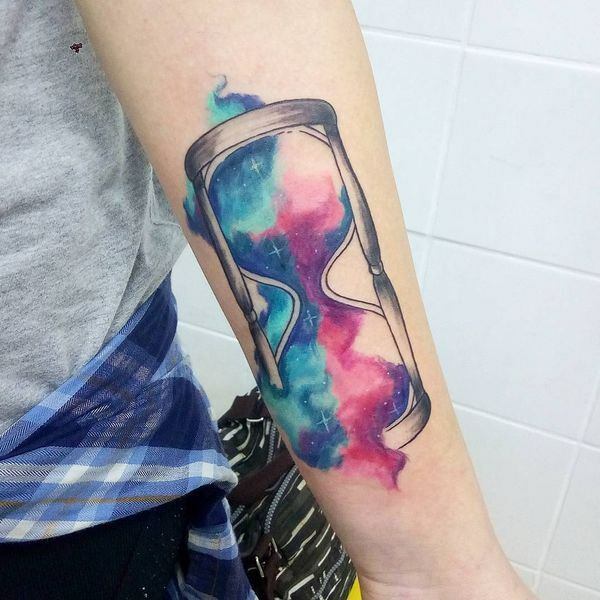 The design below looks cool on the sleeve where it’s worn. The peeping eyes express an adorable outlook. The design below looks magnificent on the sleeve with the incorporated features creating such an appealing outlook. 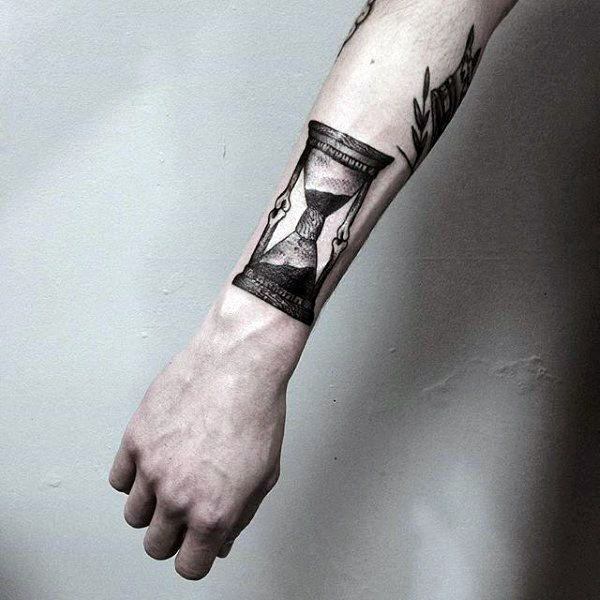 The grey geometric hourglass tattoo design on the sleeve looks cool. The dark and grey hues also blend well so well with the wearer’s complex. 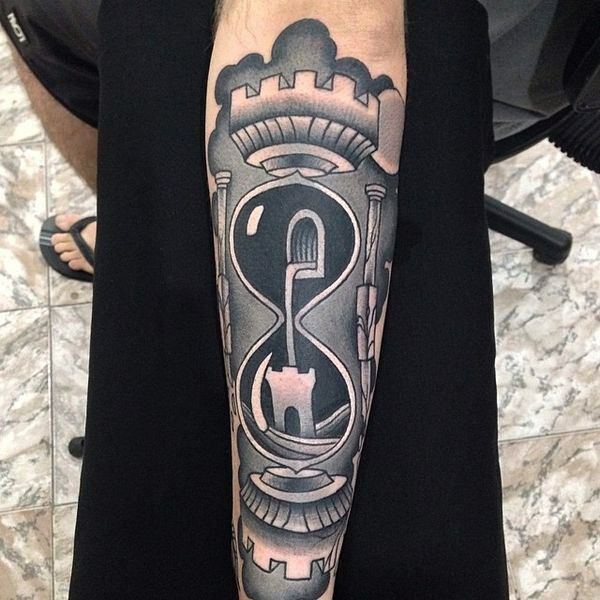 The hourglass tattoo design below is intricate, surreal and quite thought-provoking. The floral features consequently add to the overall appeal of te design. 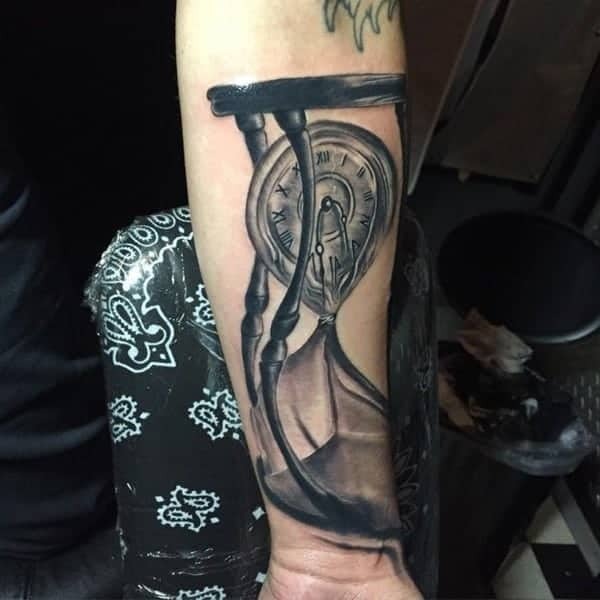 The hourglass tattoo design carries valuable lessons with the greatest being placing value on time. Use of symbols such as the sea, moon and waves are some of the noteworthy elements that make the design to stand out. 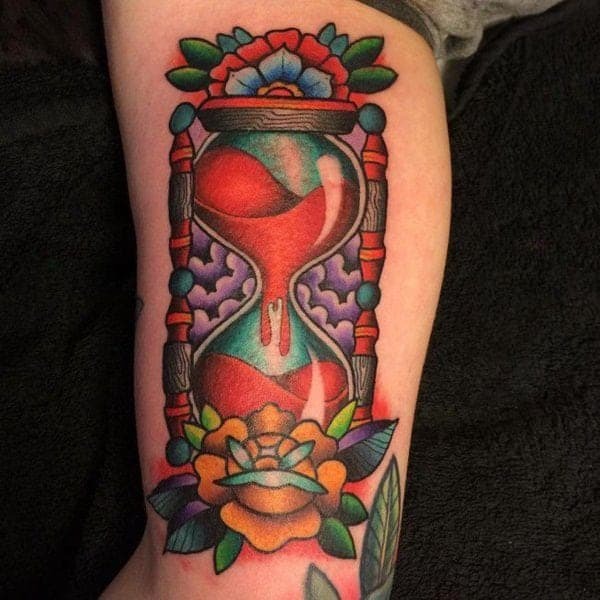 The floral hourglass tattoo design below looks spectacular with the beautiful colours blending so well. 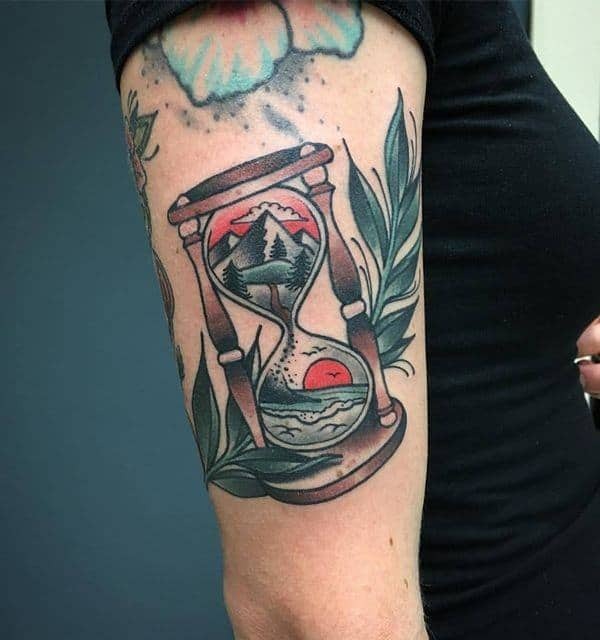 The shoulder is an ideal place for wearing hourglass tattoos. 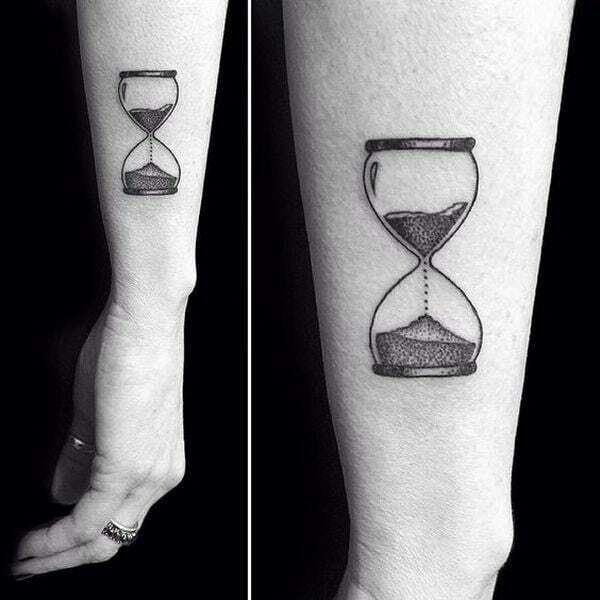 The hourglass tattoo can be inked in different shapes and styles as per the wearer’s preference. You can personalize your design by incorporating elements that appeal to you well. 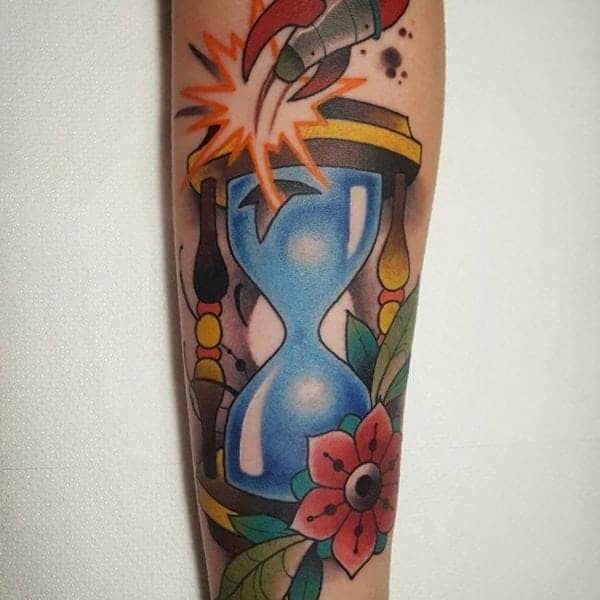 The unique shape of the hourglass is also an element that many people find to be appealing. 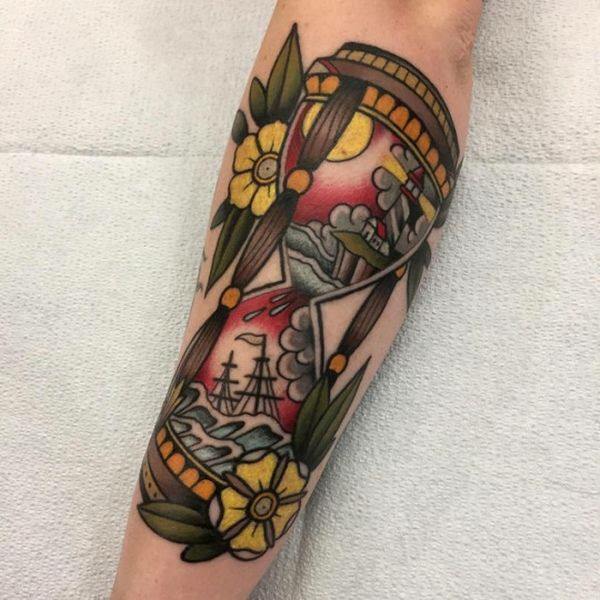 Hourglass tattoos have been associated with seafarers with the addition of the features to the design also adding to the beauty of the design. 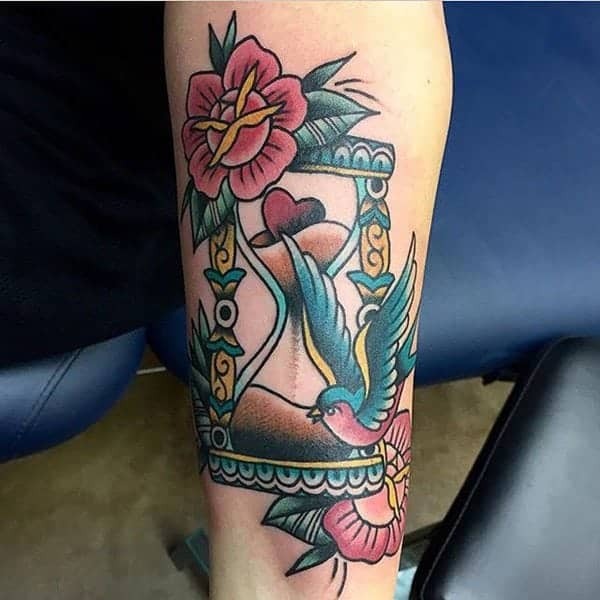 The desperation of the mother bird as it glances through the hourglass tattoo design expresses some element of frustration. It’s something that many can identify with. 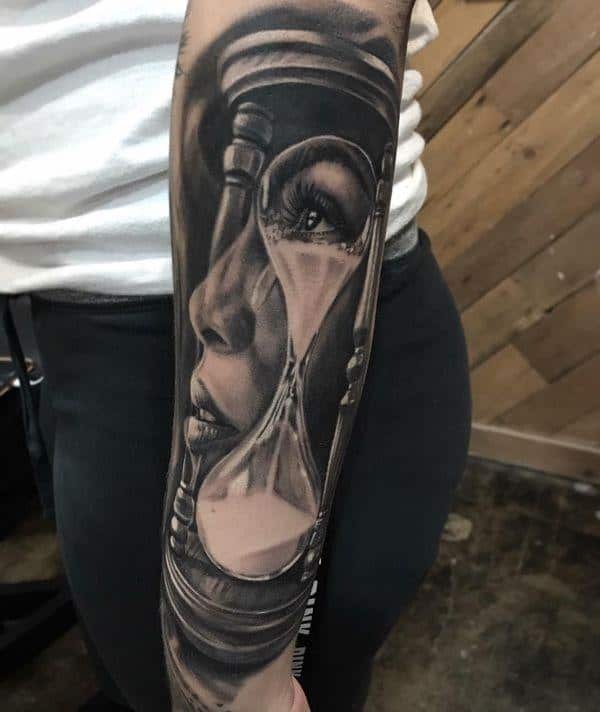 The sleeve hourglass tattoo design looks so pretty on the wearer with the grey shades blending so well with the wearer’s complexion. 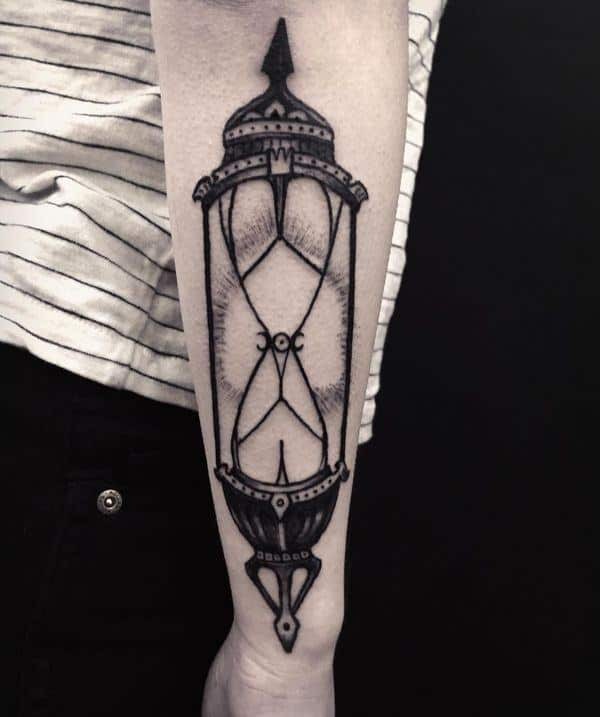 If you’re not a fun of large tattoo designs then you can consider going for the minimalist tattoo design like the one below. 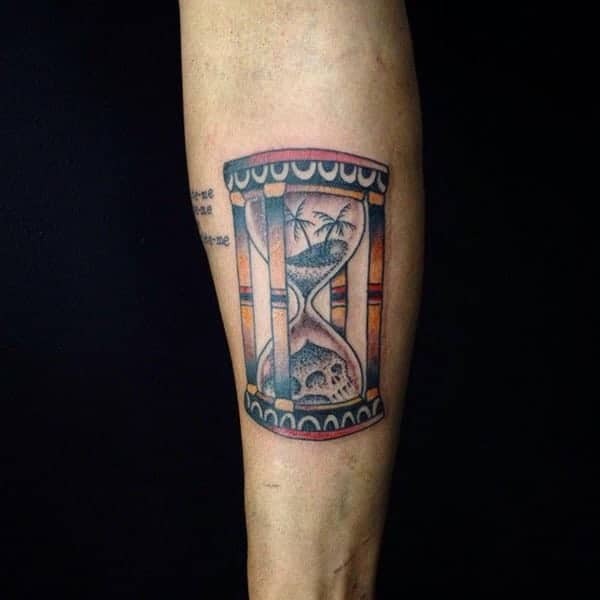 The hourglass tattoo design below looks adorable with the golden hues enhancing the overall outlook. 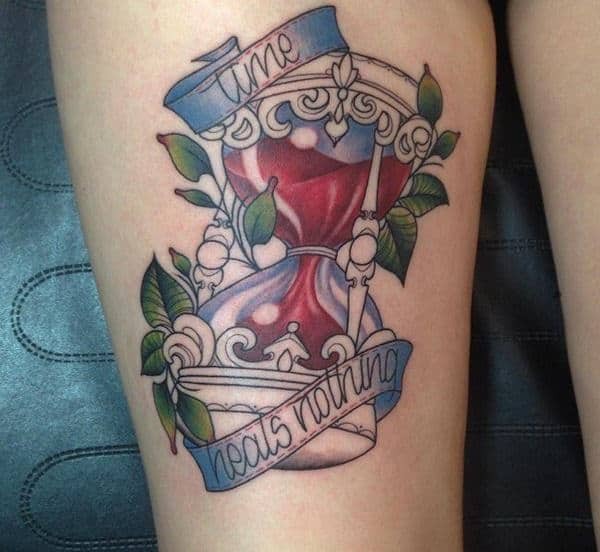 Broken hourglass tattoo design below expresses the brokenness and missing pieces that happens in time. The grey shades and the black hues look quite amazing. The blue shades create such an amazing blend with the other colours. 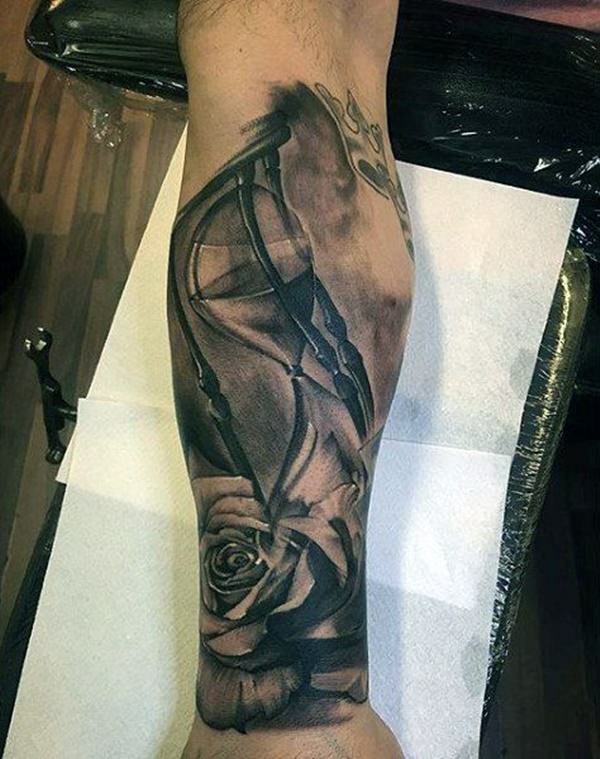 The addition of flowers also adds in contrast which makes the entire design to so amazing. The minimal colour shades used beautifully enhances the appeal of the design. 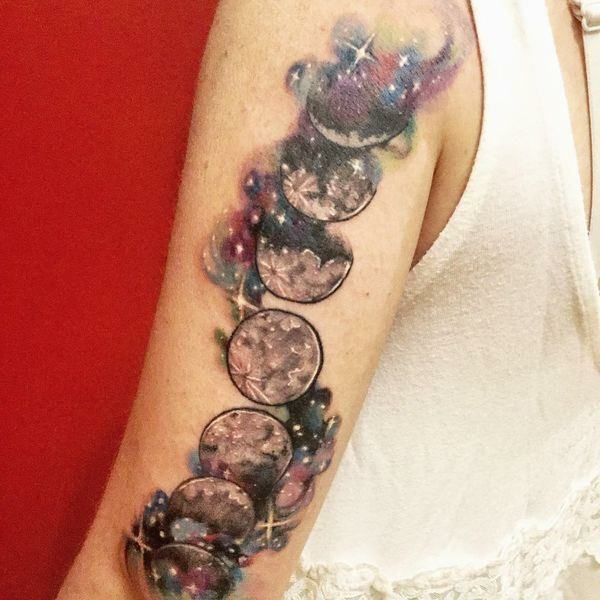 Such an adorable piece of design that beautifully fits on the forearm. The dark and grey shades also create a beautiful contrast. 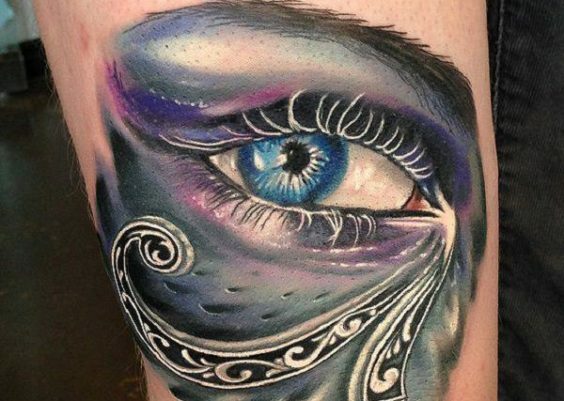 A spectacular design that’s quite eye-catching and worth trying out. Expression of the tree and root symbols also express a magnificent appeal. The design below expresses a combination of scary and stunning features which creates a magnificent look. The elements incorporated in the design below enhances the level of complexity and beauty. 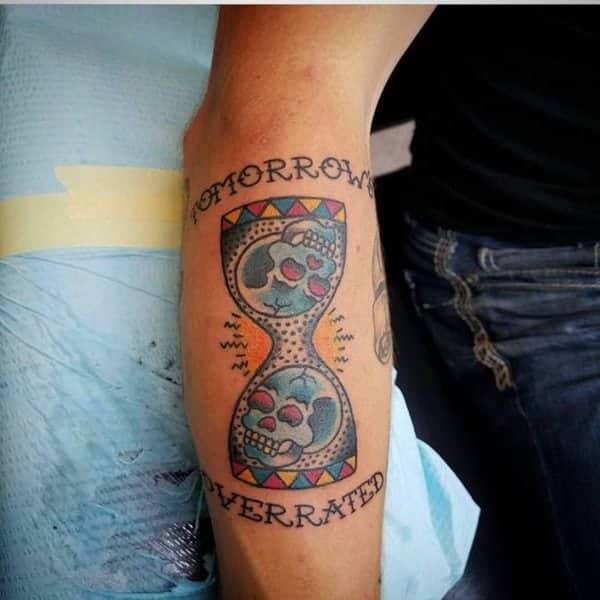 Tomorrow overrated is another spectacular quite that connects with the hourglass tattoo well. 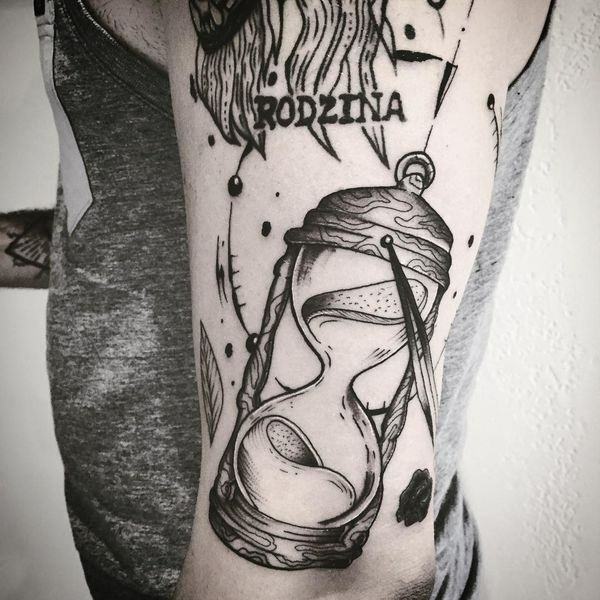 Amazing hourglass tattoo with the quotes expressing the passing of time. The combination of floral and colourful features in the design below looks amazing. Time is a key resource and having something that continually reminds you of it is great. 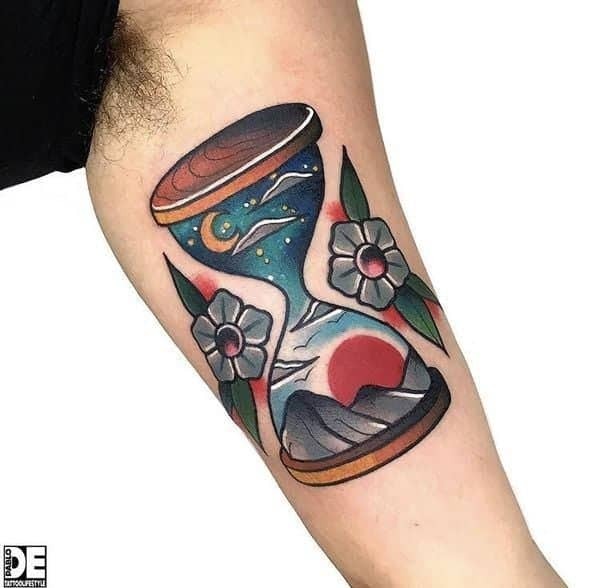 As much as the hourglass is mainly used to symbolize time; it can also be used to symbolize other things like life, death amongst others. 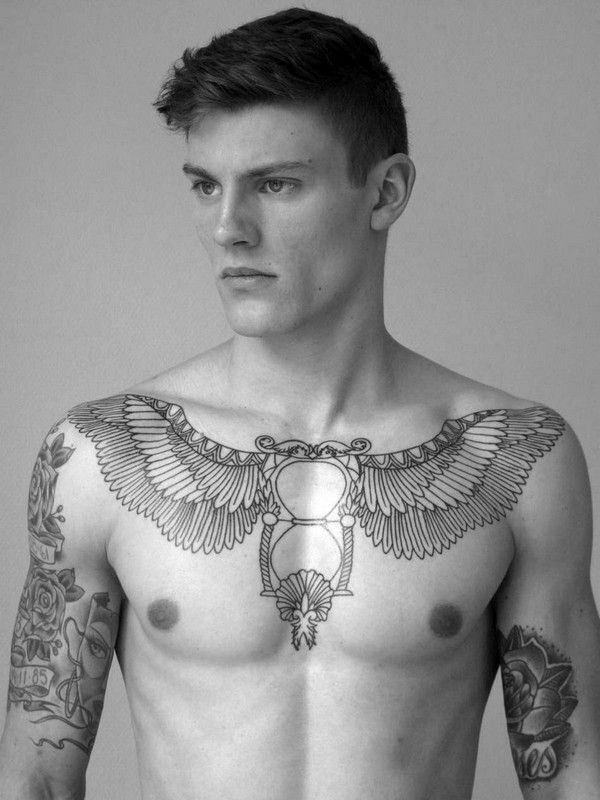 The tattoo below looks magnificent and can be worn by any gender. The colour combination also looks great. 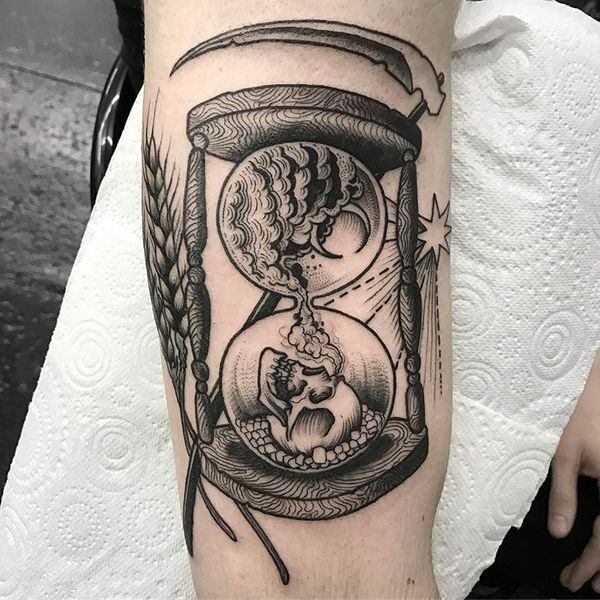 The design below expresses the unique connection between life and death. The upper part looks vibrant with lots of activities taking place. The features incorporated in the design below adds to the beauty and elegance of the design. 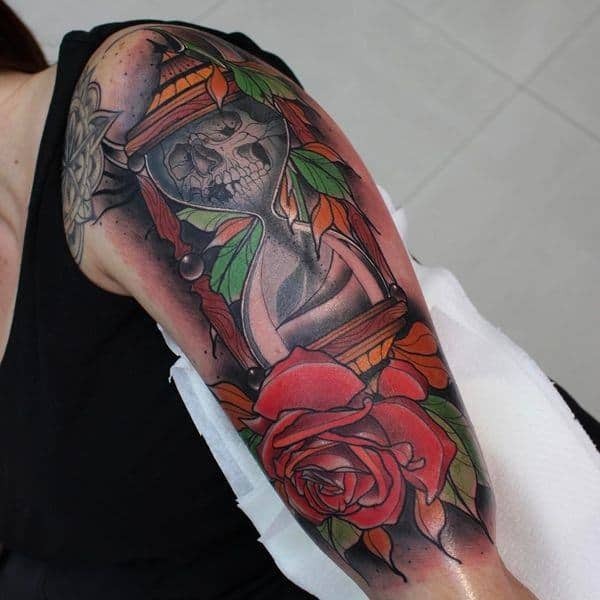 Amazing design with a combination of colours that richly expresses the meaning associated with the tattoo. 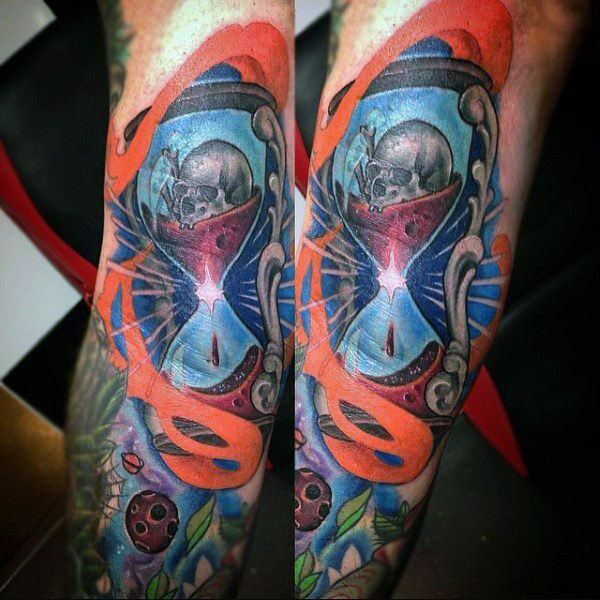 Tattoo enthusiasts and artists are always on the lookout for innovative design ideas. Below is a fabulous piece of work. Attain that appealing outlook by combining colours that blend well with your complexion. 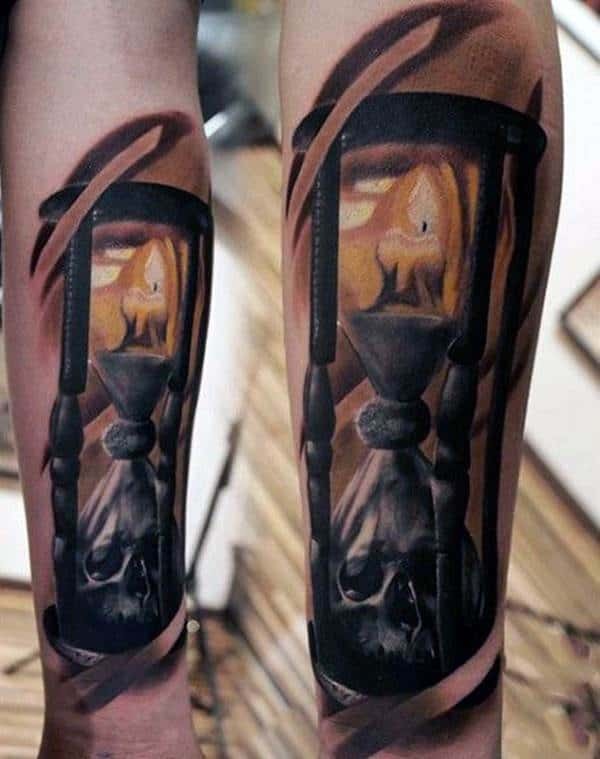 The use of fiery images alongside the hourglass looks spectacular. It also draws attention on the wearer. 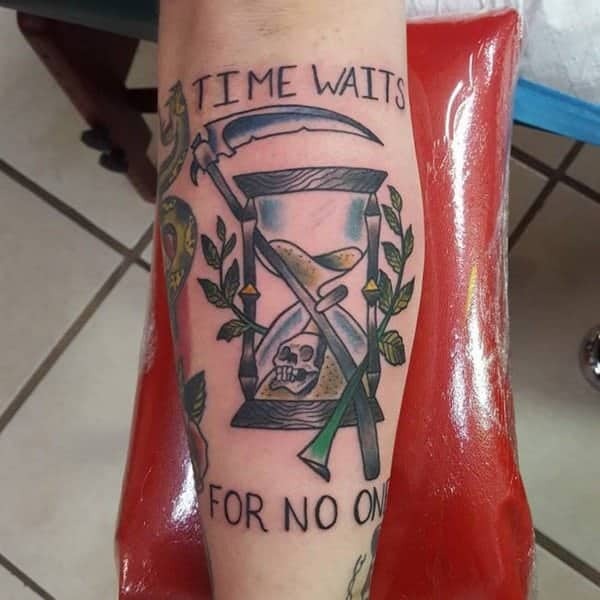 Time waits for no one is a great quote that expresses a rich meaning to the tattoo below. The beautiful rose flowers and the purple and green colours express a rich meaning of the design. 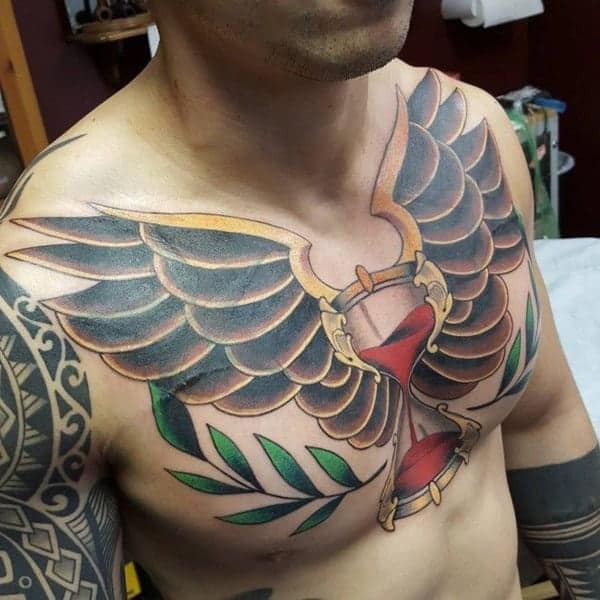 There is no better way to enhance your muscular features like wearing a tattoo on the chest. 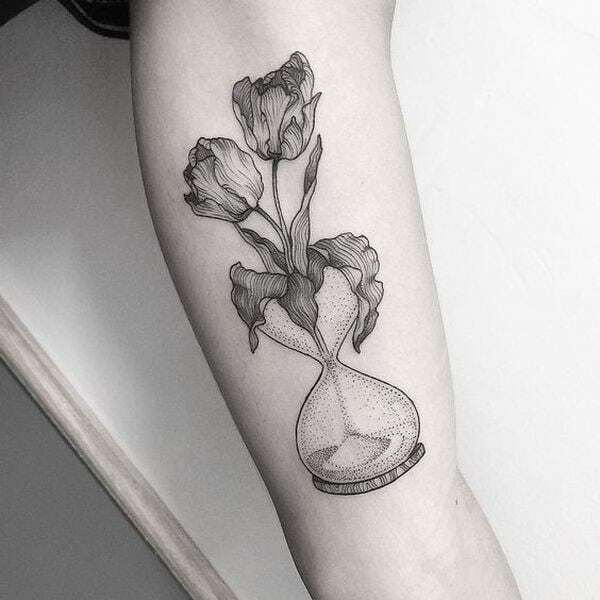 Use of flowers together with the hourglass has a way of enhancing the beauty of the design. 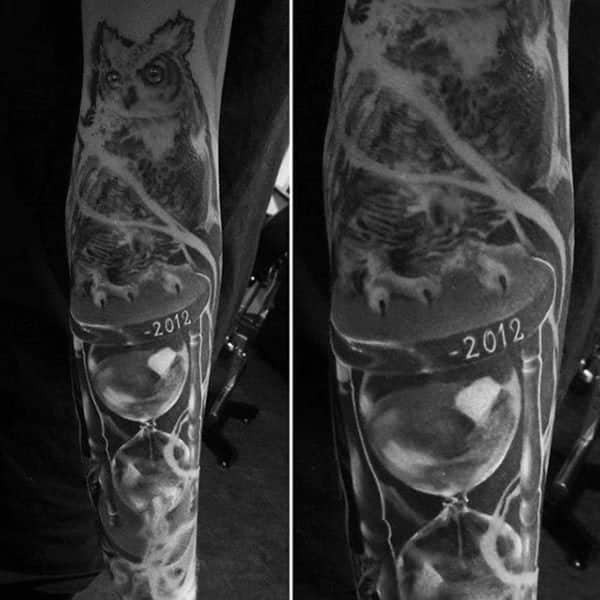 The incorporation of the owl tattoo with the hourglass looks spectacular. 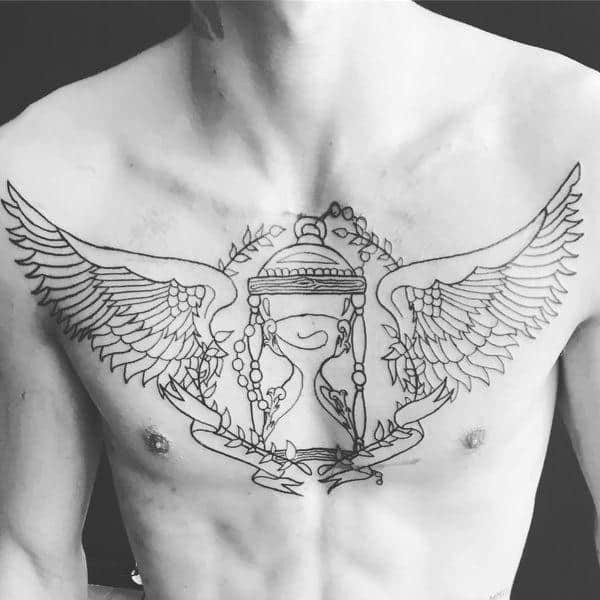 The design is quite vast and also captures the chest area quite beautifully. The combination of grey and dark shades have a way of enhancing the designs overall outlook. If you are looking for something with fewer features yet very intricate then consider the one below. 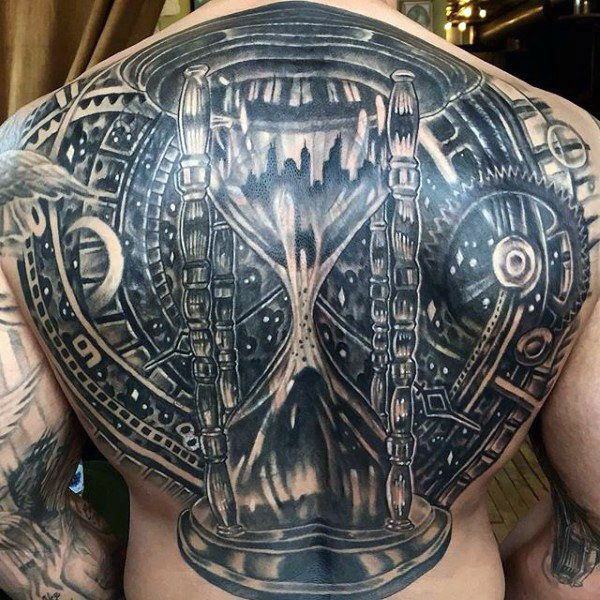 Wearing large tattoos that cover the entire back has a way of enhancing one’s features. The design below looks epic. 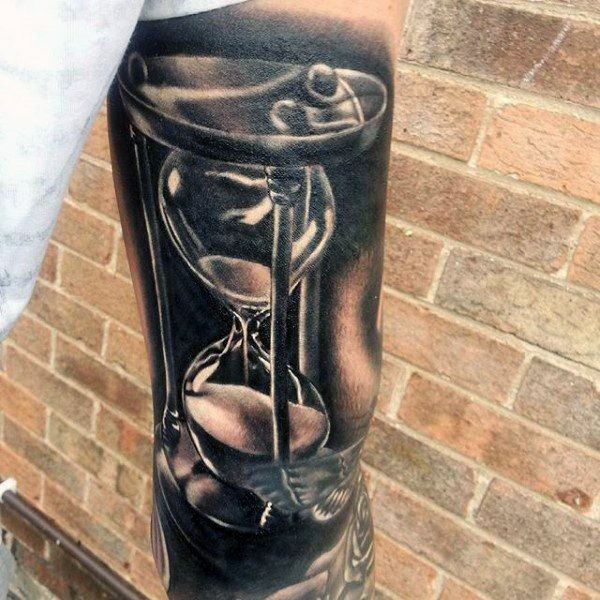 Combining the hourglass with the clock is a rich way of expressing the meaning. 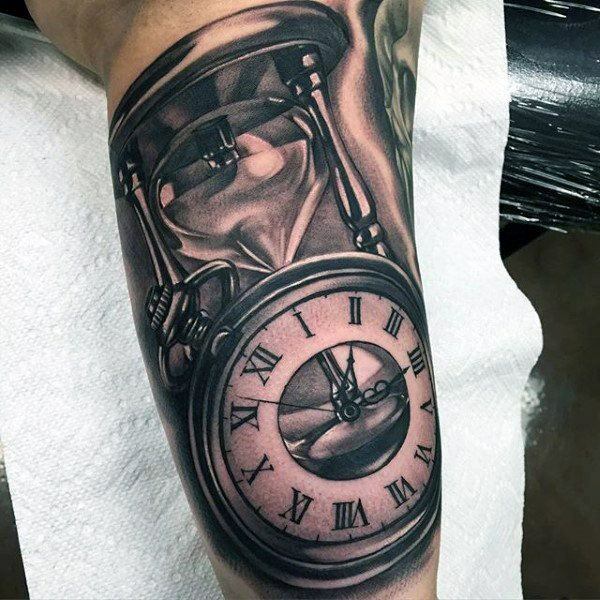 The clock used in the tattoo below expresses a deeper meaning of what the tattoo entails. The combination of beautiful flowers with the design has a way of enhancing the body features. 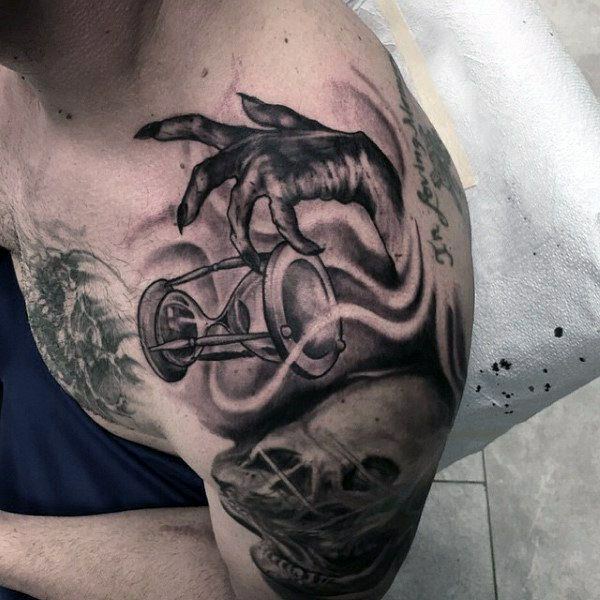 You can add somelittle scare to your design just like in the tatoo below. 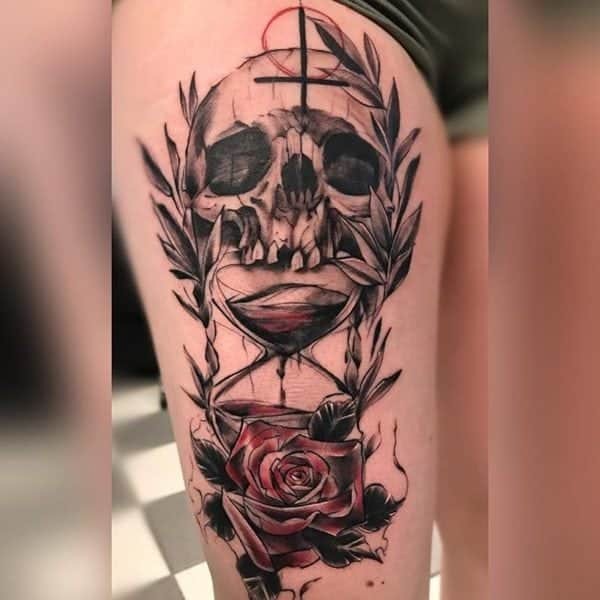 The design below looks great on a lady. It has a beautiful colour combination that enhances the overall outlook. Enhance the beauty of your design by adding some florals. 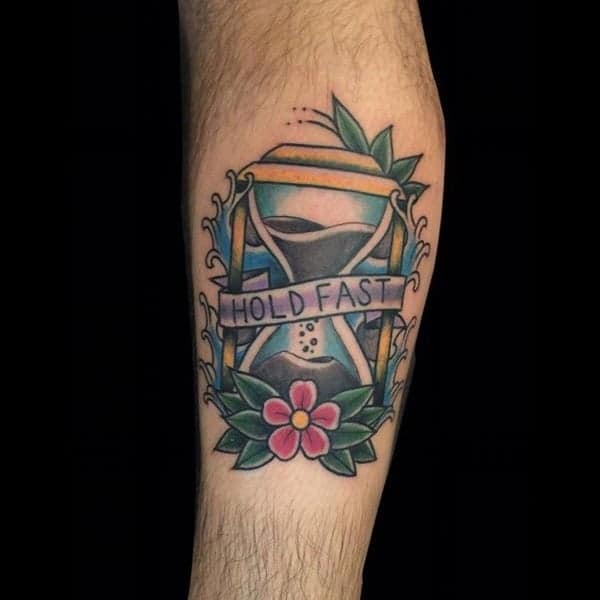 Hold fast quote acts as a beautiful reminder of what the tattoo means. The design below is a complex piece of artwork. The elements used and the colour combination expresses complexity which is hard to interpret. 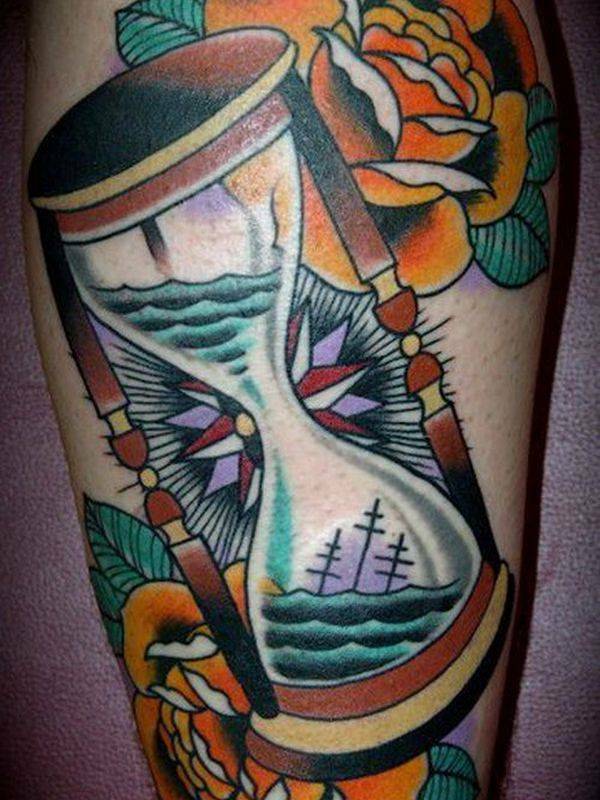 The anchored hourglass tattoo below expresses a deeper meaning that the wearer associates the design with. Stunning design with eye-catching features. Simple and elegant is the best description of the design below. 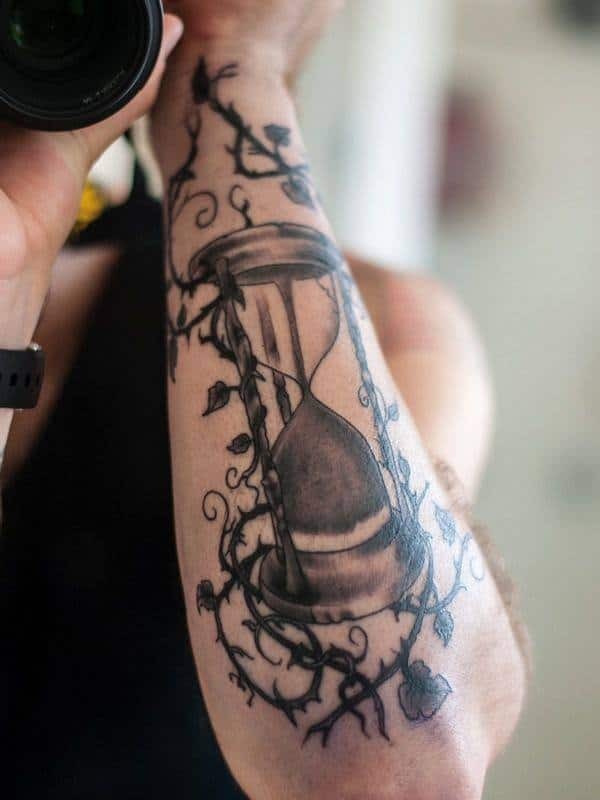 The hourglass tattoo design below looks adorable on the back. 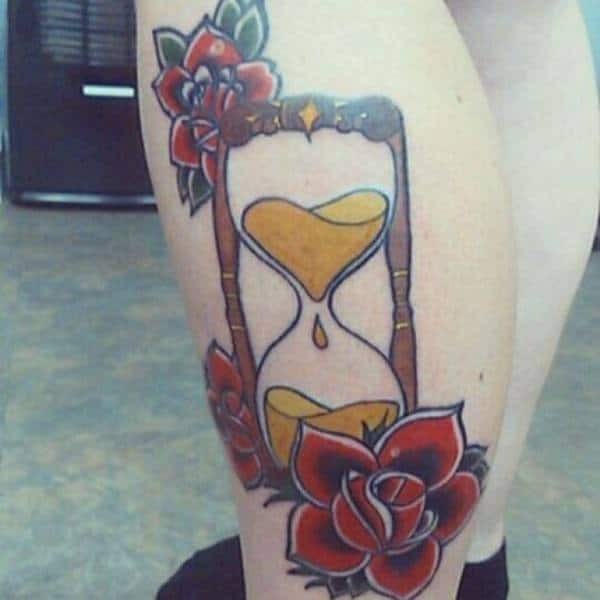 Nice floral hourglass tattoo design. 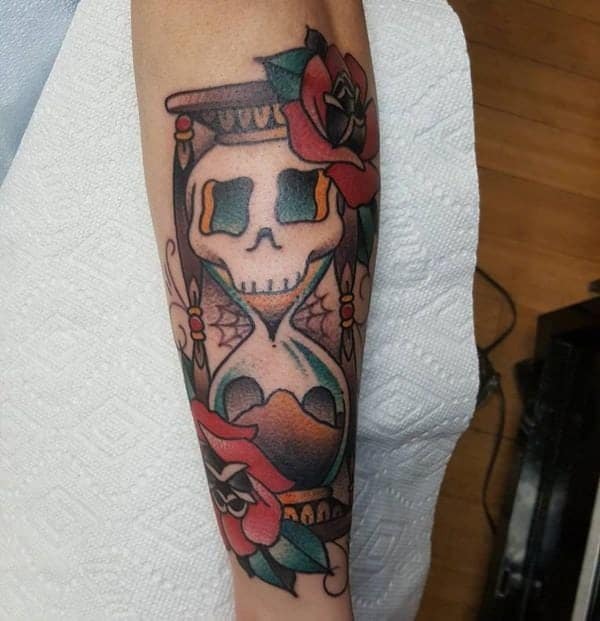 It fits well on the arm. 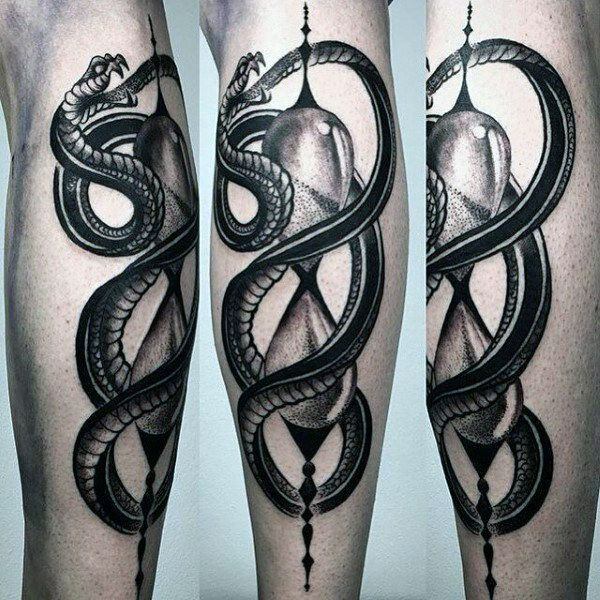 The tattoo design below expresses a dynamic twist which is quite elegant and eye-catching. The bright yellow colour looks stunning and blends so well with other elements. 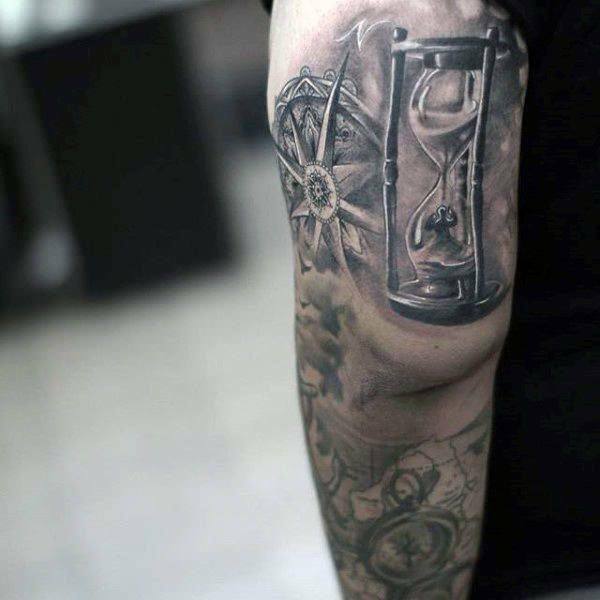 The hourglass tatto looks cool on the arm where it’s worn. It’s epic in all spheres. 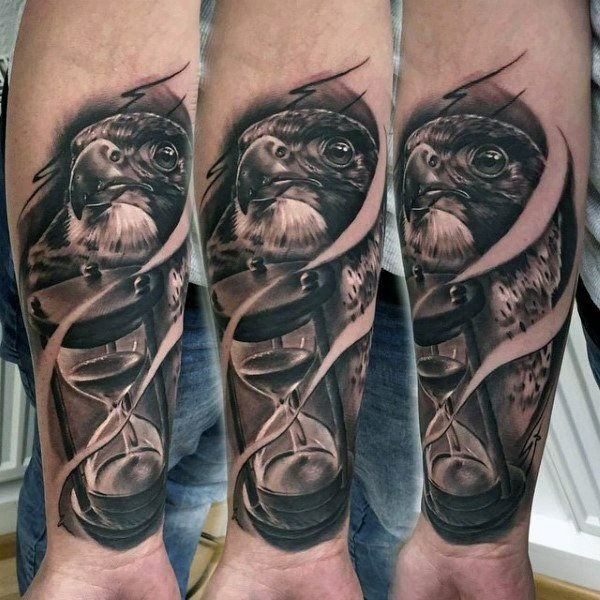 An amazing tattoo design that blends perfectly with the wearer. 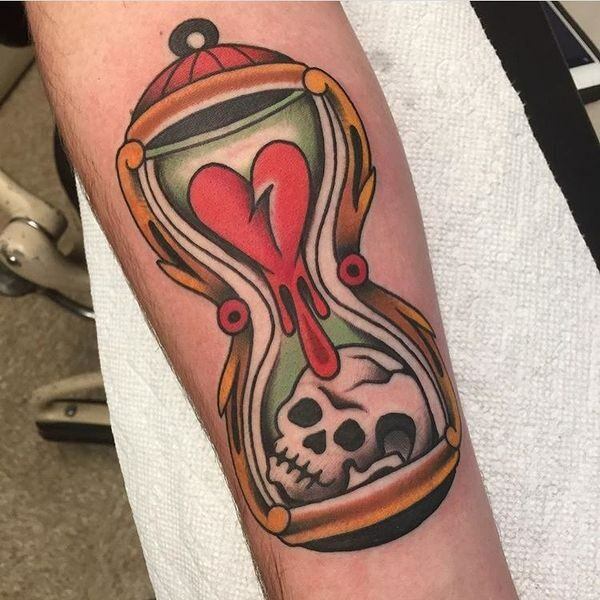 The broken hourglass tattoo design expresses the brokenness that the passing of times makes difficult to mend. 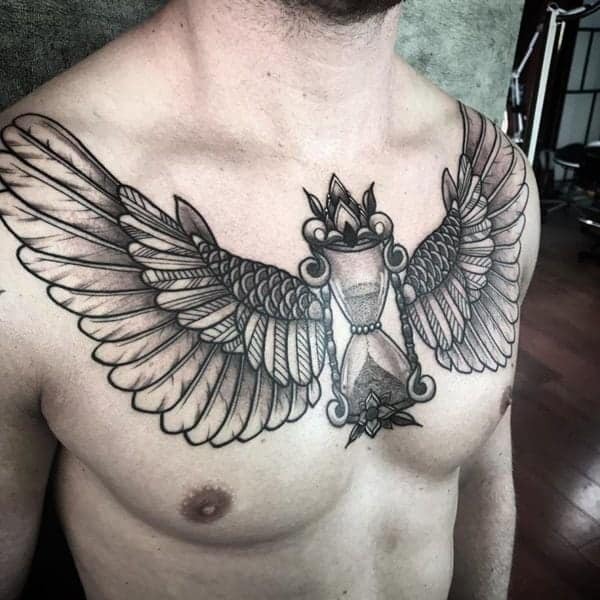 The intricate patterns used in the design below is spectacular and blends well with the wearer. 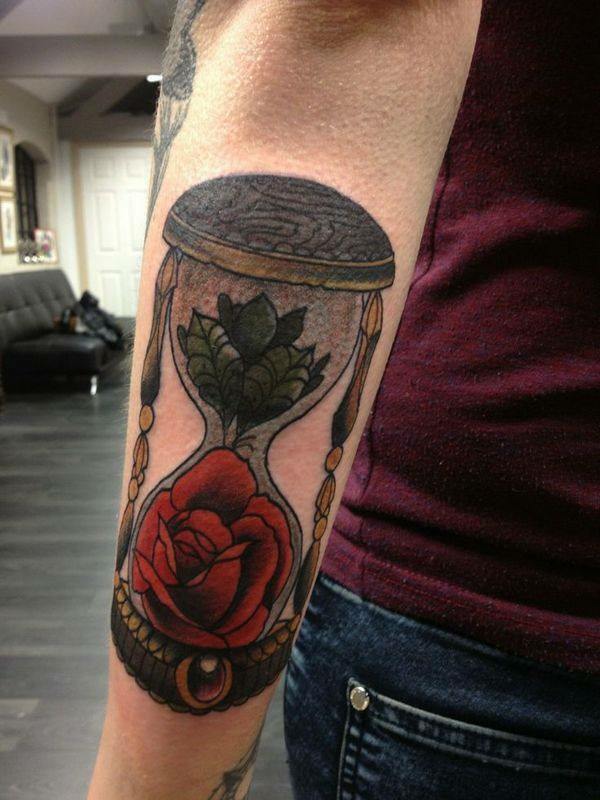 The rose hourglass tattoo designs look nice with the red flowers making the entire outlook to be stunning. 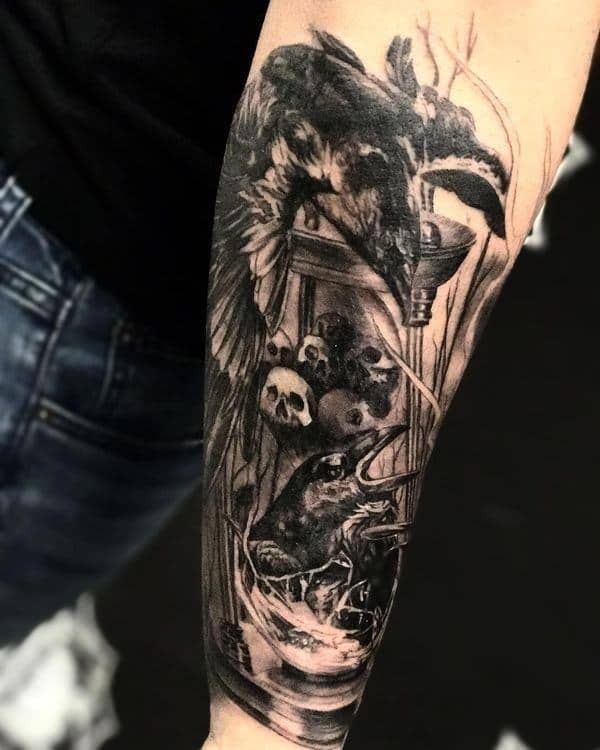 The tattoo design below is a nice piece of artwork. 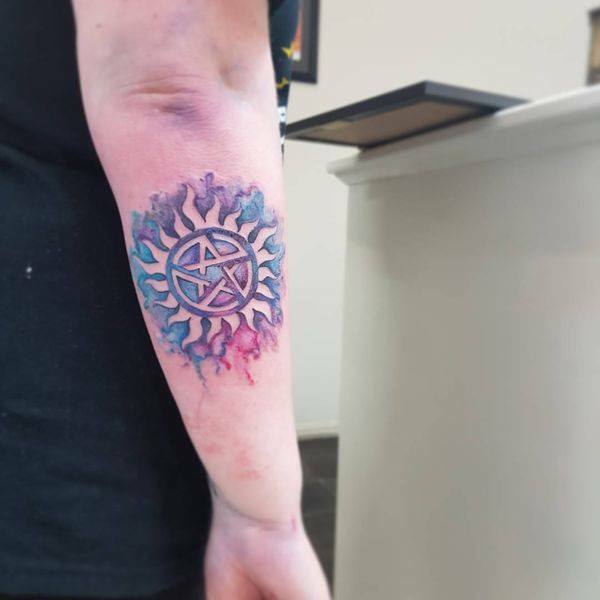 Its great and the colors blend quite well. 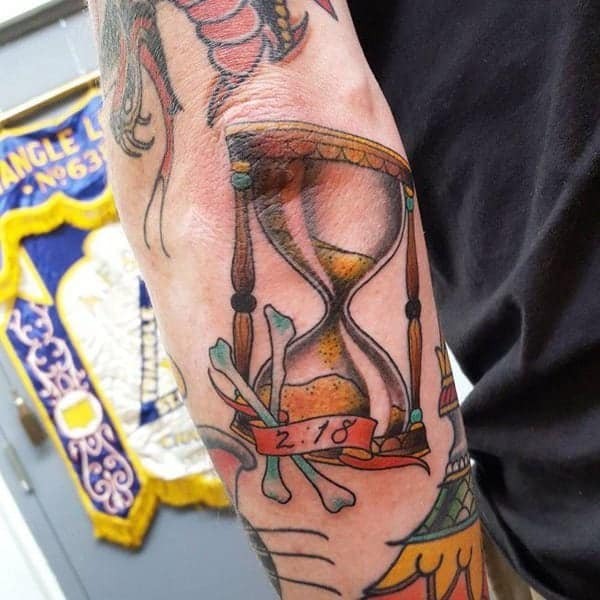 Time waits for no one is a beautiful quote that expresses the value of time. 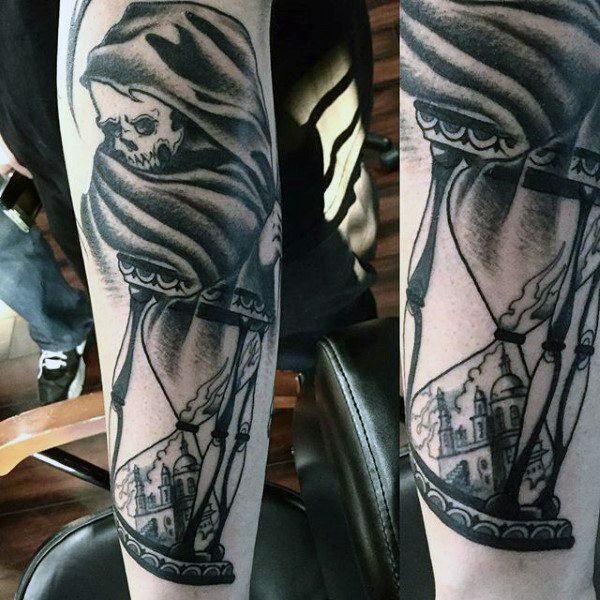 The tattoo below also shows a good contrast between life and death. Amazing colour combination mixed with diverse elements which is so appealing. The black and grey shades used in the design below expresses a spectacular outlook. 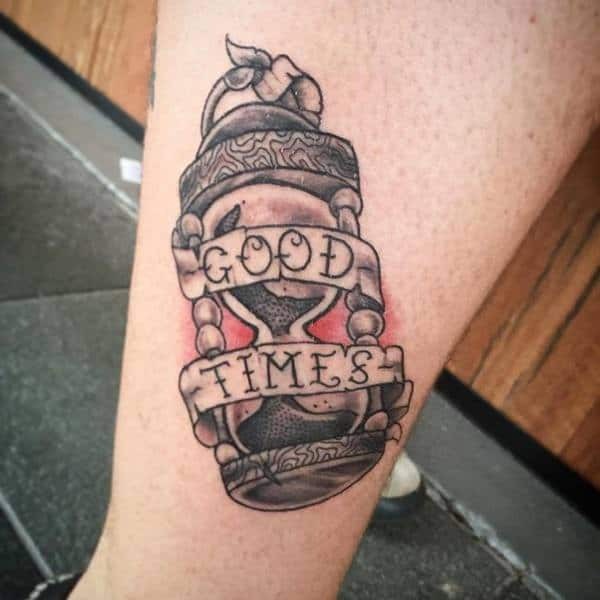 The tattoo design below expresses memories of good times. Such a complex expression of intricate elements that adds to the beauty and elegance of the design. 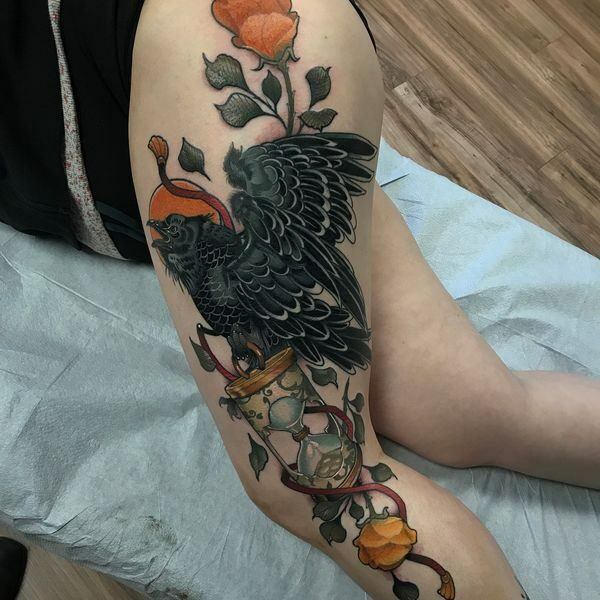 Such an intricate and adorable design that’s worth trying out. It also expresses helplessness that the passing of time represents at times. Vibrant white and the yellow colours used in the design below looks magnificent. 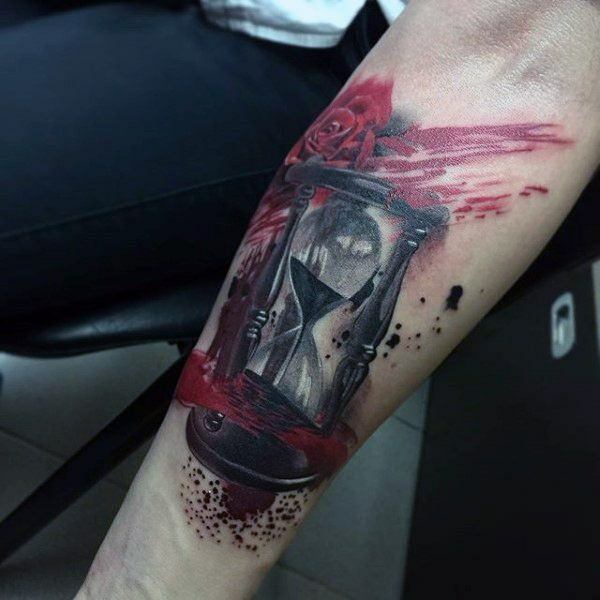 Amazing tattoo design with blood in the glass. 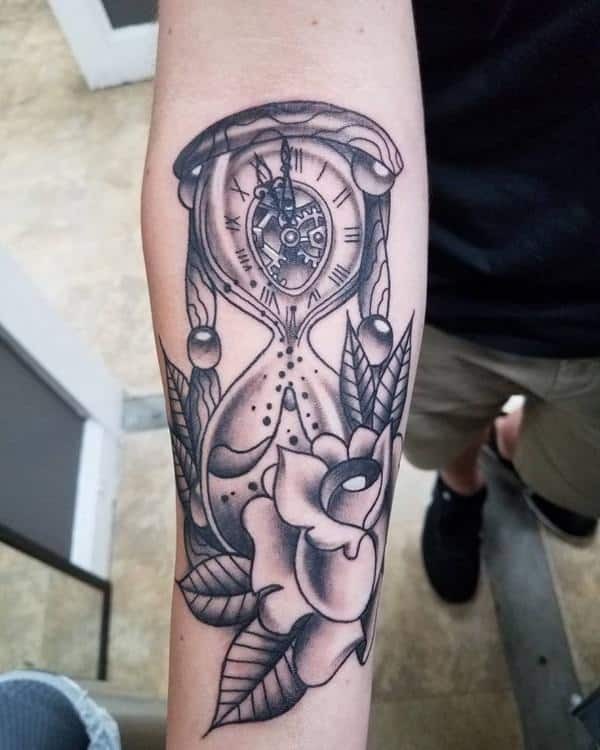 The expression of time heals everything is appealing. 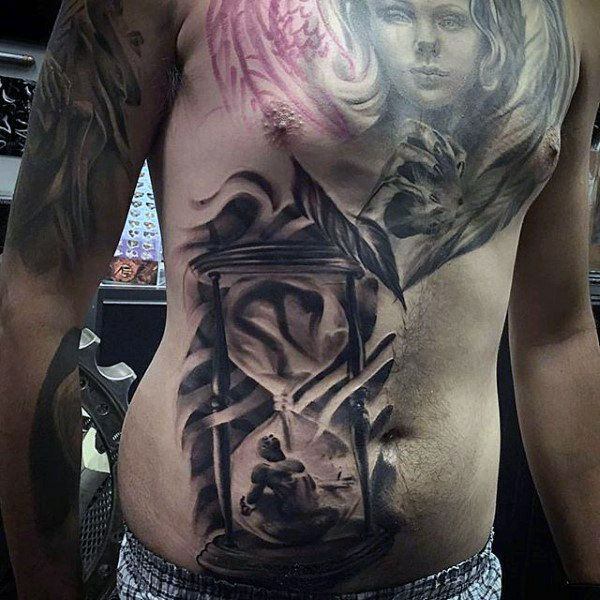 Hourglass tattoos look great when combined with several elements. 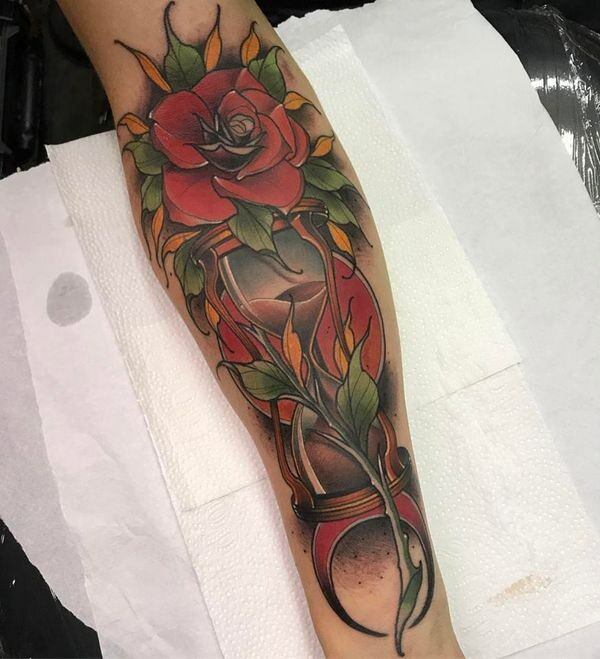 The combination of beautiful flowers and the colours used look great. 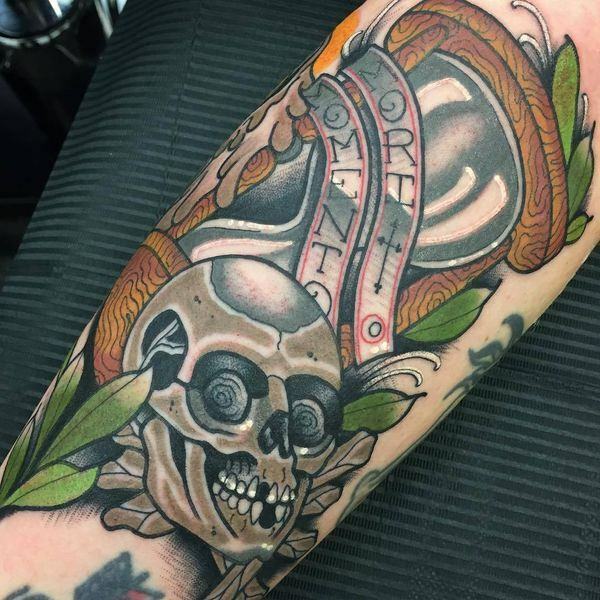 In your memory is a beautiful tattoo design that looks awesome on the wearer. 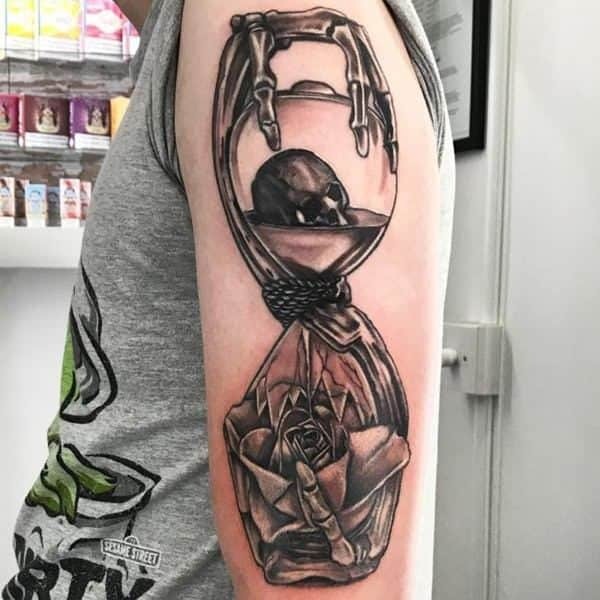 The hourglass tattoo design below is quite chilling and scary. Its an expression of boldness and a daring personality. The body complexion blends well with the dark colours used. The features look complex and magnificent. The pink flowers look spectacular with the combination of blue shades creating such an appealing outlook. 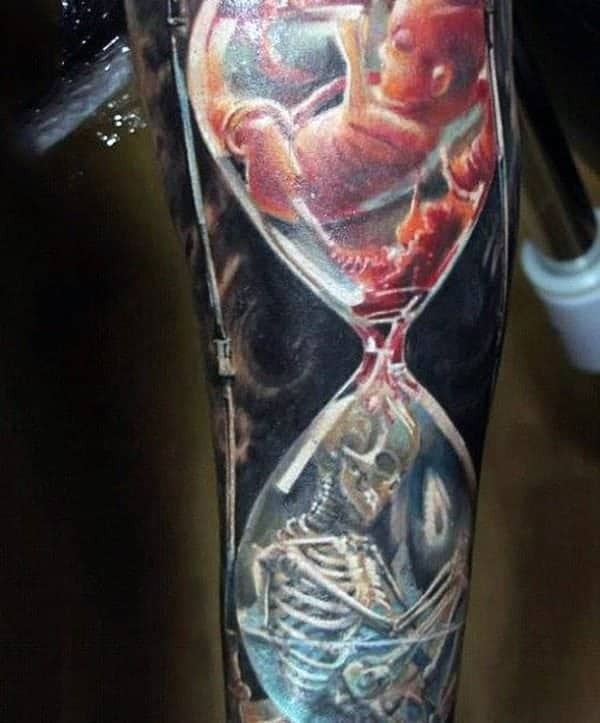 The image of a baby and the skull trapped in the hourglass design looks quite scary. However, the colours create a perfect blend. 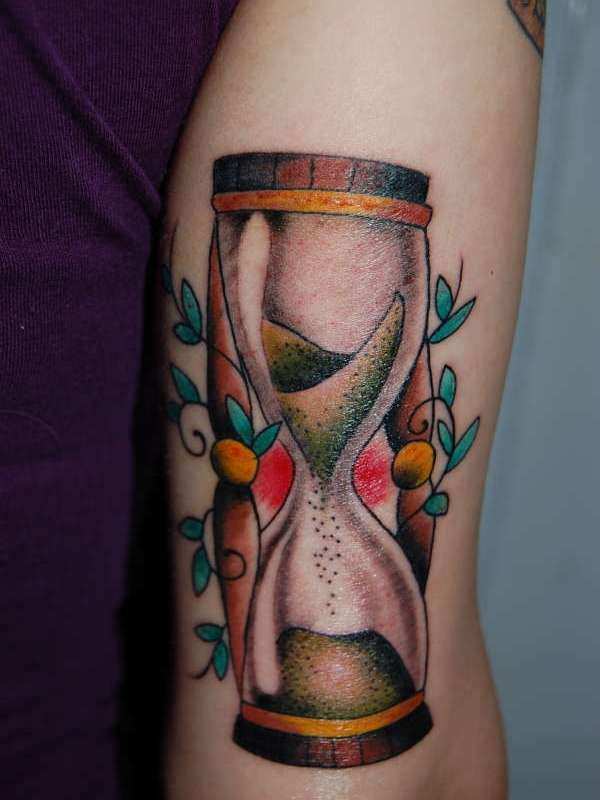 There is just a way wearing an hourglass tattoo gets to enhance one’s overall outlook which is so cute. 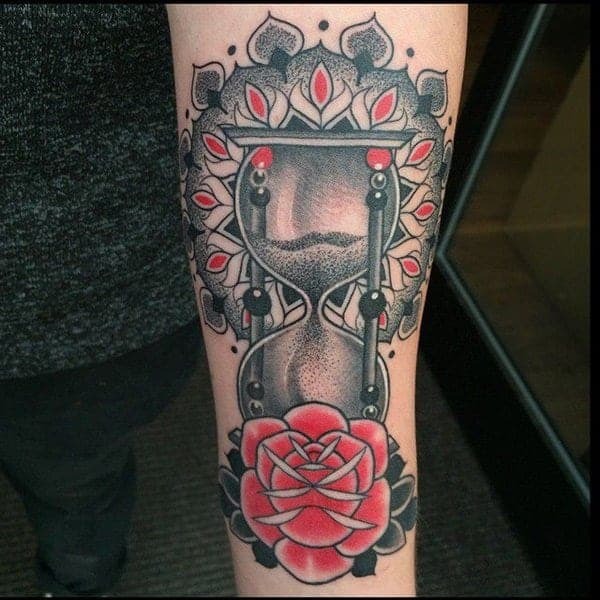 A beautiful and amazing hourglass tattoo design that looks great on the wearer. 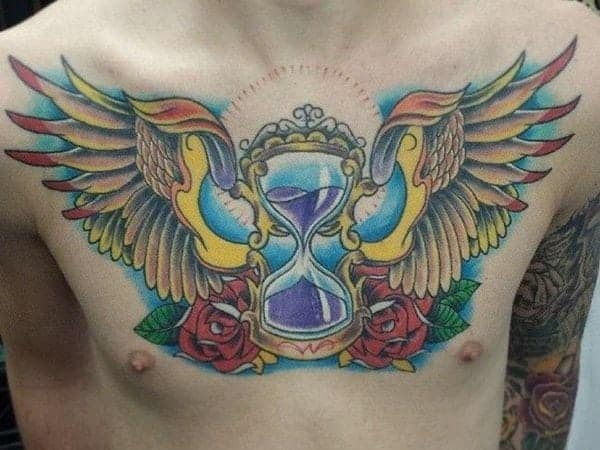 Before deciding on the type of hourglass tattoo to ink, ensure that the choice you make suits you well. 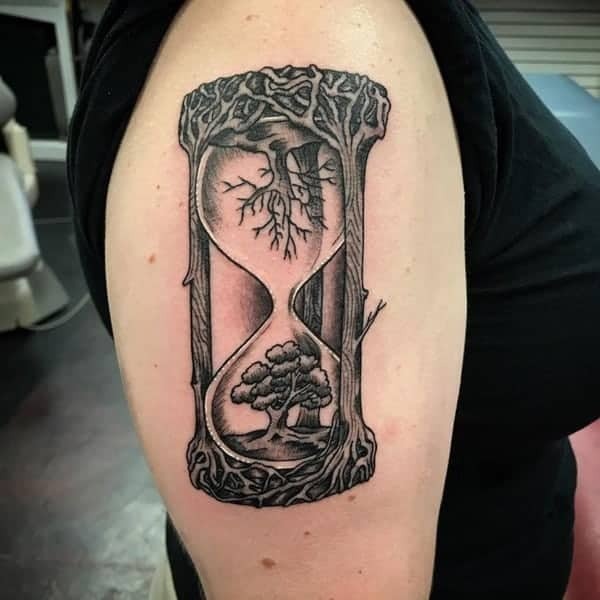 You can protect your heart with the beautiful memories that hourglass tattoo design brings. 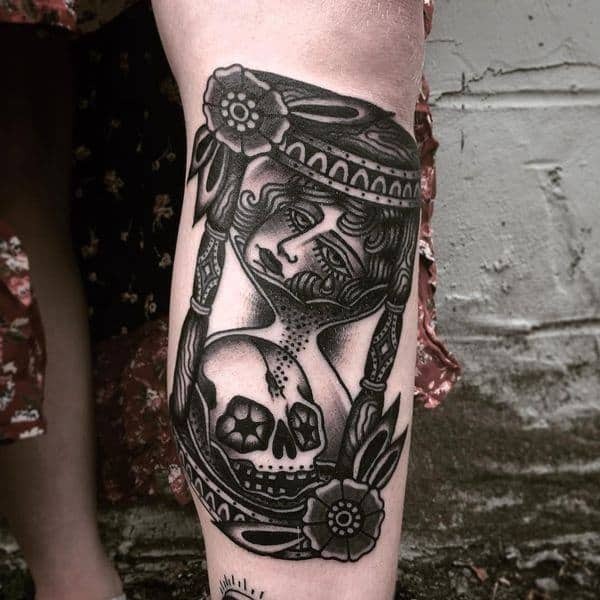 The floral tattoo has a way of communicating beauty and elegance. Flowers are great symbols and also have a way of making an entire design to really pop. 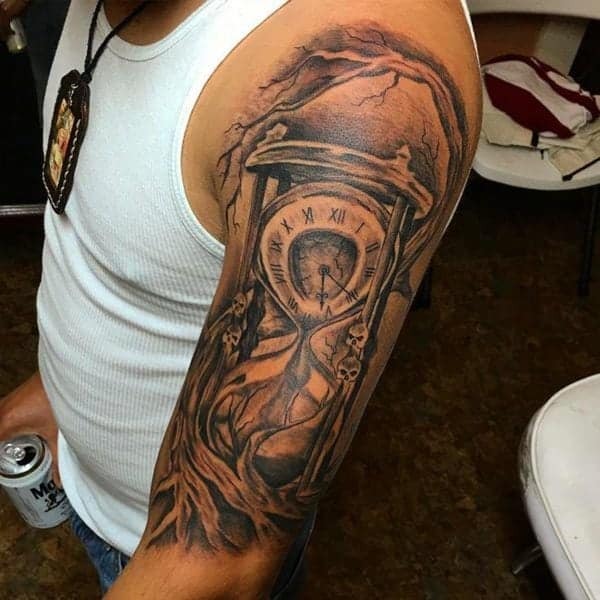 Time carries memorable moments and there’s no better way of bringing them to life than inking the tattoo. The glow expressed with the burning candle is another cool element that brings life to the design. 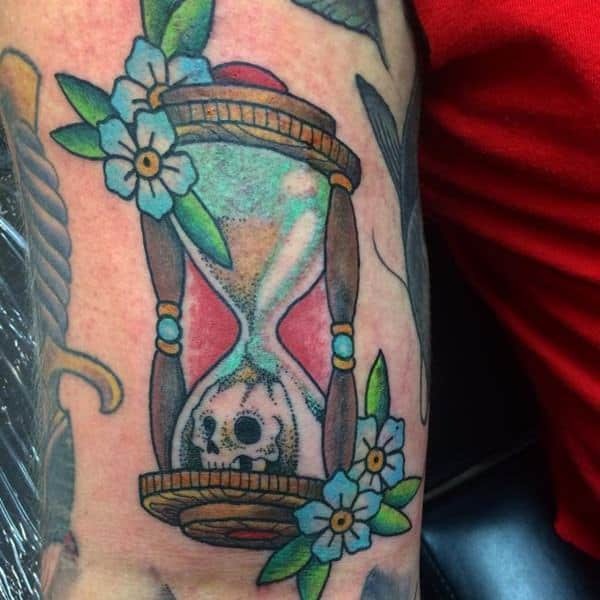 The endless cycle of life and death is a fact that’s demonstrated in the hourglass tattoo designs. The fusion of yellow layers of colour with the blue shades also creates such a captivating outlook. 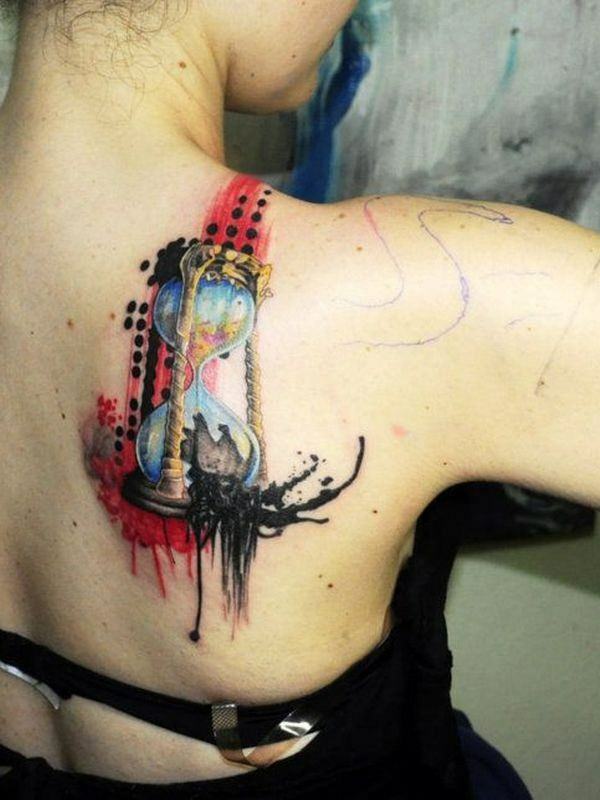 Amazing combination of hourglass tattoo and the clock. It’s another good expression that time is passing and should be valued. The combination of different colour shades makes the entire design to be so appealing. 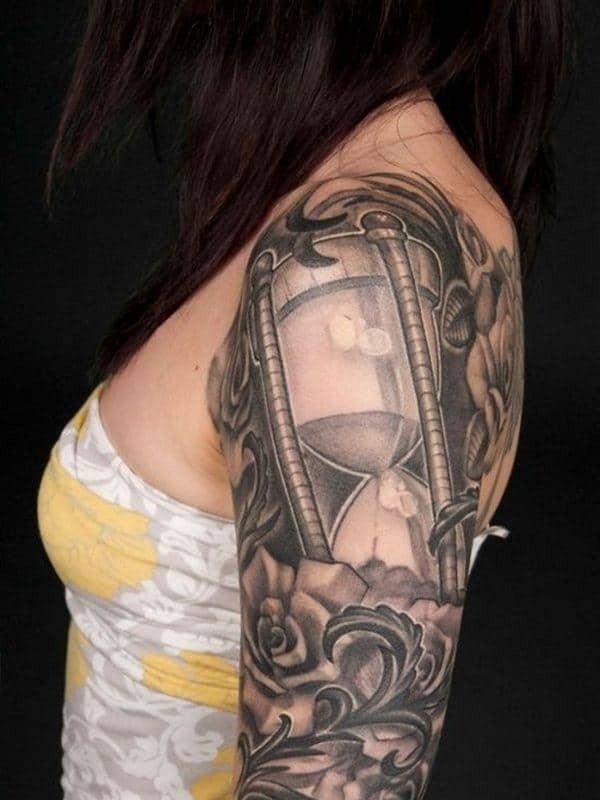 Placement of hourglass tattoo on the arm is another way of enhancing the designs visual appeal. 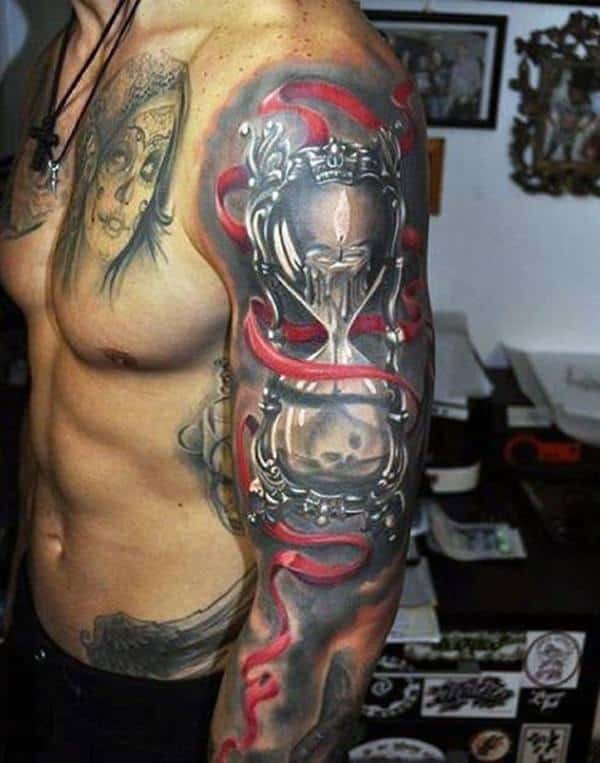 Wearing the skull element of hourglass tattoo is an expression of death and the ultimate end of it all. 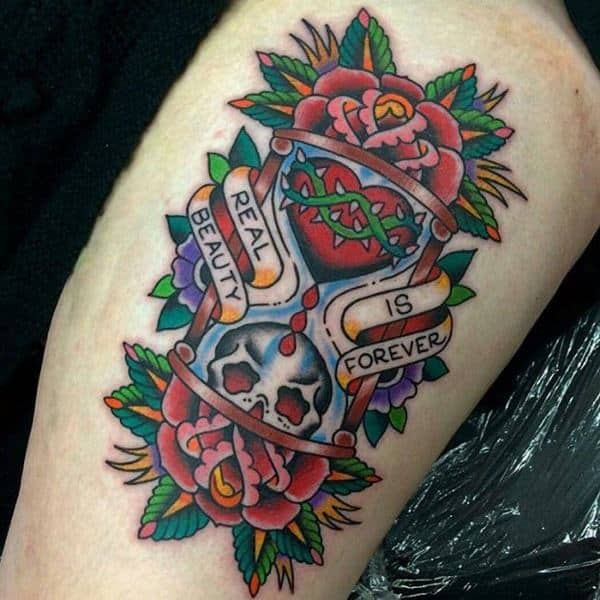 The tattoo design below symbolizes beauty and elegance which makes it worth trying out. 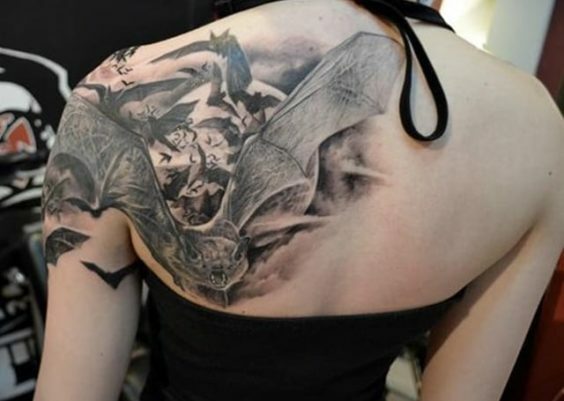 Dark shades have a way of enhancing the beauty and elegance of hourglass tattoos. 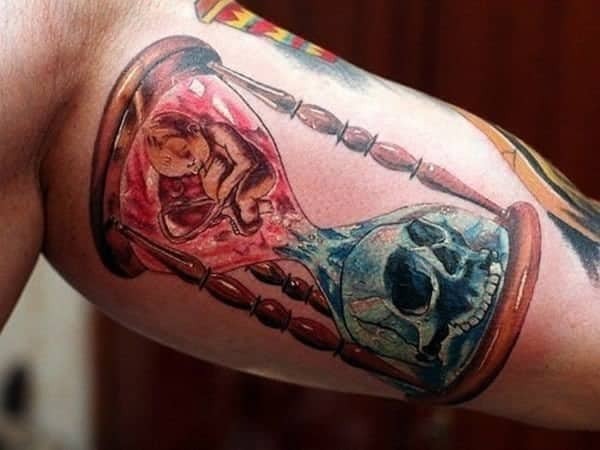 The sight of a baby trapped in the hourglass tattoo design below expresses diverse feelings. It may also act as a reminder of some memorable time to the wearer. Red and black shades are known to blend so well. 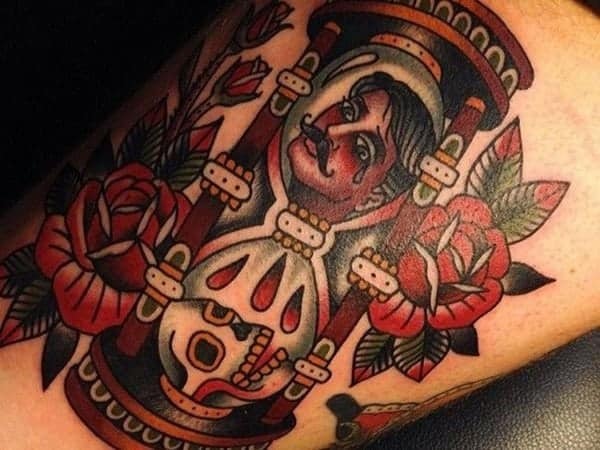 The red shades with rose flower used in the design look so cute on the arm. Amazing design with features that add to the beauty and elegance of the design. 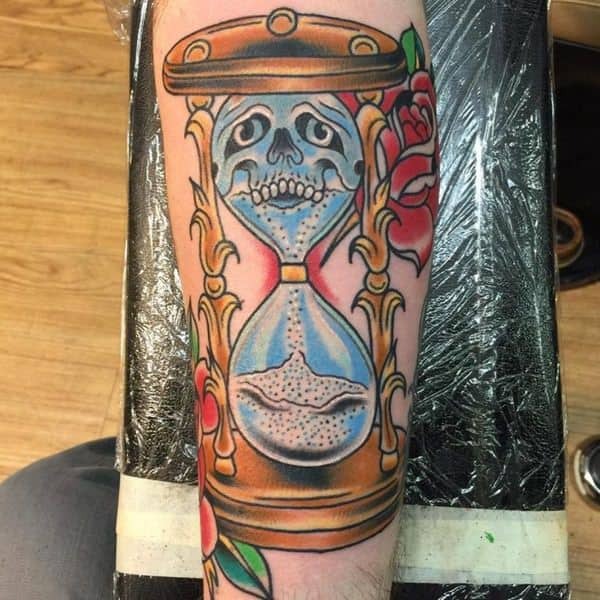 The floral symbols and the dripping waters in the hourglass tattoo almost act as a goo reminder of sea life. 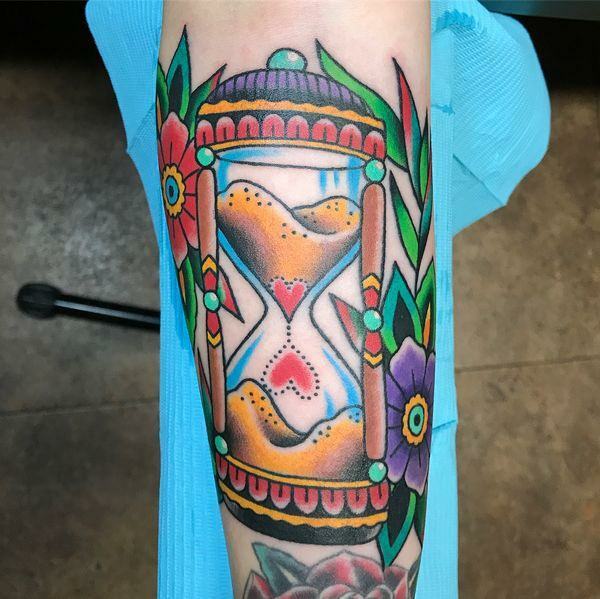 Bring life to your hourglass tattoo design with bold shades. The predominant use of colour black makes the design to be quite outstanding. 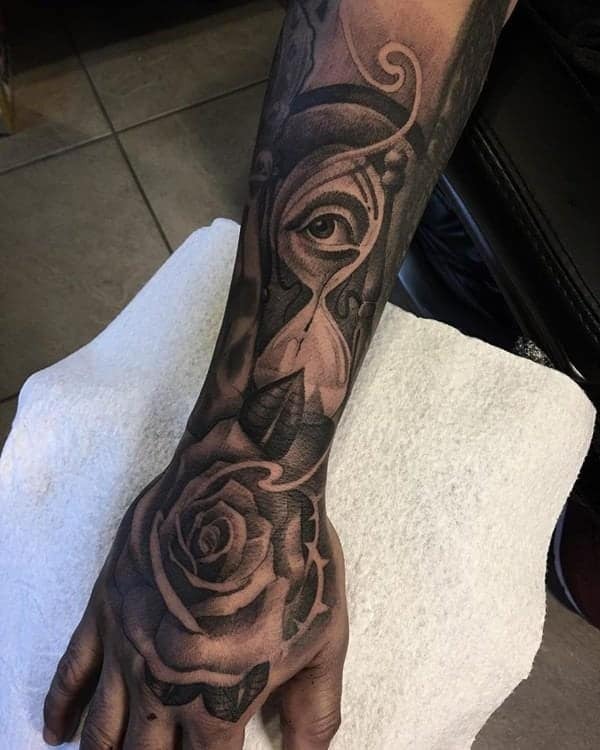 The dark layers looks great with brownish shades and also adds to the complexity of the design. 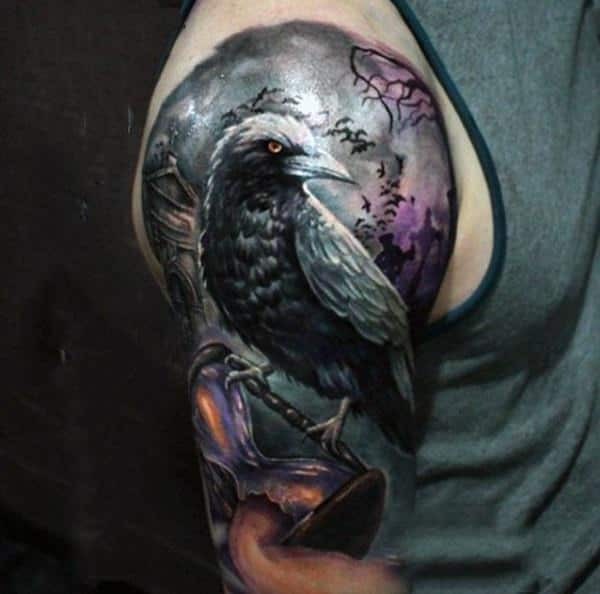 Amazing design with beautiful shades of dark and grey that are worth trying. 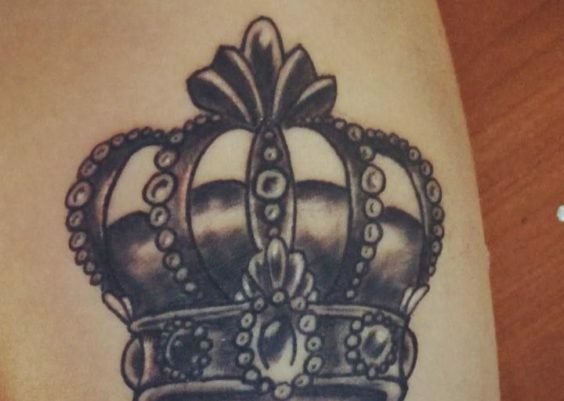 Besides that, it also fits well on the arm where it’s worn. The inclusion of shadowy a layer is another thing that makes the design to pop. 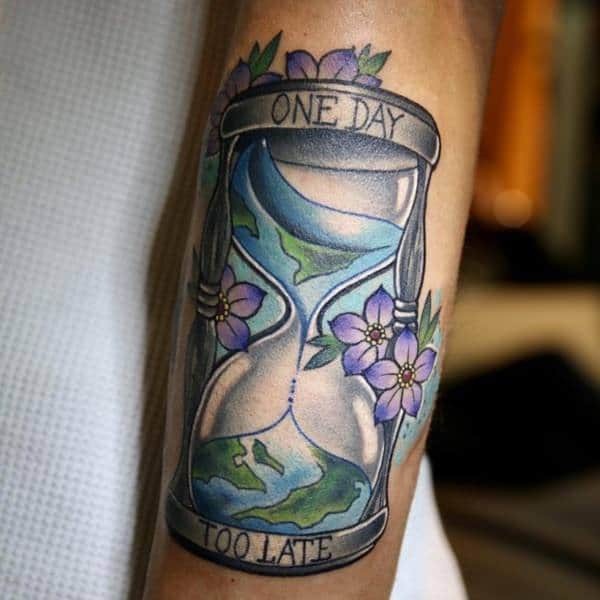 The 3d tattoo design below looks fabulous and beautifully enhances the overall outlook. The fusion of both grey and dark colours also adds to the intricacy of the design. There’s a time expression that acts more like an assurance to the wearer of an important issue. The bold choice of colours and elements is adorable. 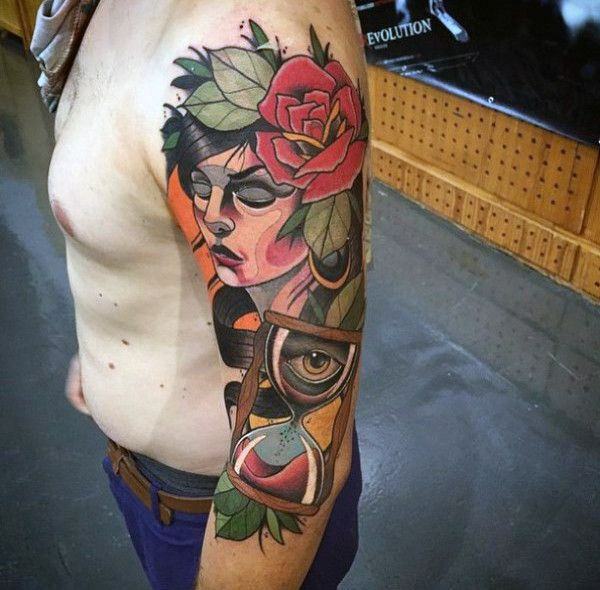 Amazing tattoo design with appealing elements that are quite eye-catching. 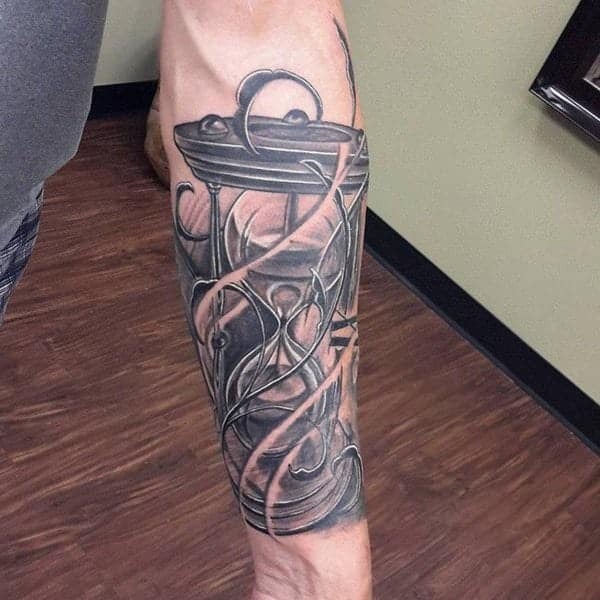 Most importantly, it fits well on the arm where it’s worn. 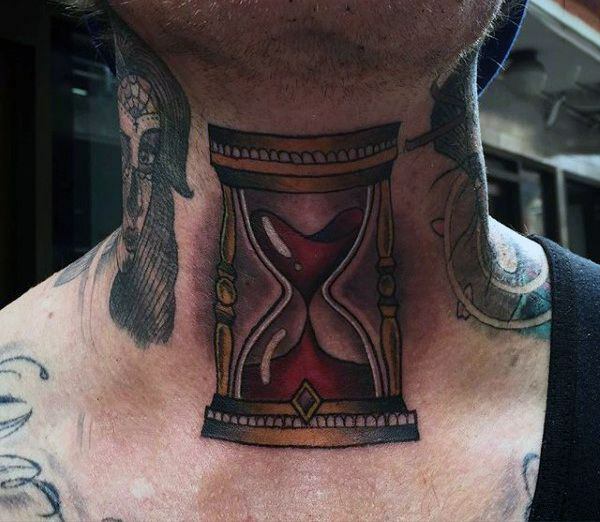 Covering the neck and upper parts of the body with hourglass tattoos is not for the feeble- hearted. From the choice of elements to the colours used, everything blends perfectly well.